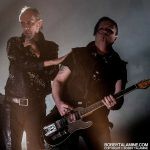 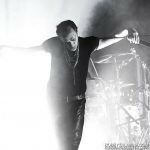 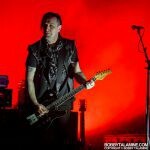 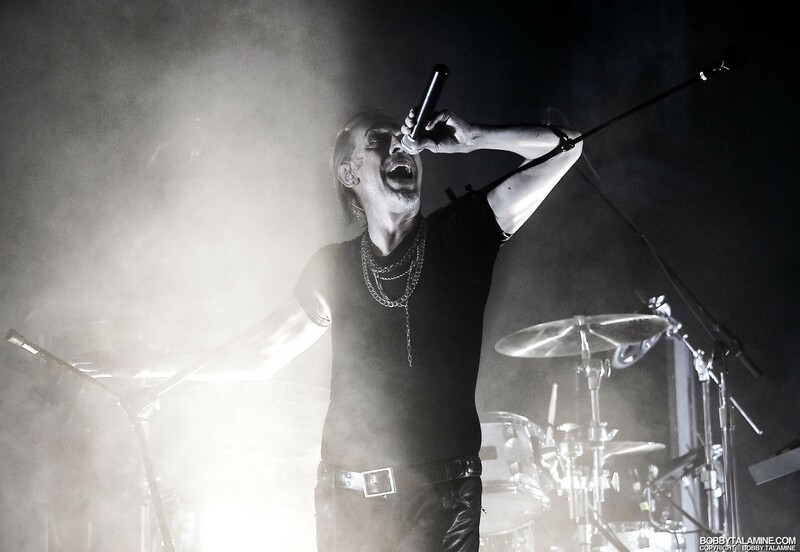 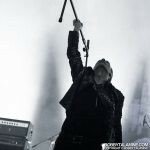 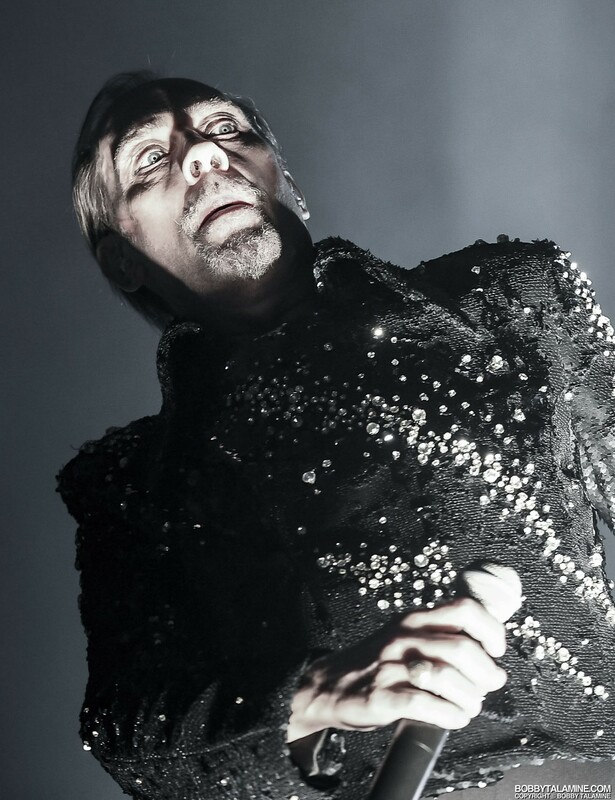 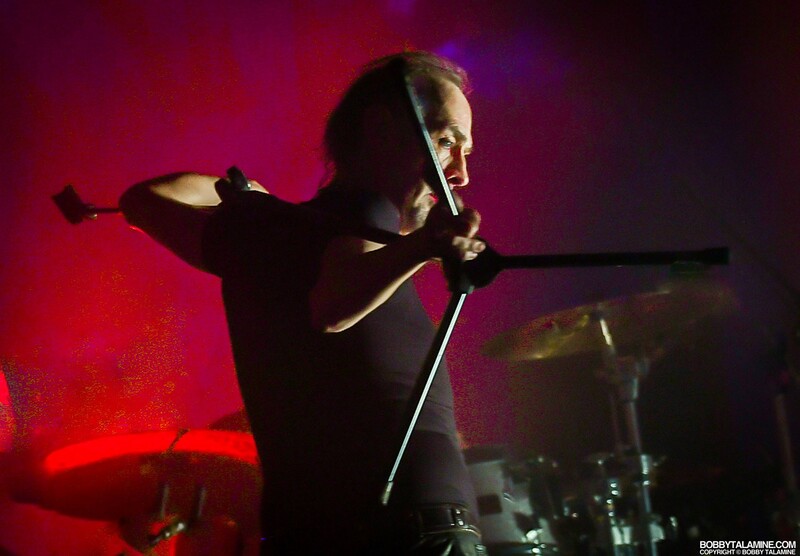 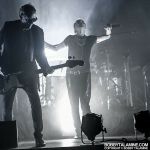 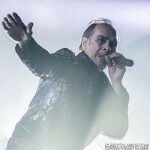 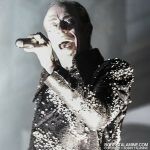 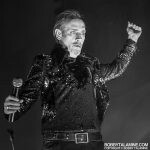 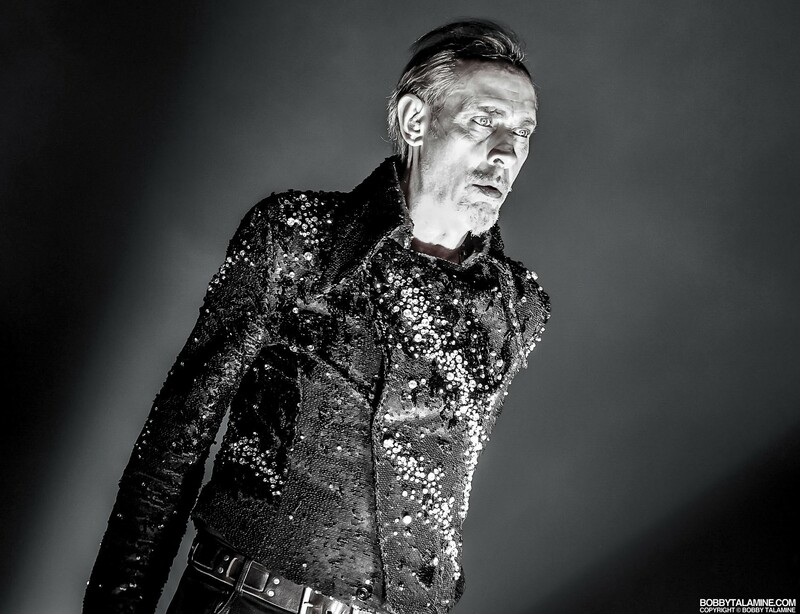 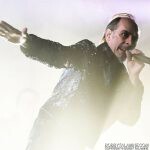 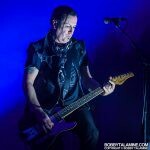 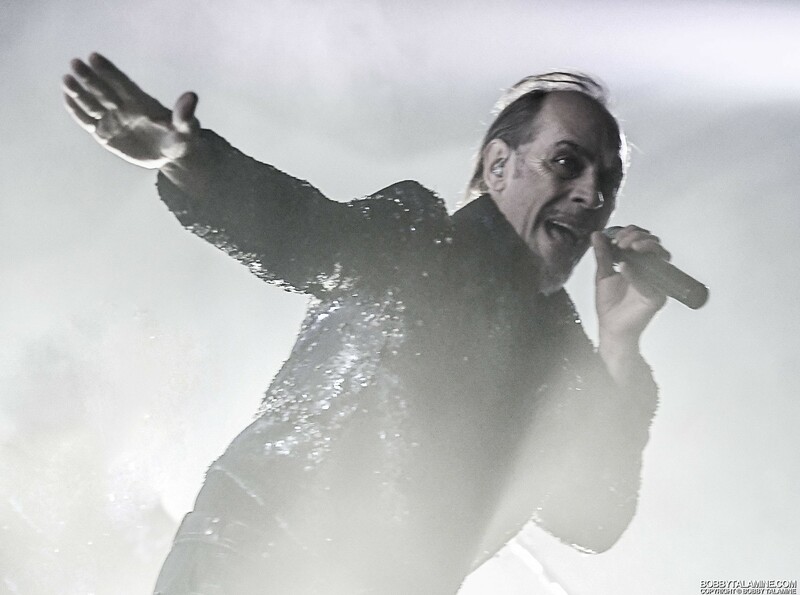 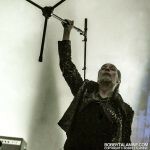 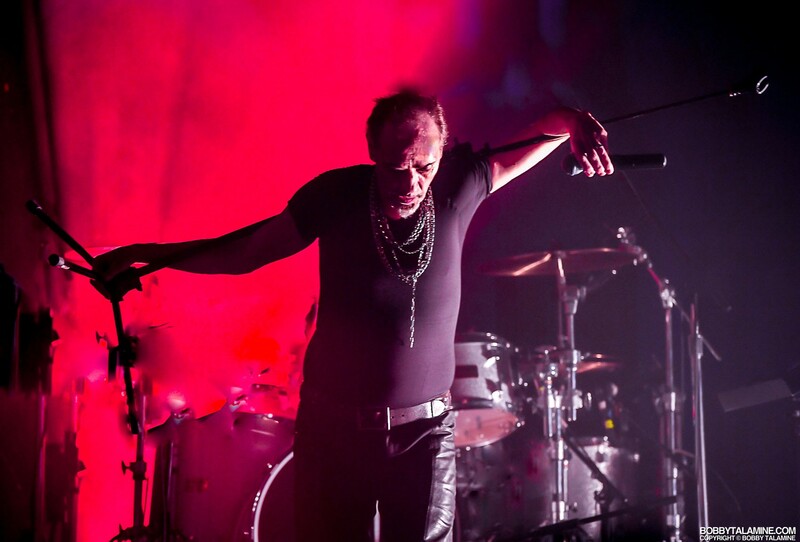 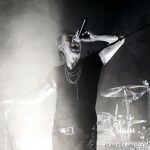 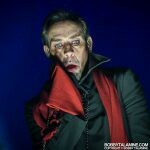 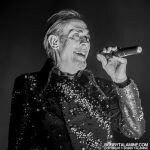 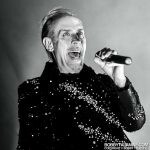 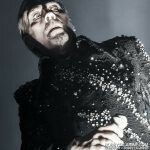 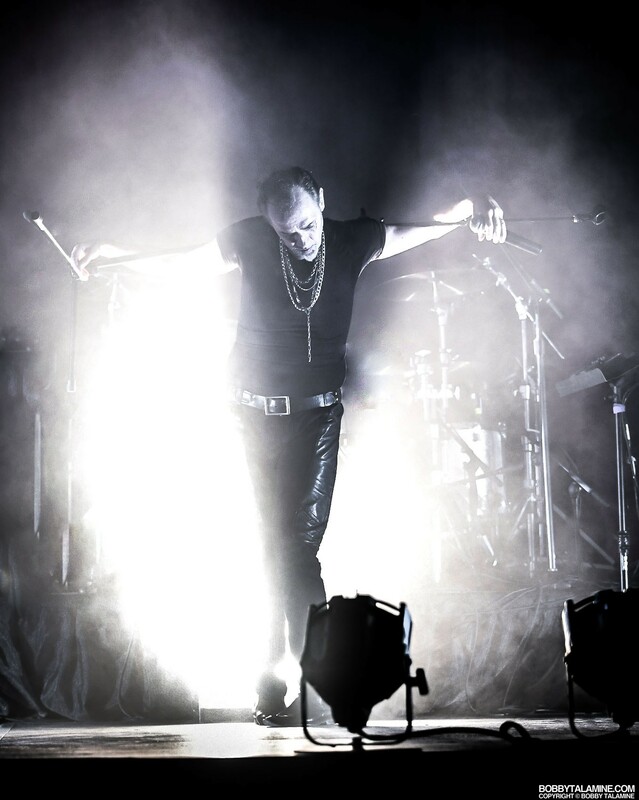 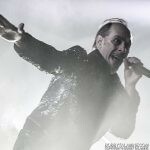 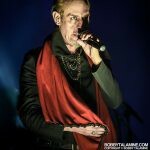 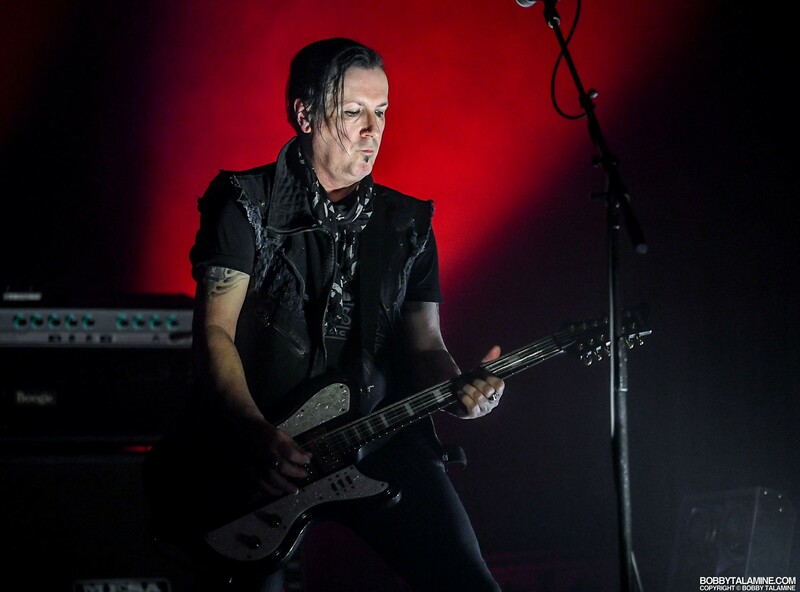 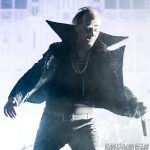 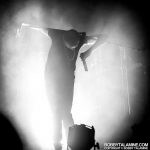 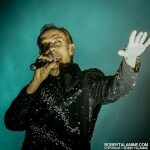 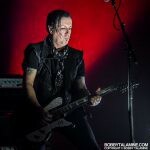 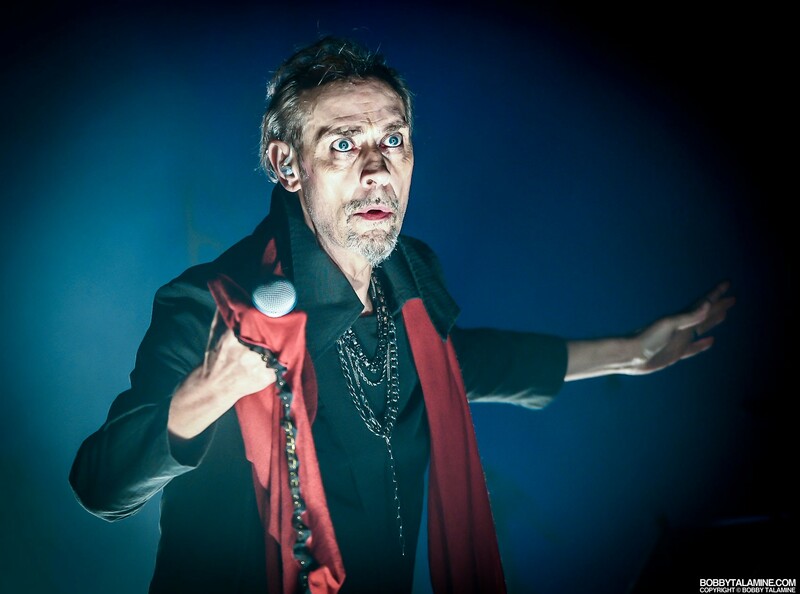 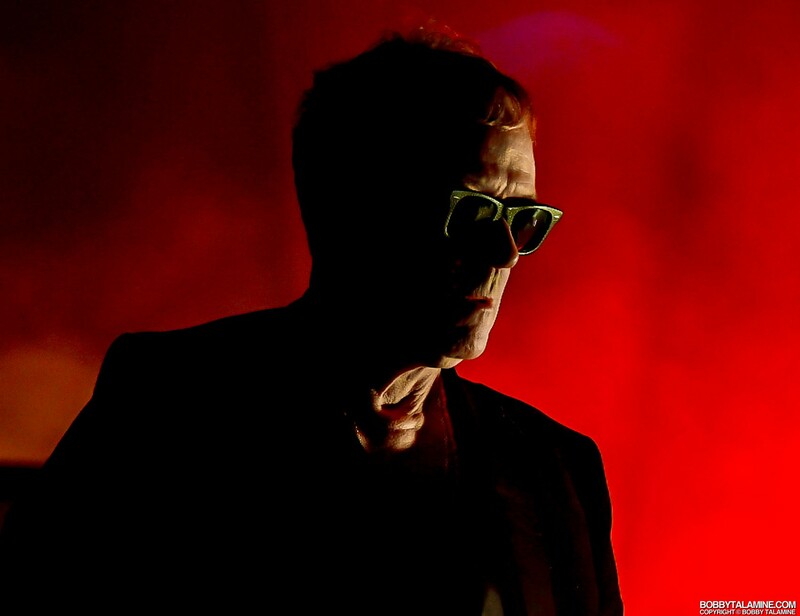 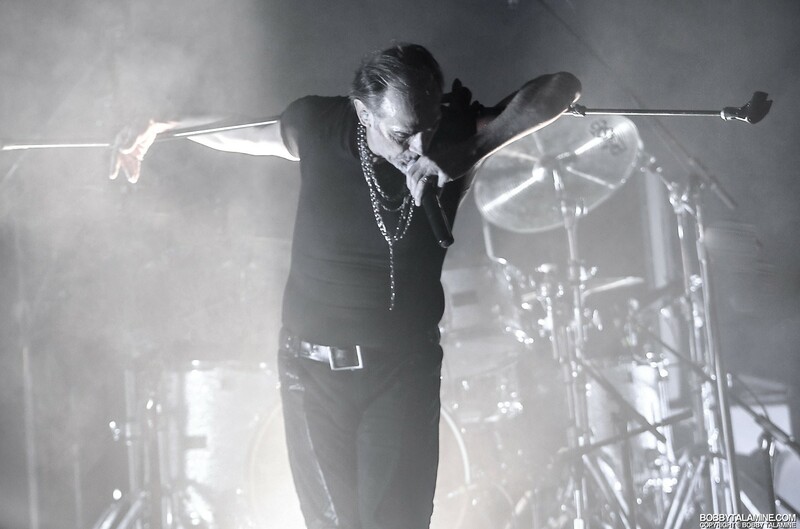 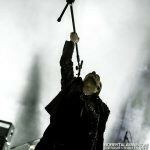 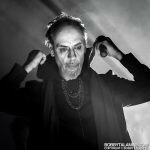 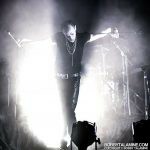 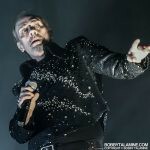 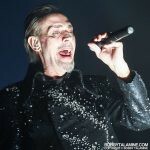 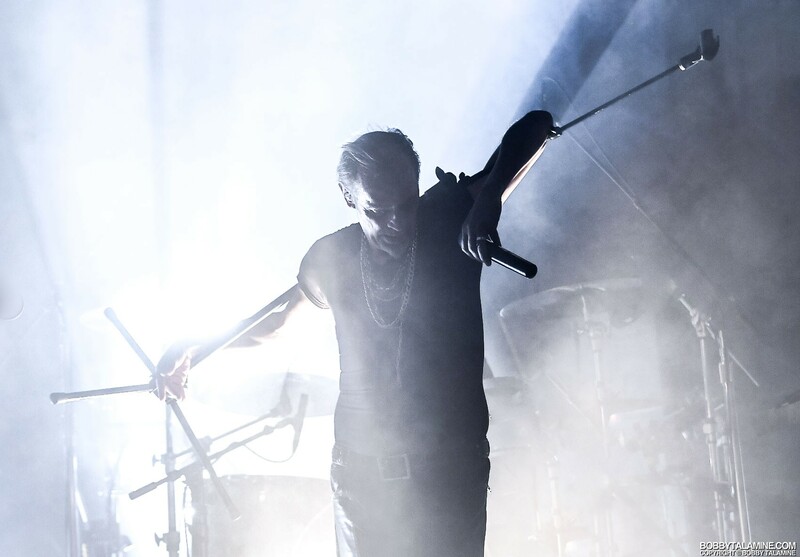 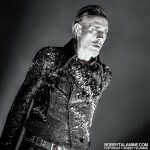 Formed in 1978, The legendary and massively influential Bauhaus hailed from the dead end nowhere’s ville (as Peter Murphy likes to define it) Northampton England, and is comprised of Peter Murphy, Daniel Ash, David J, and Kevin Haskins. 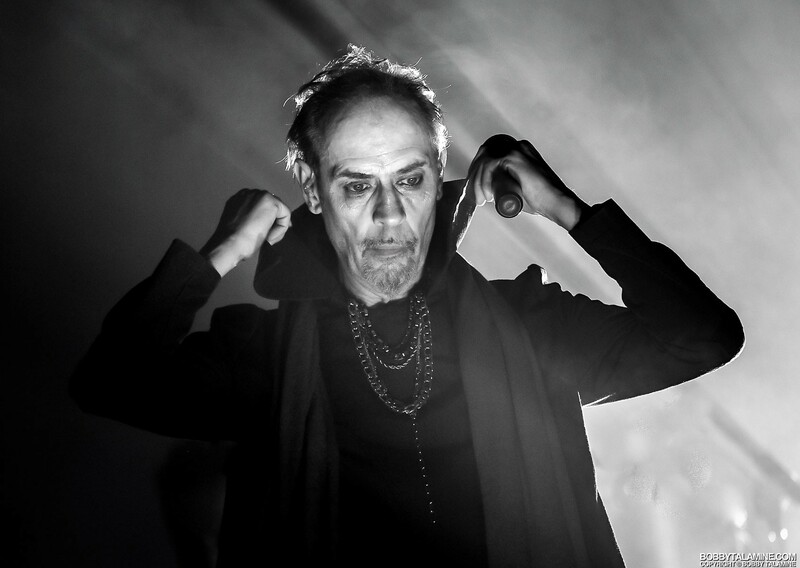 The dark, moody, dramatic music that they made possessed far more force, grit, variety, and joyfulness than the “founding fathers of goth” tag that has been attached to them to the present day. 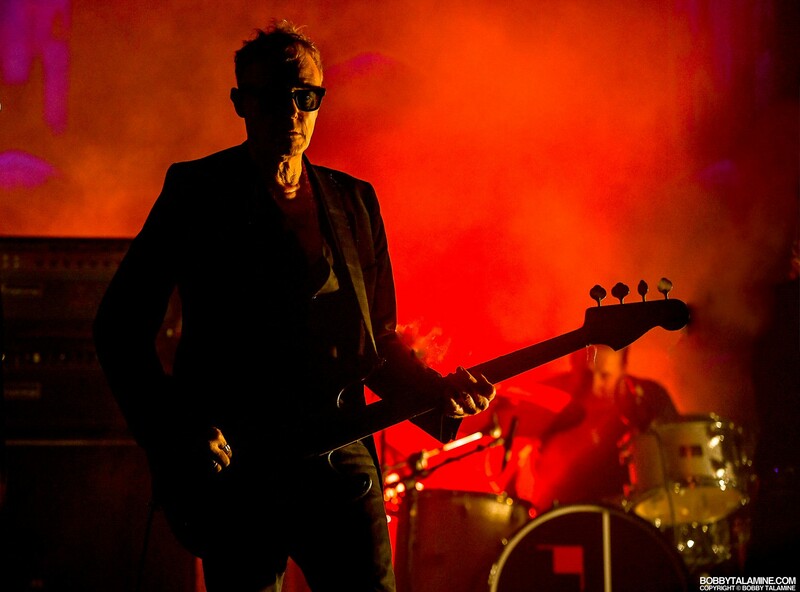 In The Flat Field is the band’s debut studio album, released on 4AD Records and considered to be one of the very first “goth” albums. 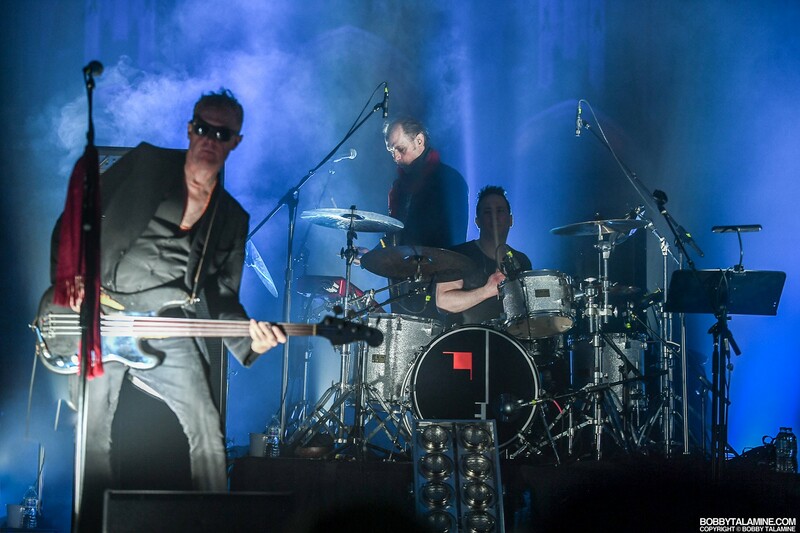 From the bleak outlook of life in Northampton, what we get in return is the brilliance of all things Bauhaus. 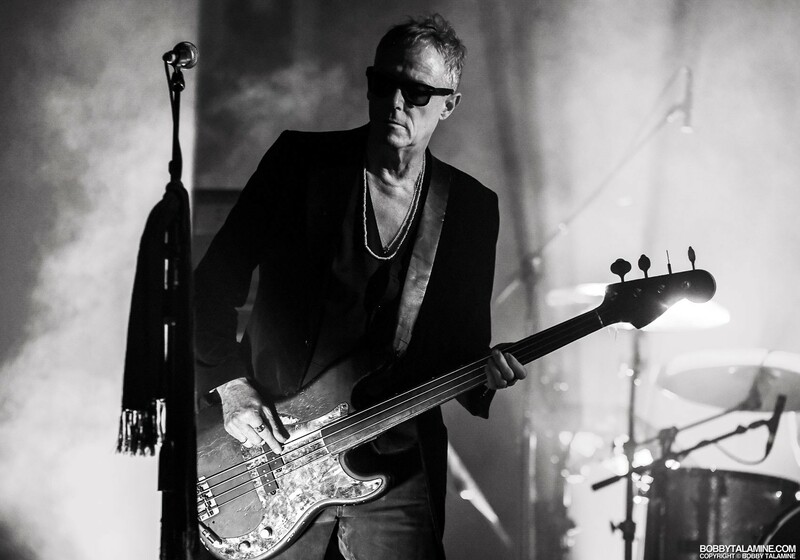 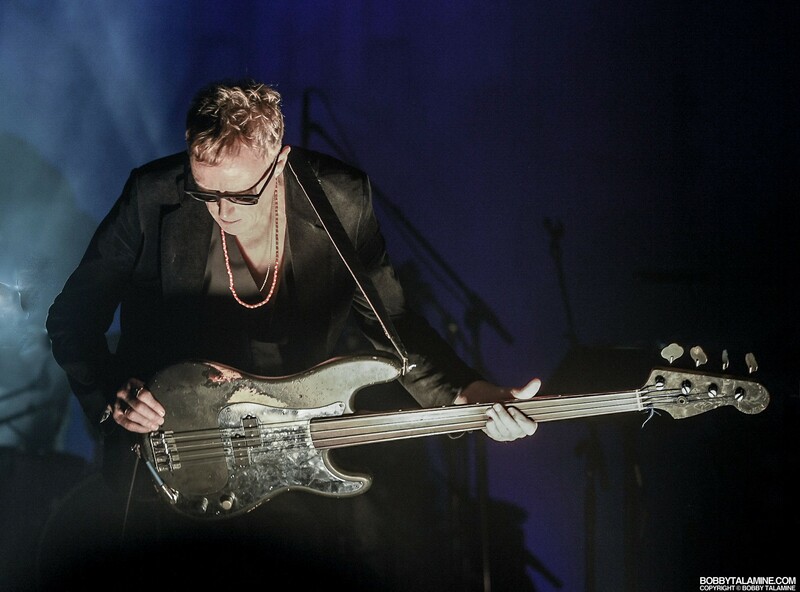 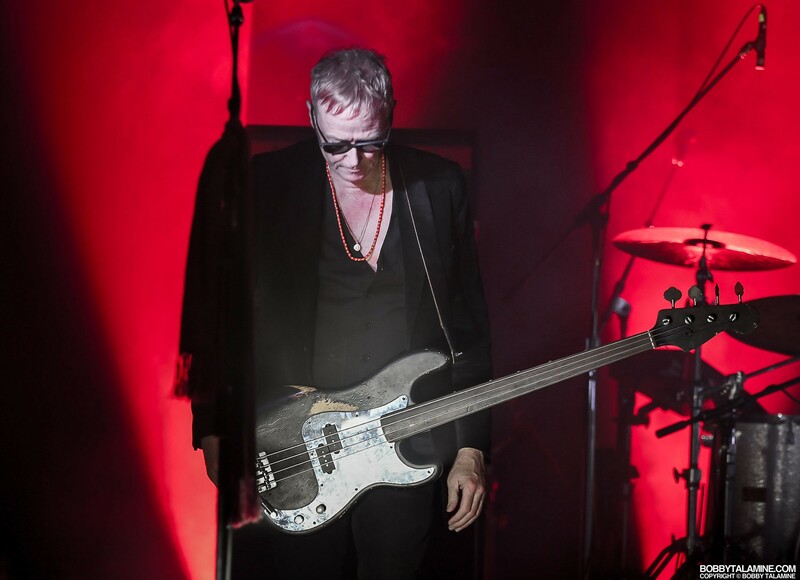 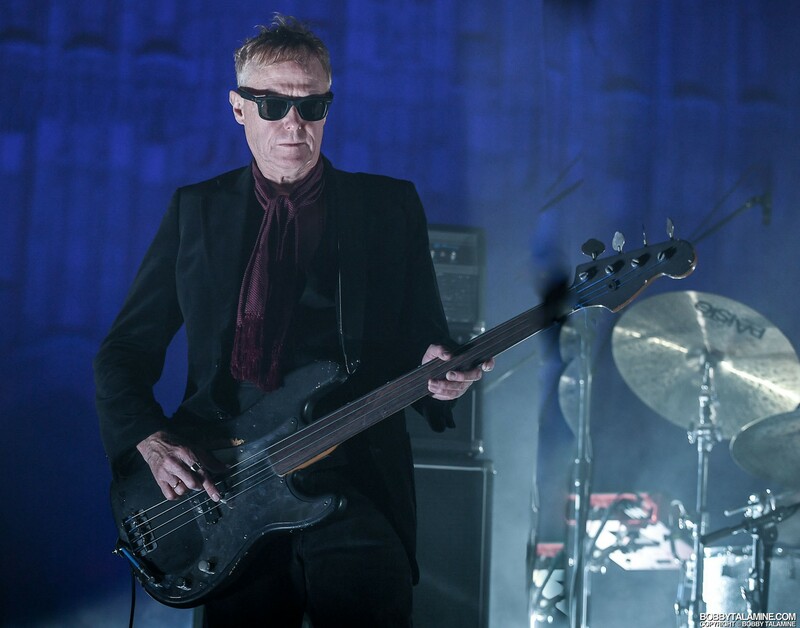 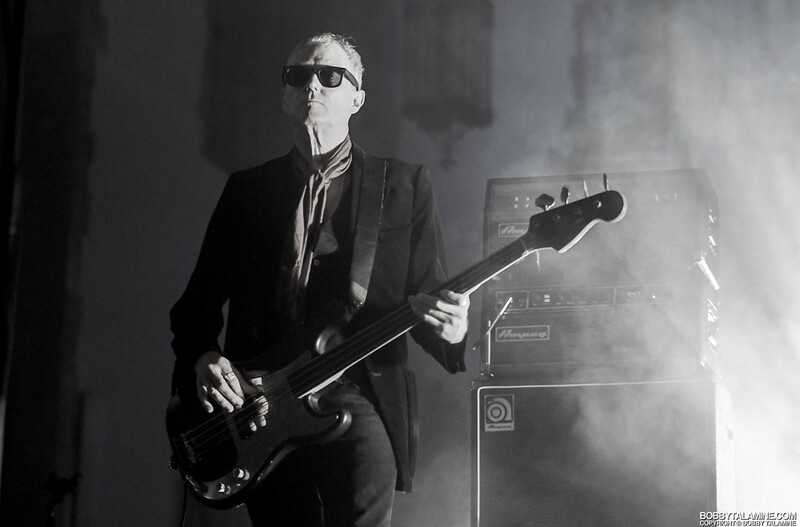 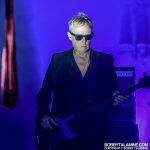 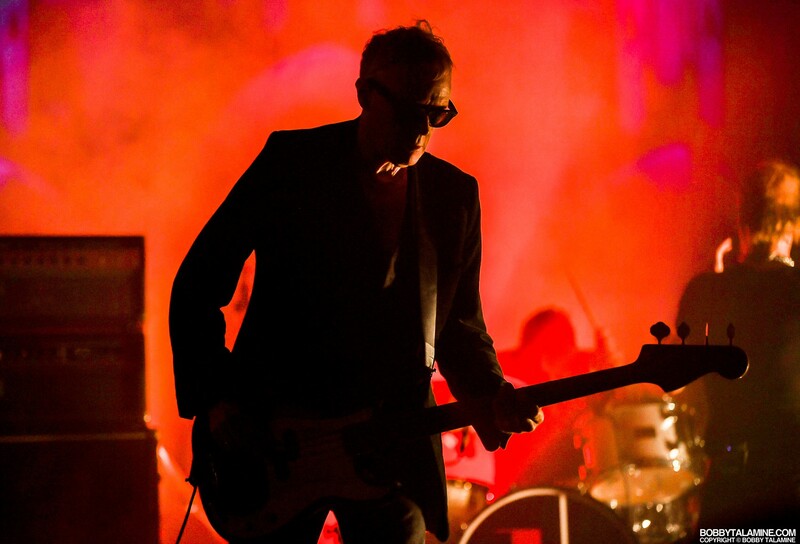 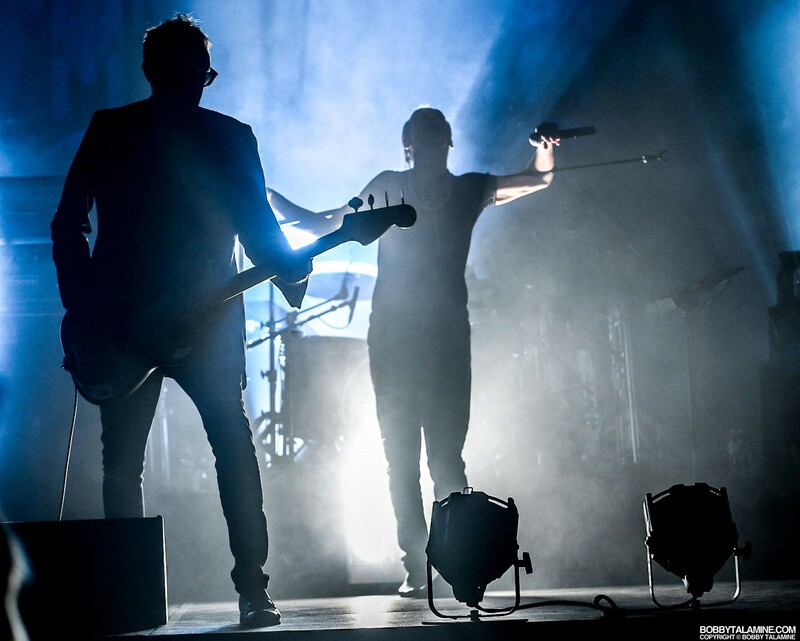 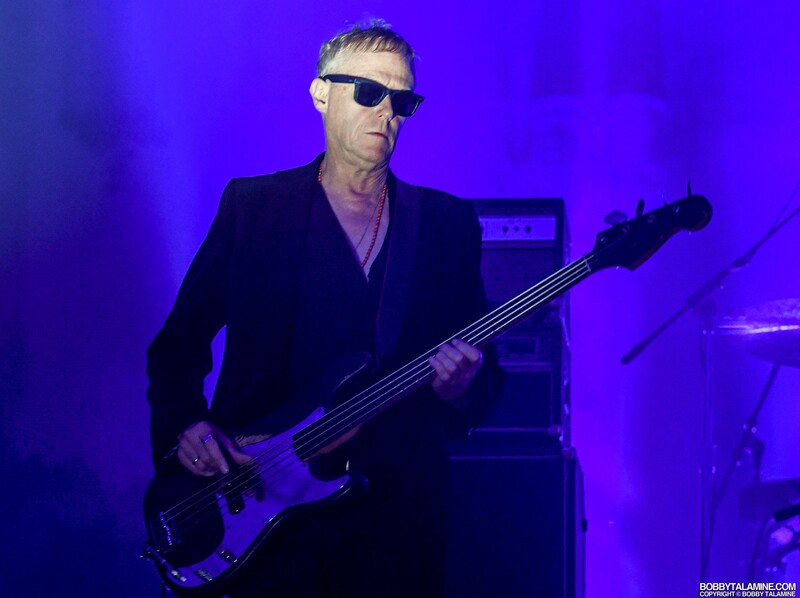 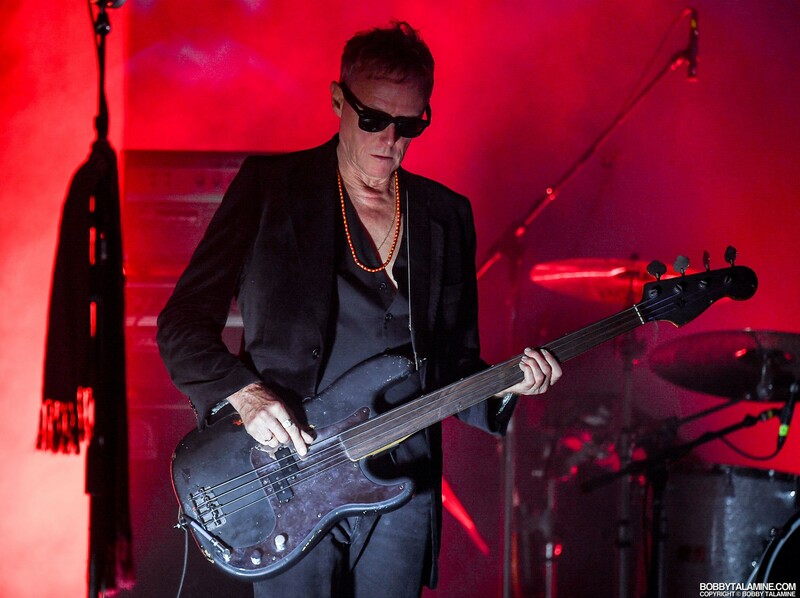 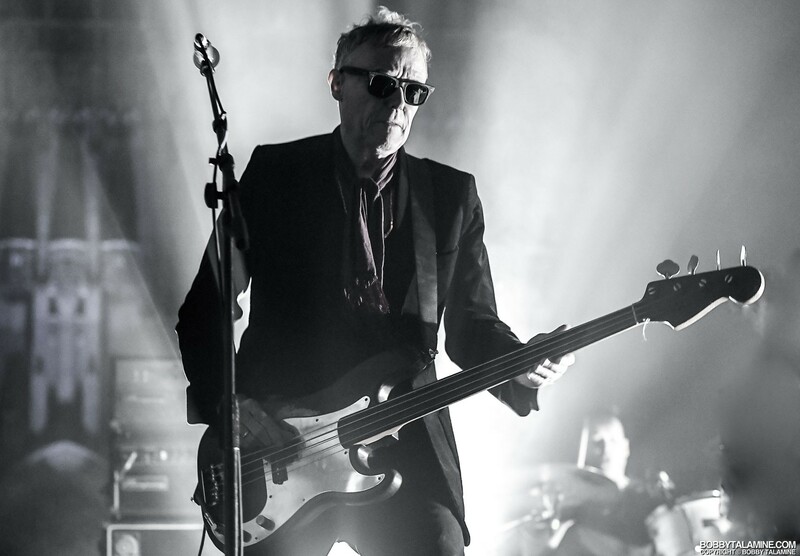 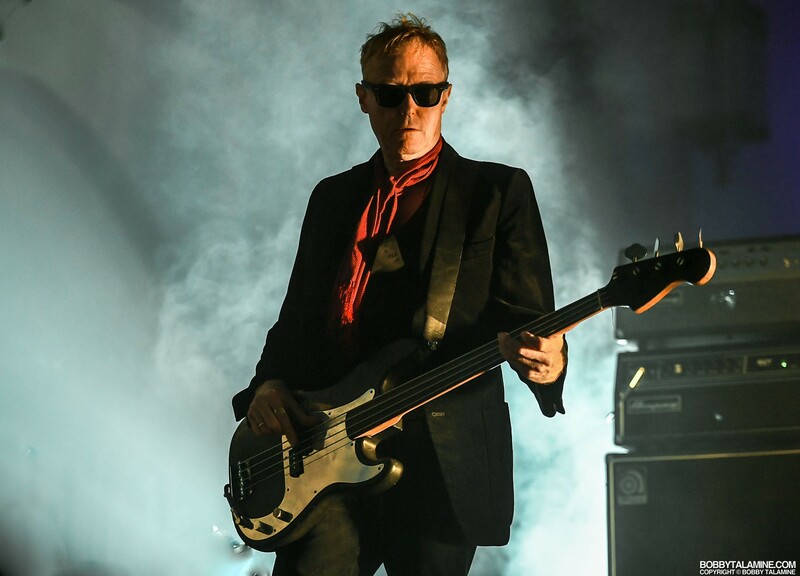 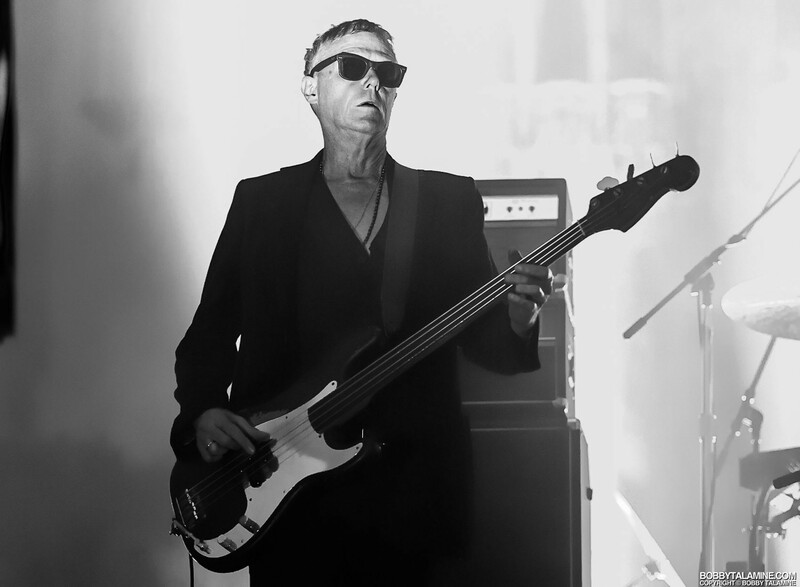 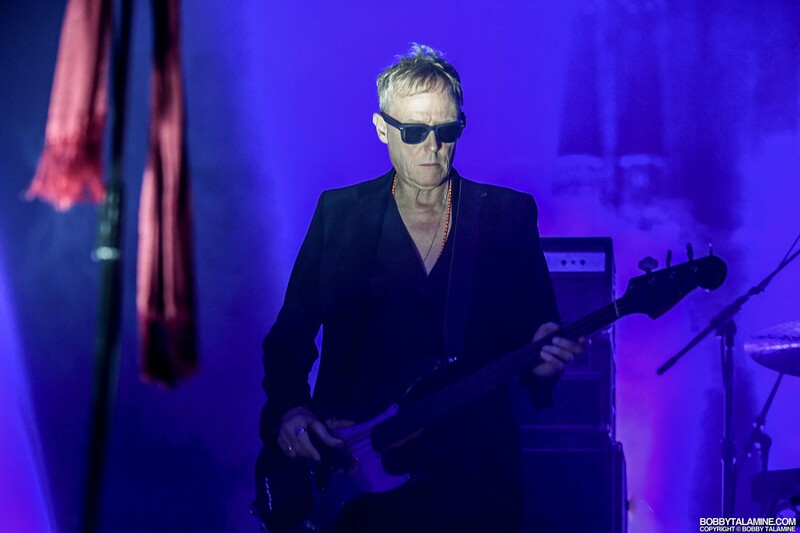 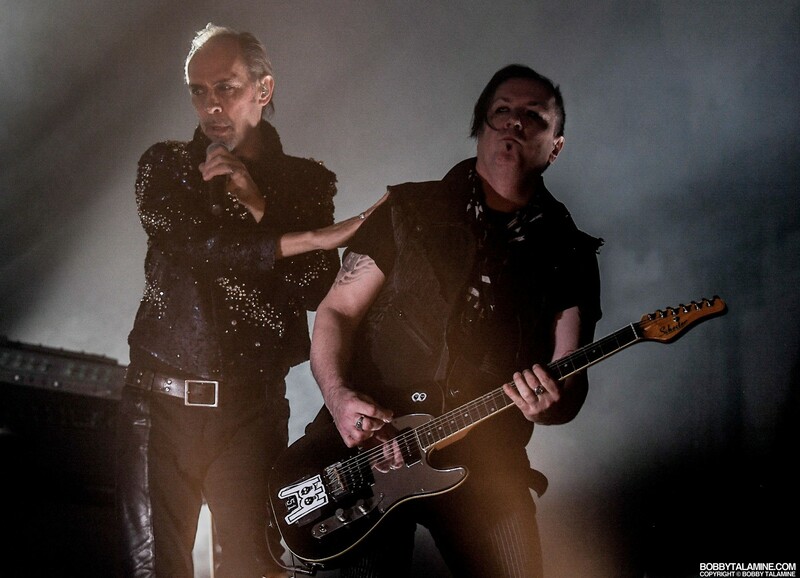 And to have two founding members of Bauhaus together on this current tour celebrating the release of In The Flat Field, and playing the album in its entirety, followed by a slew of precious Bauhaus tracks, makes this a most compelling live performance without question. 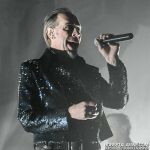 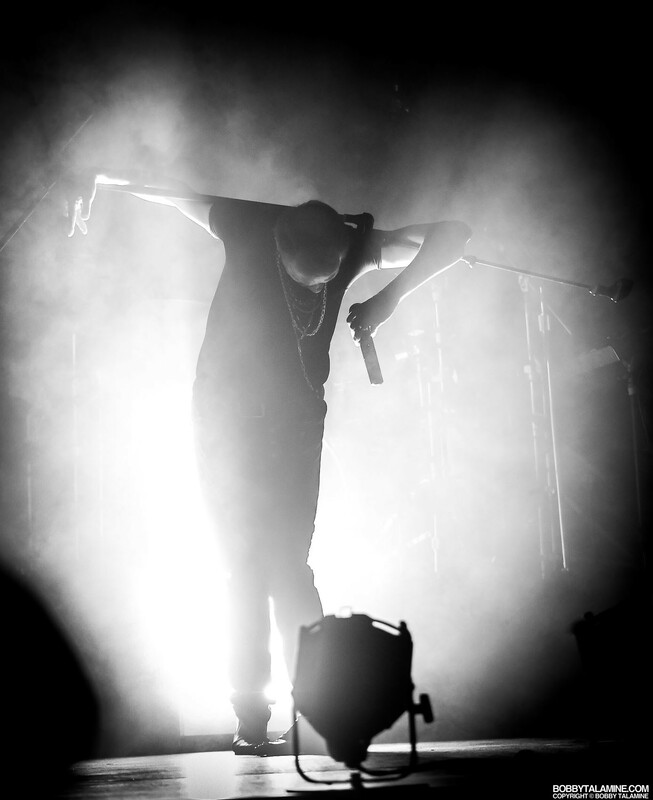 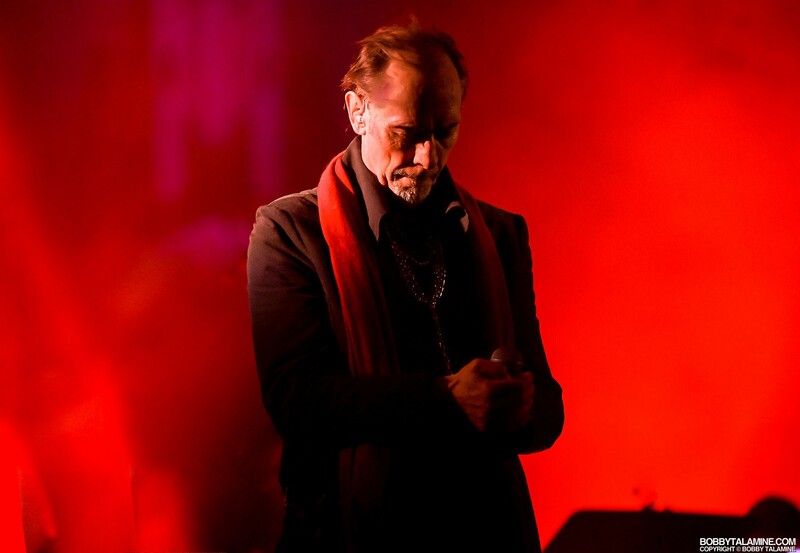 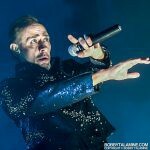 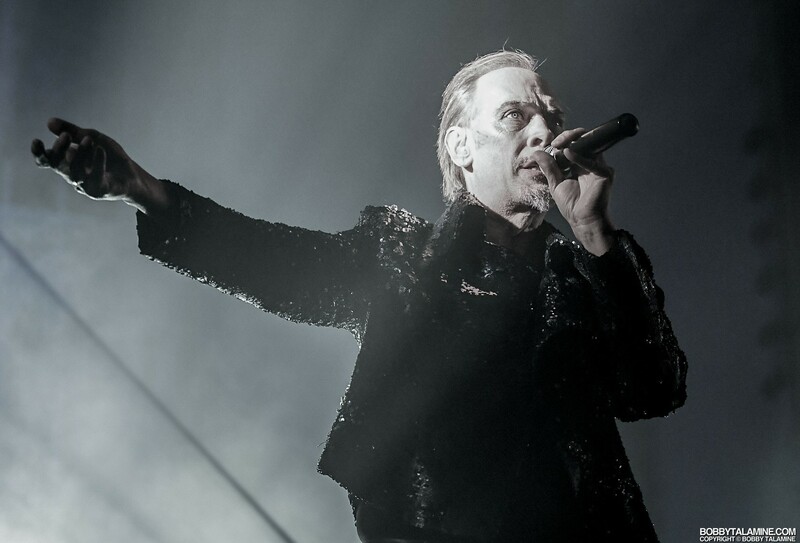 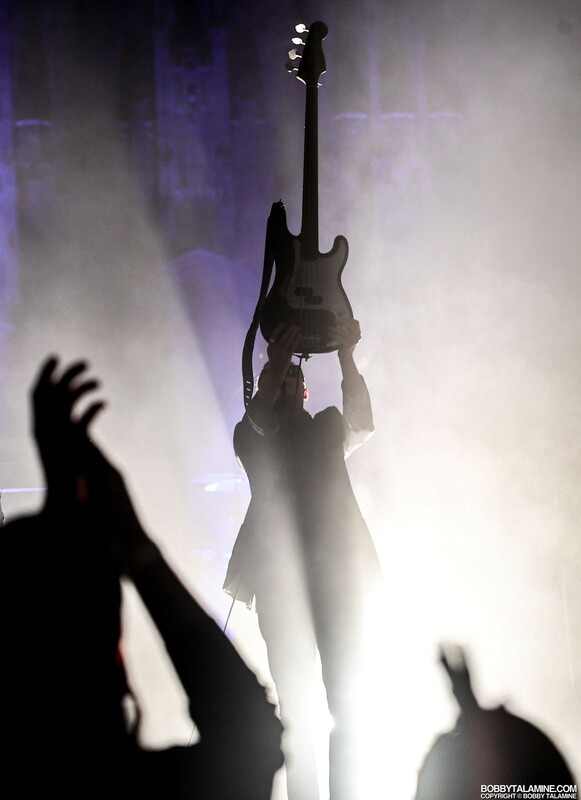 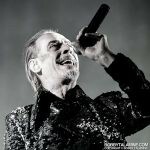 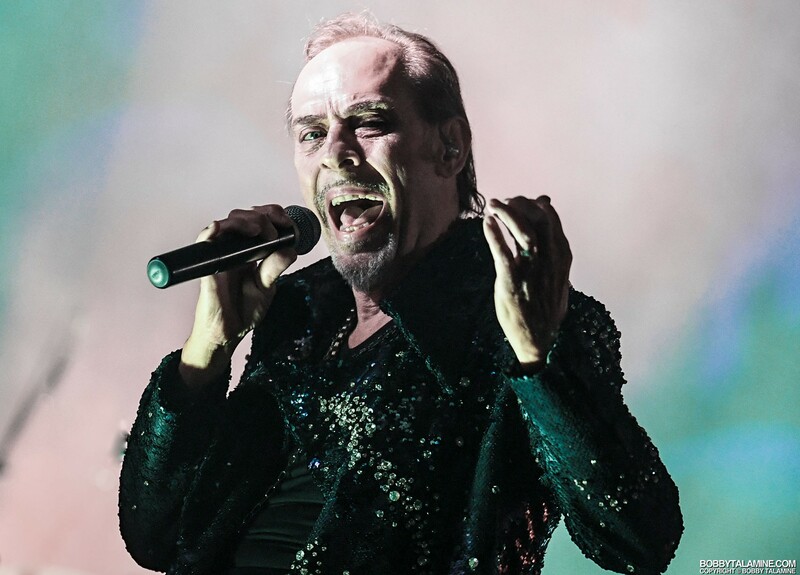 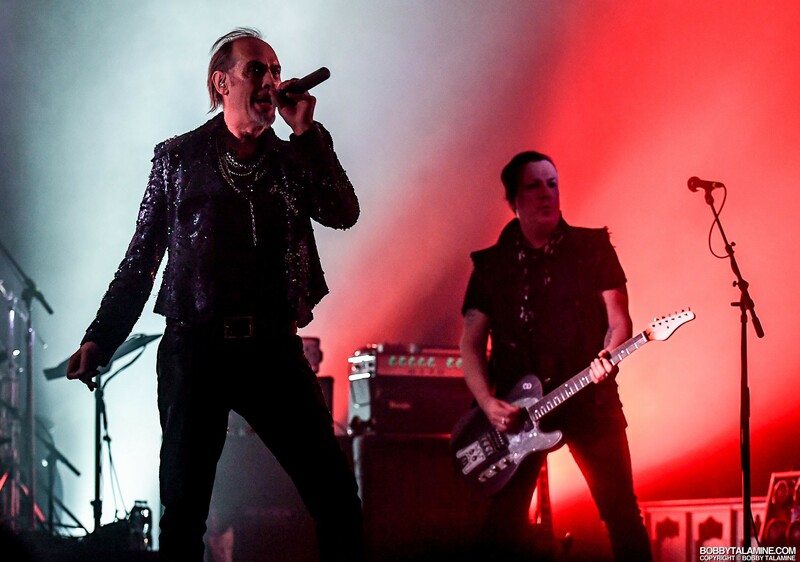 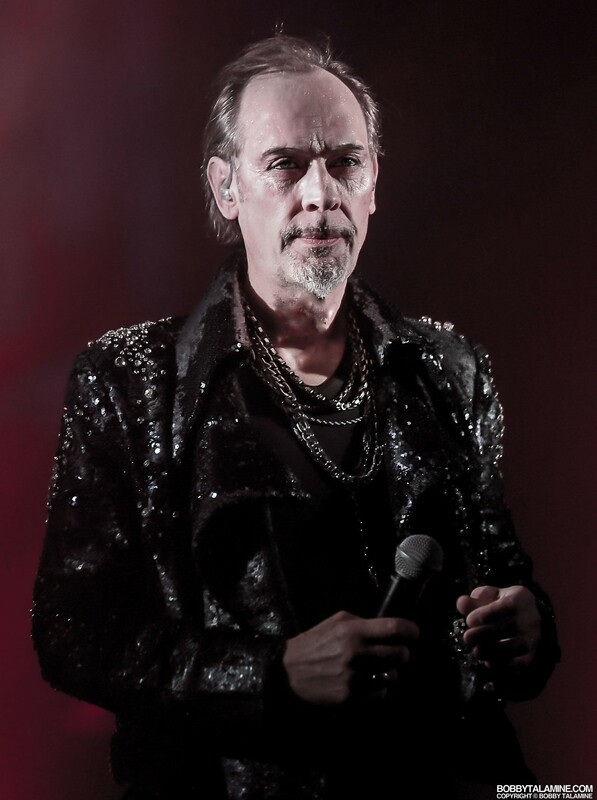 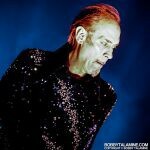 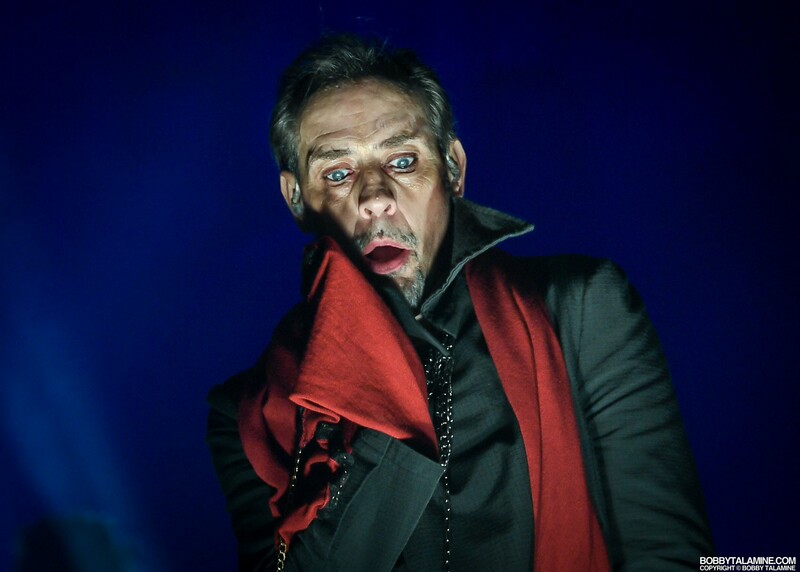 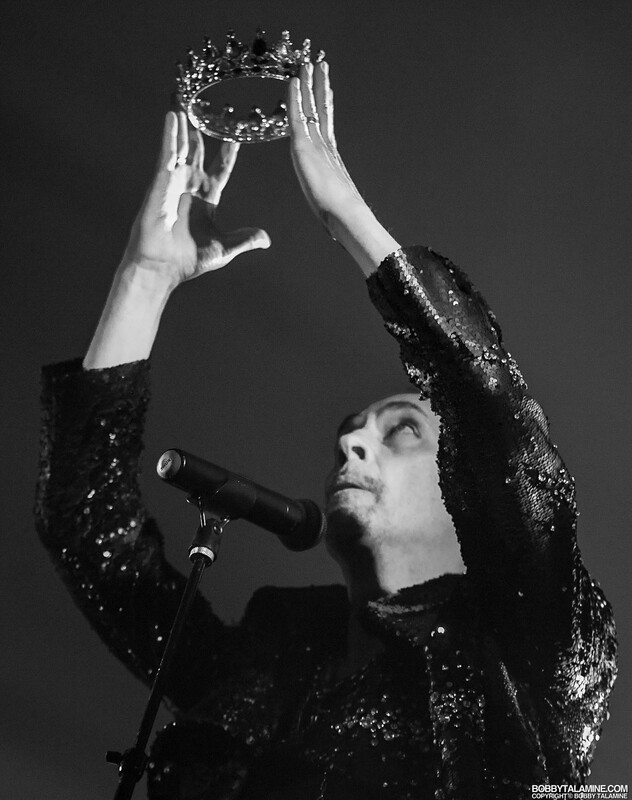 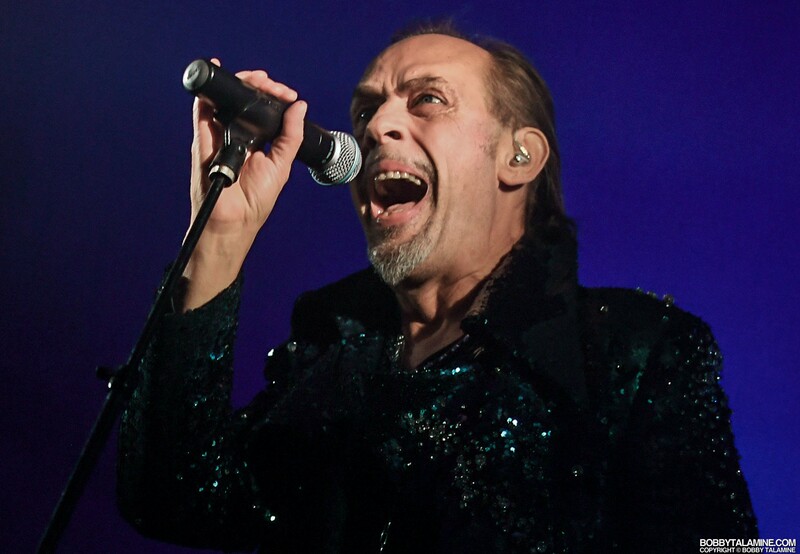 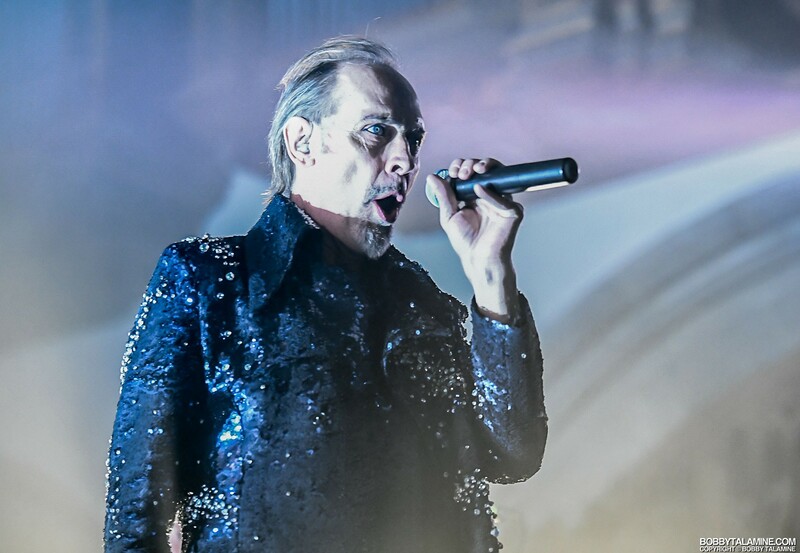 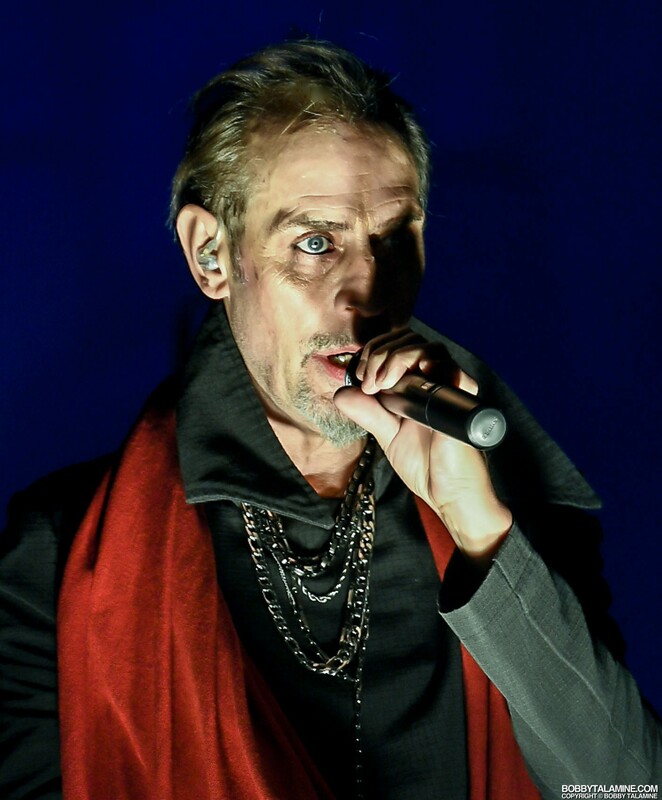 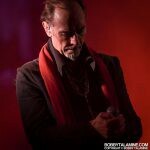 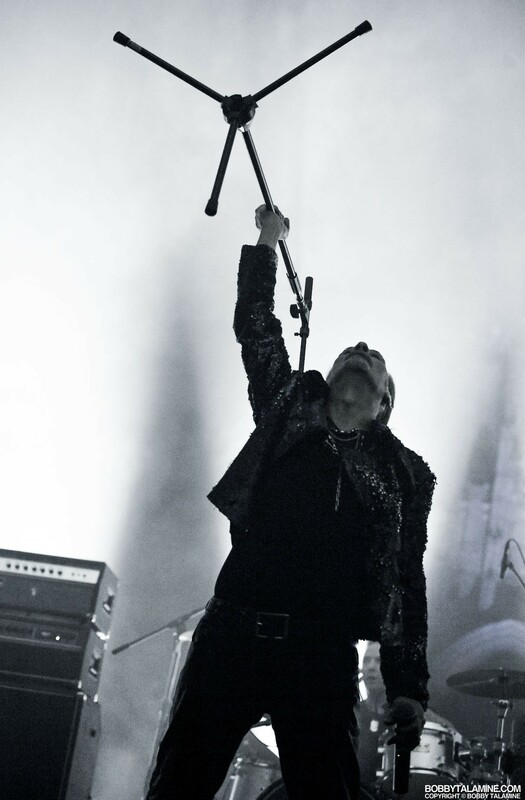 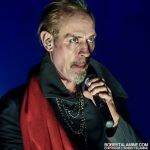 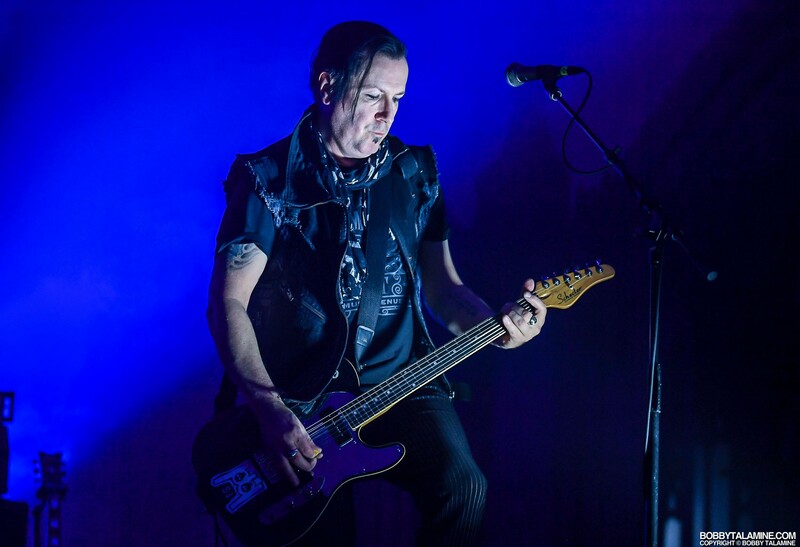 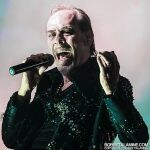 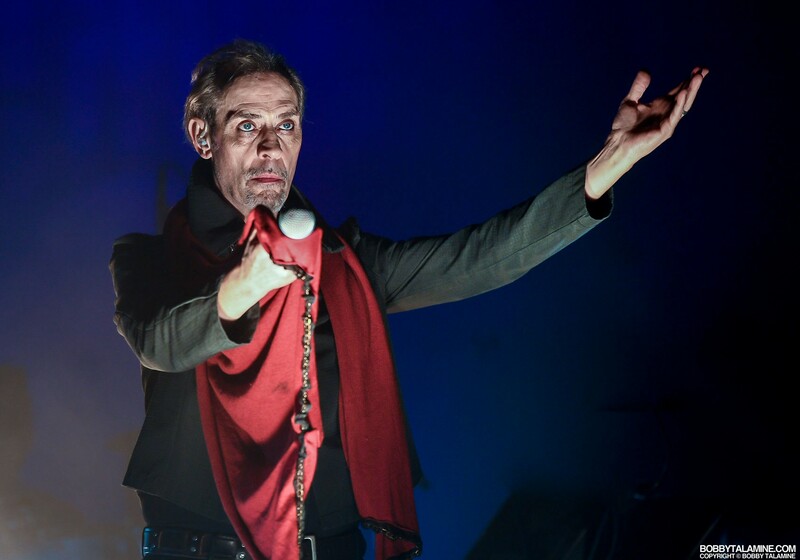 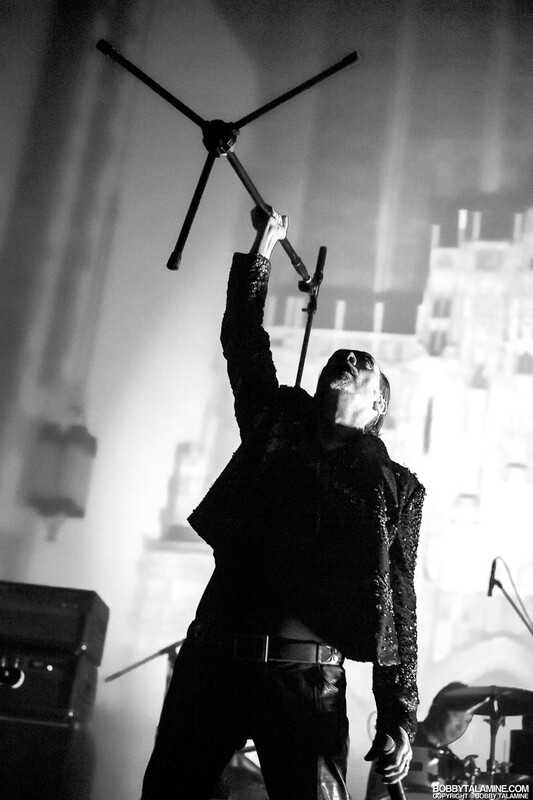 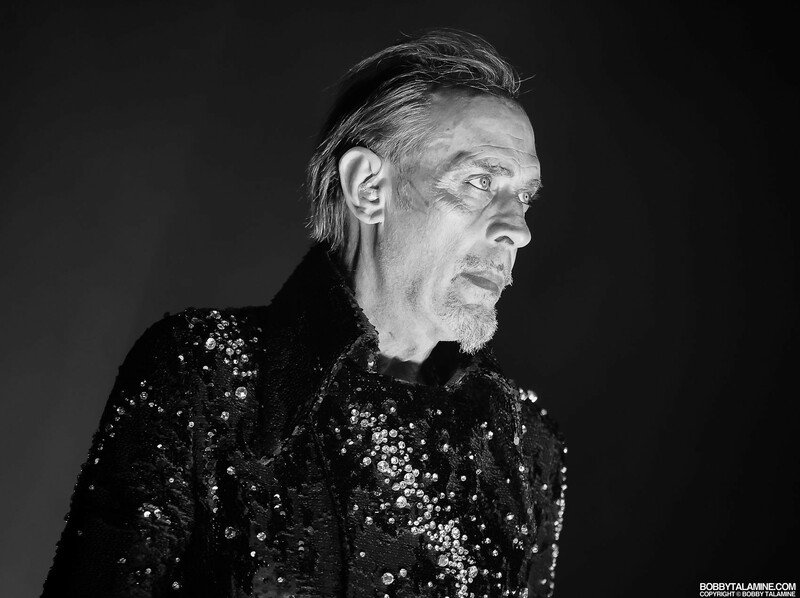 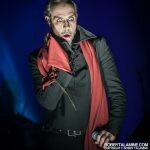 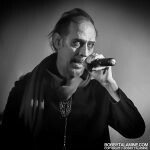 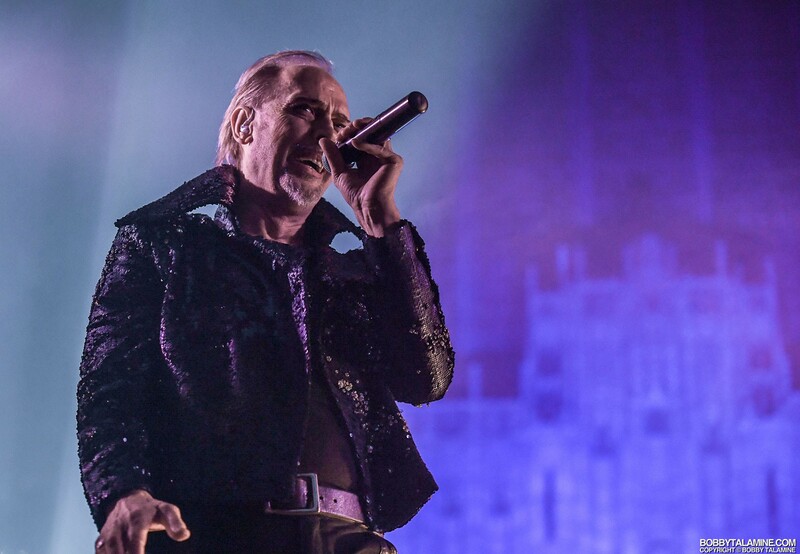 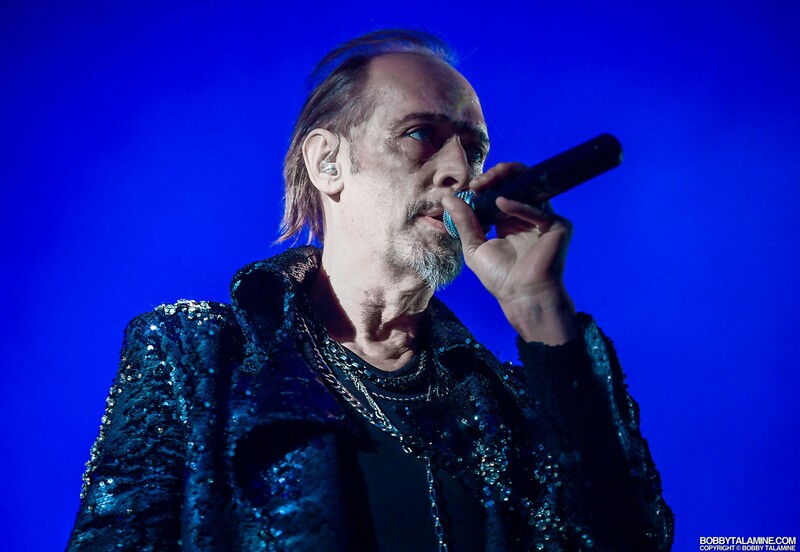 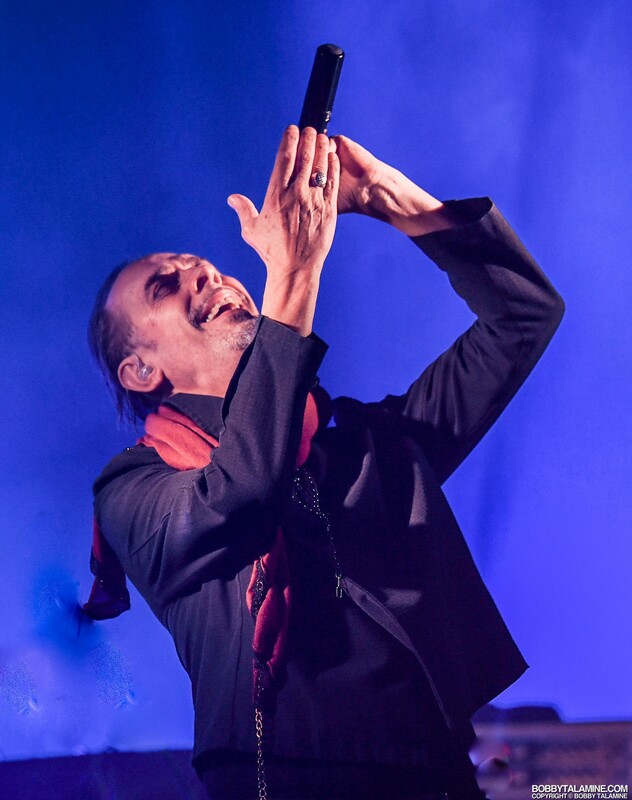 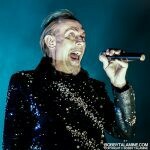 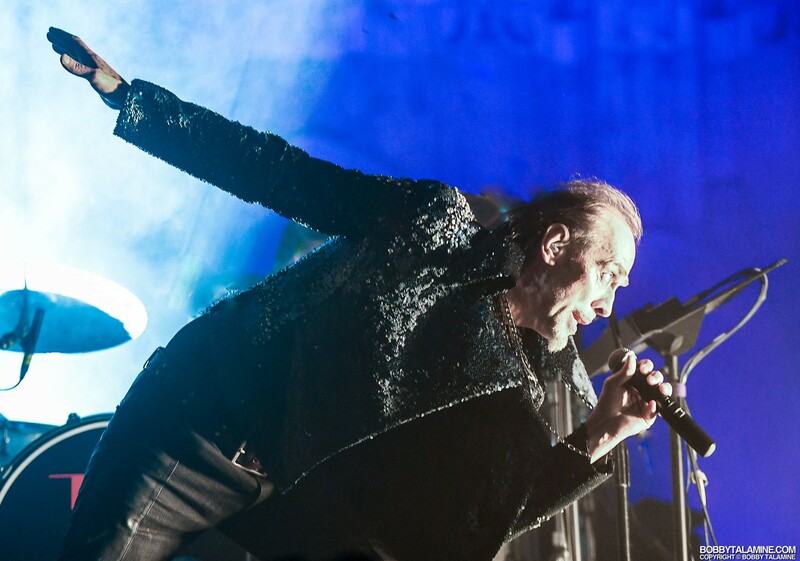 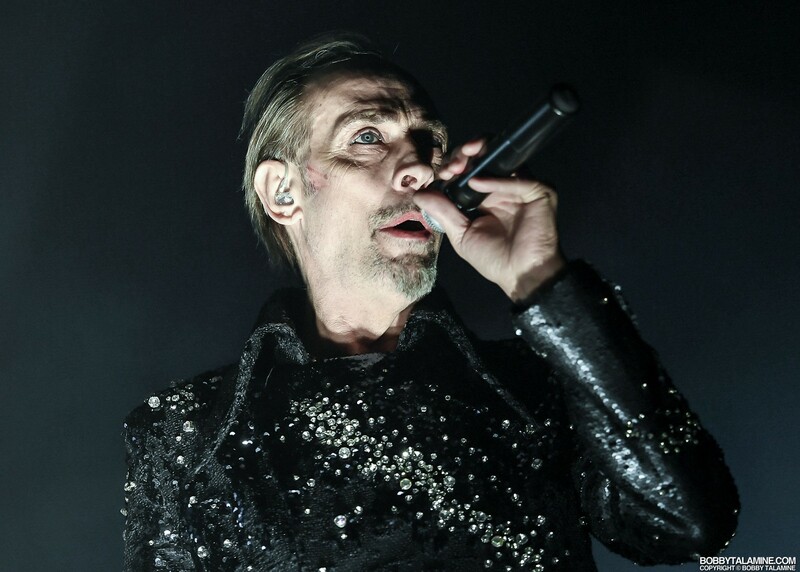 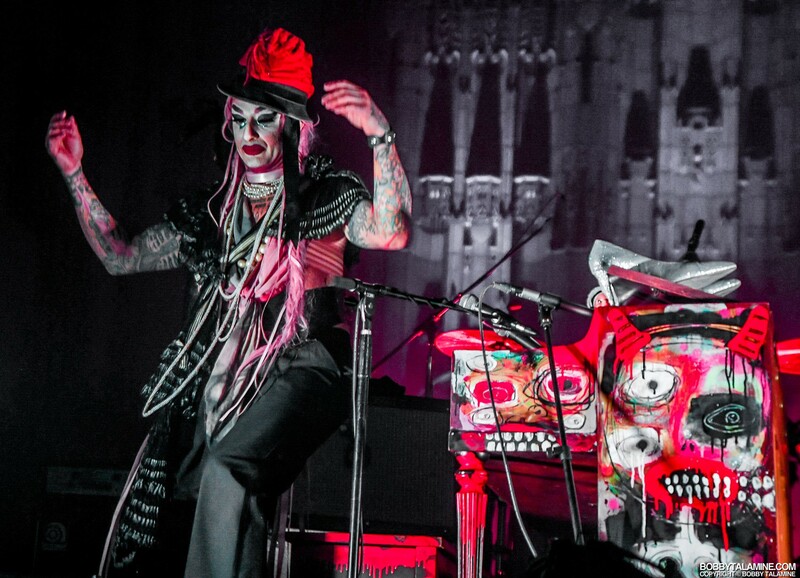 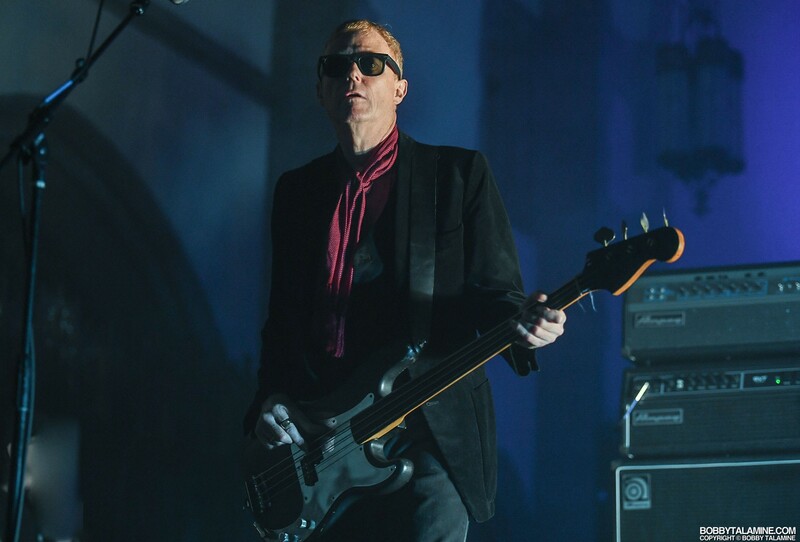 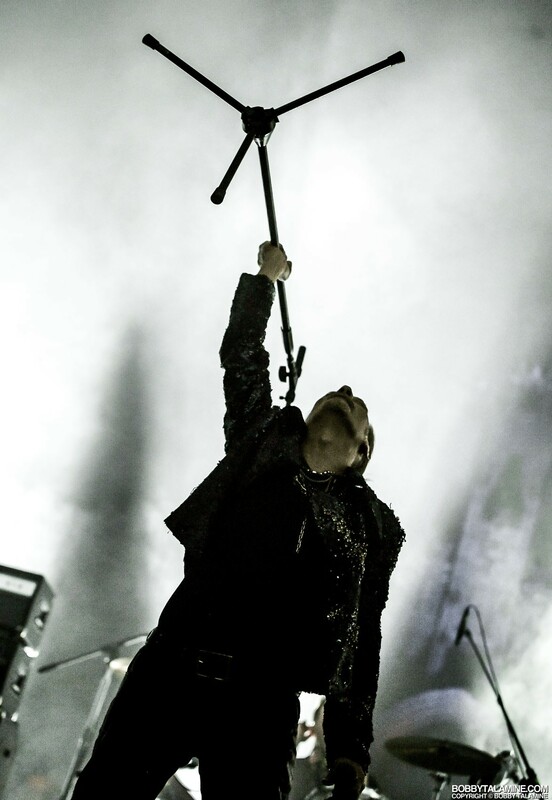 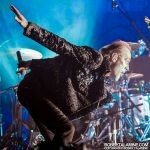 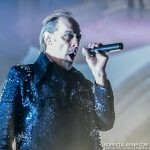 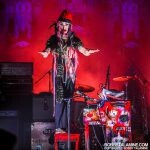 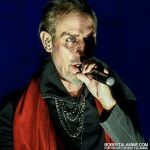 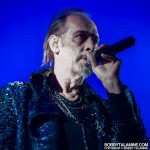 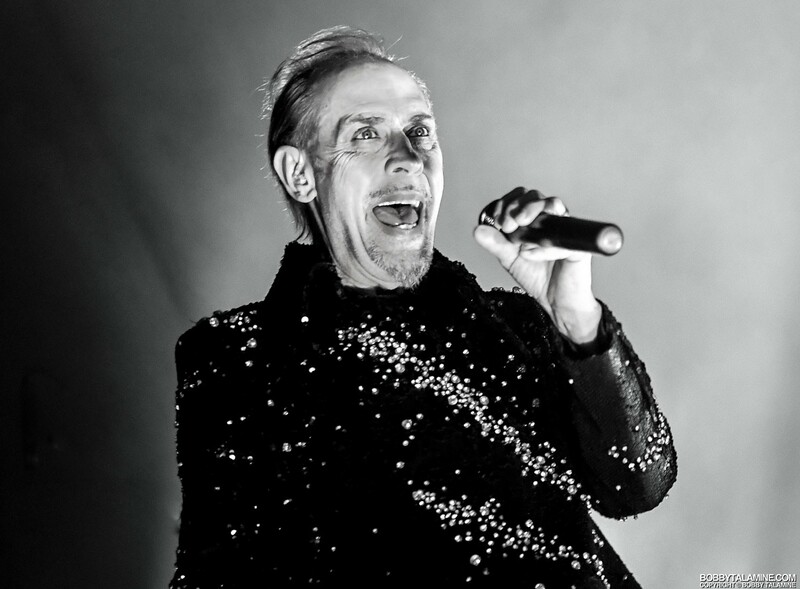 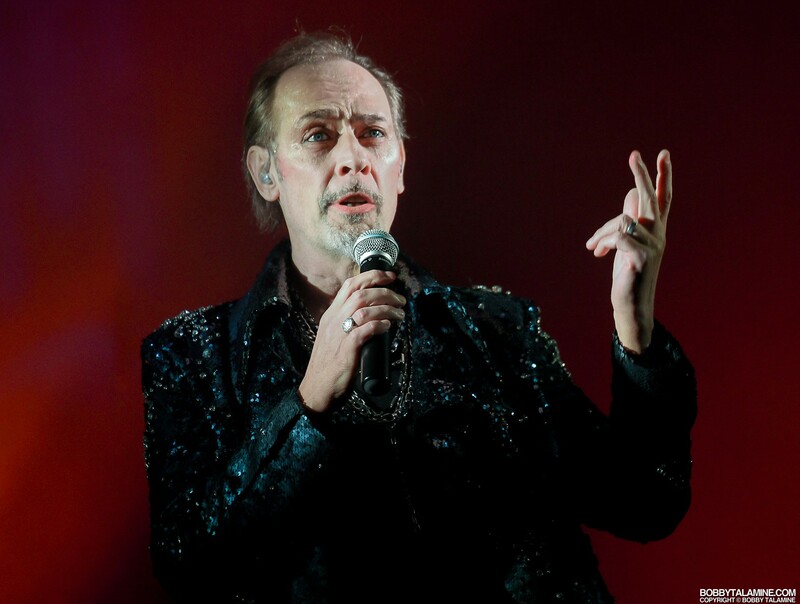 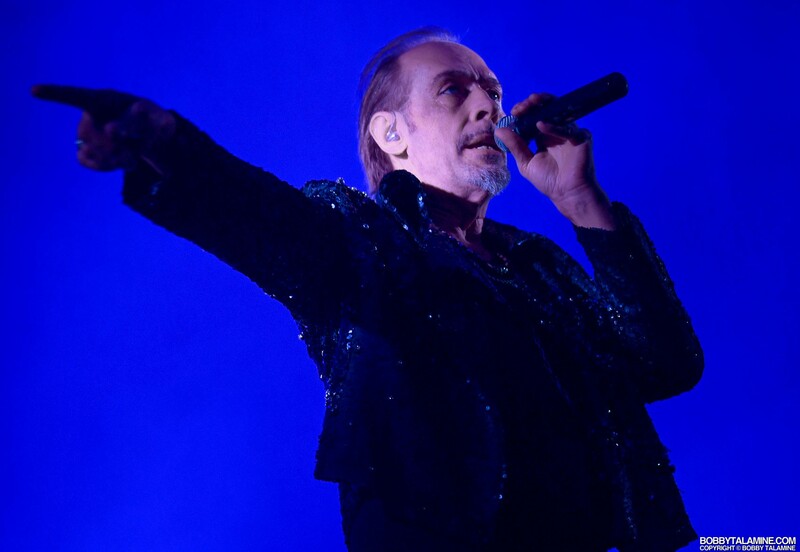 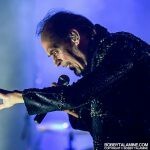 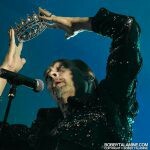 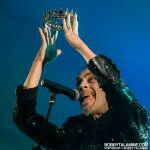 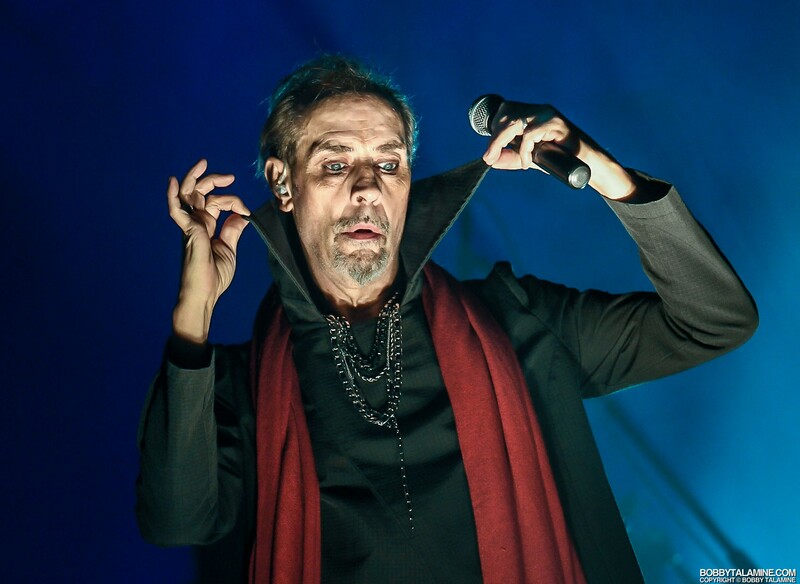 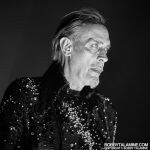 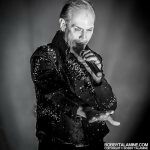 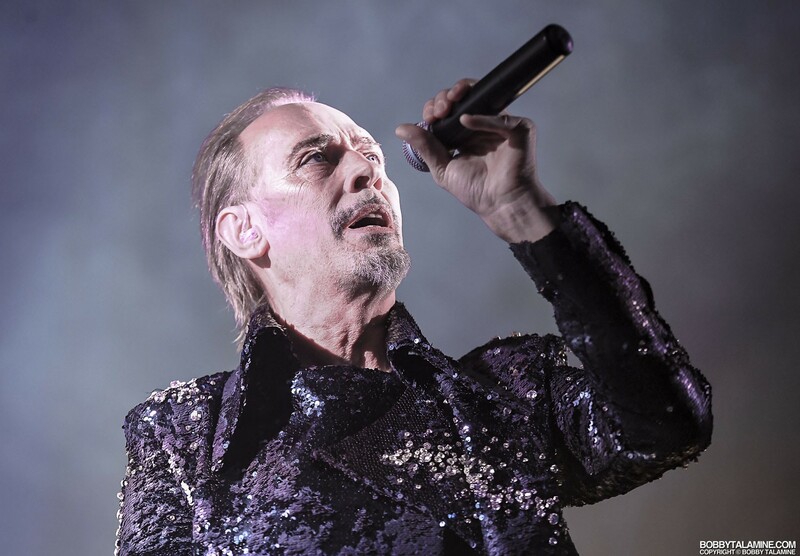 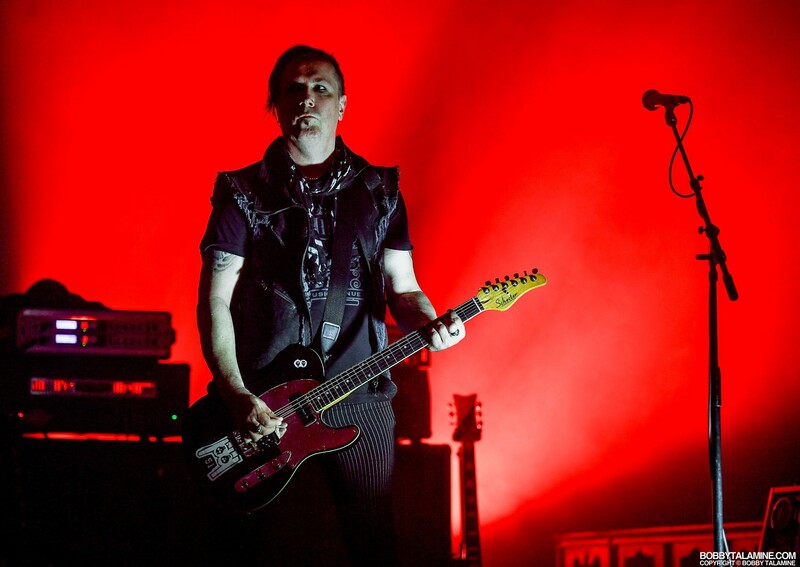 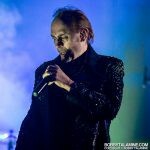 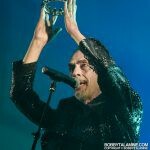 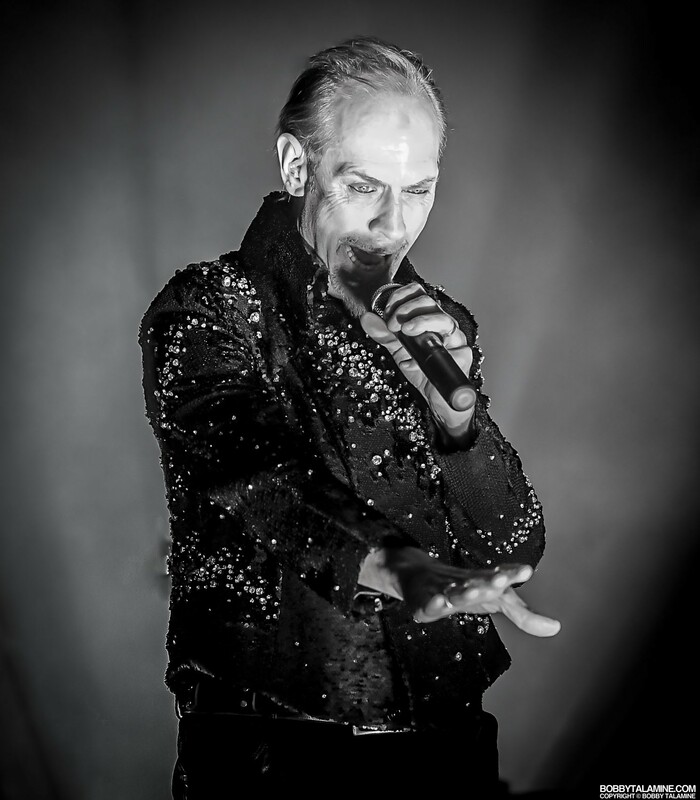 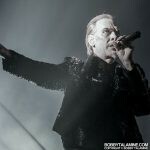 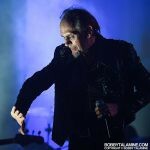 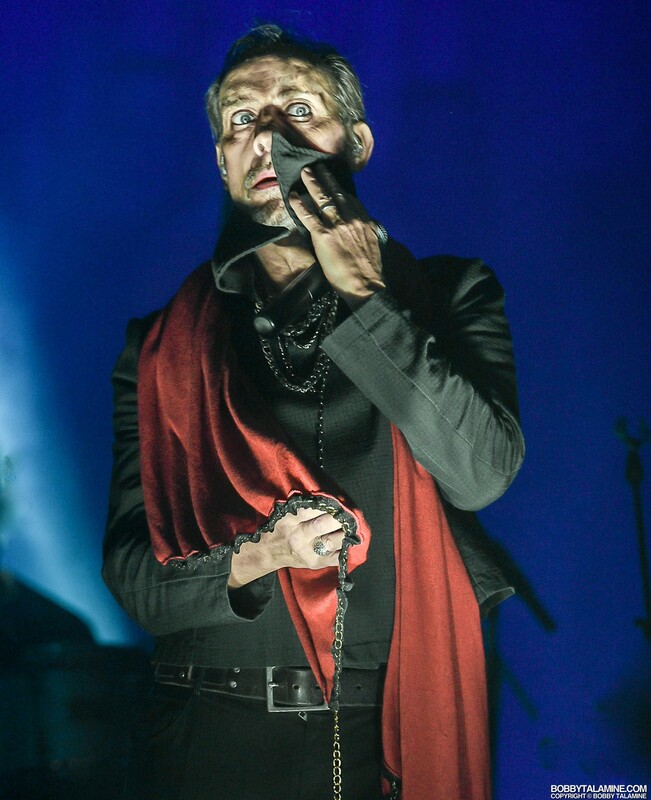 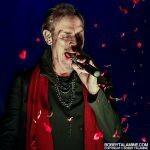 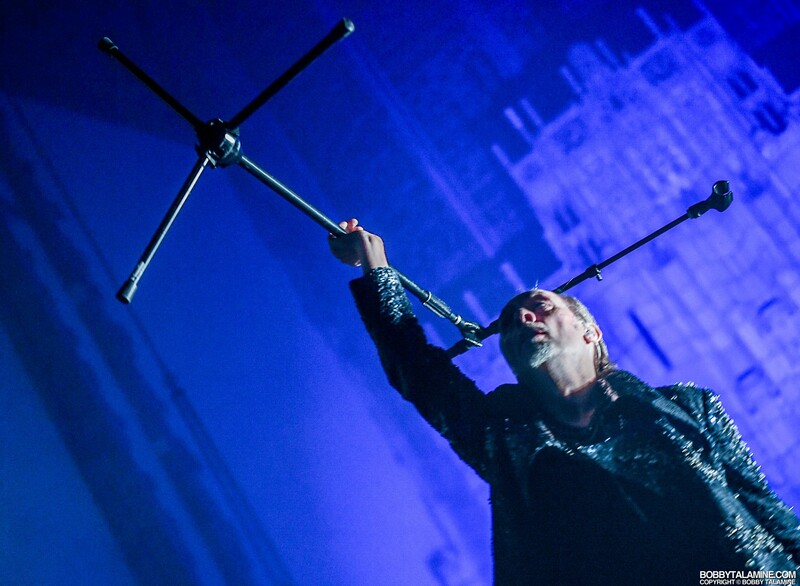 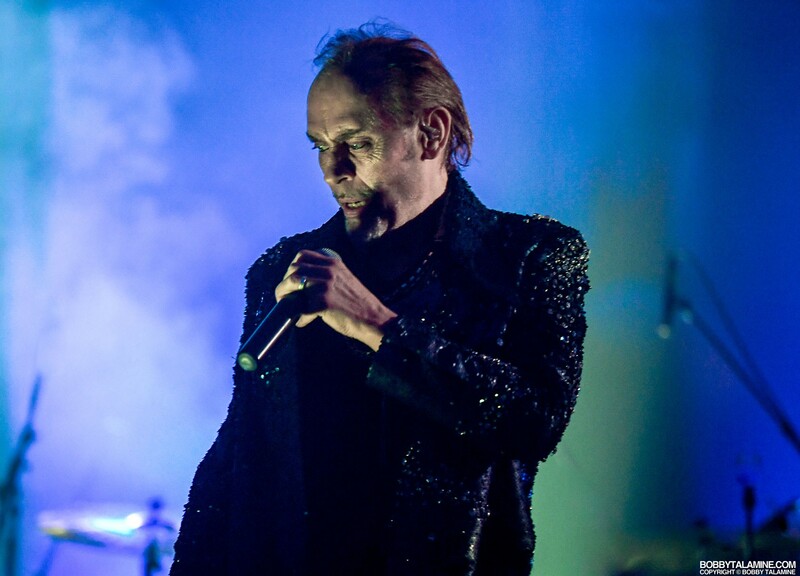 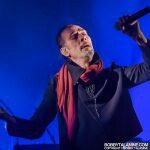 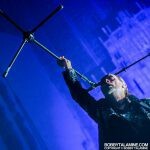 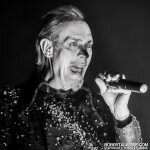 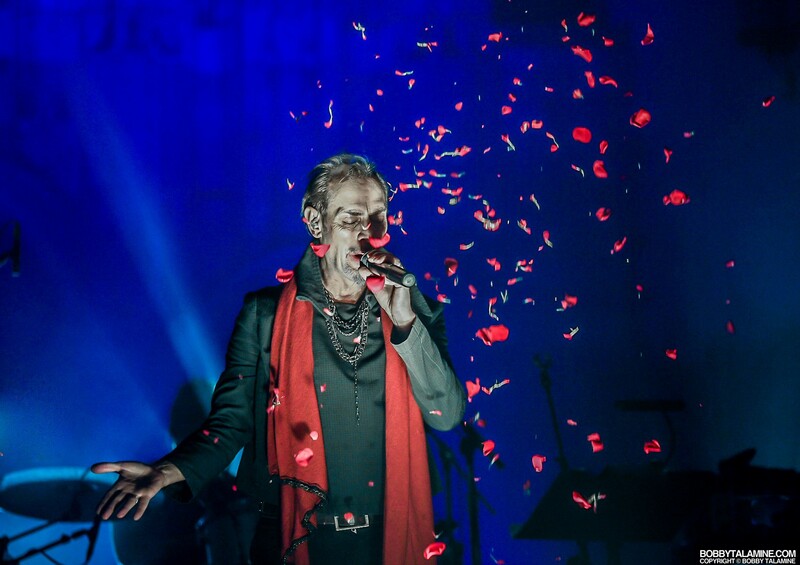 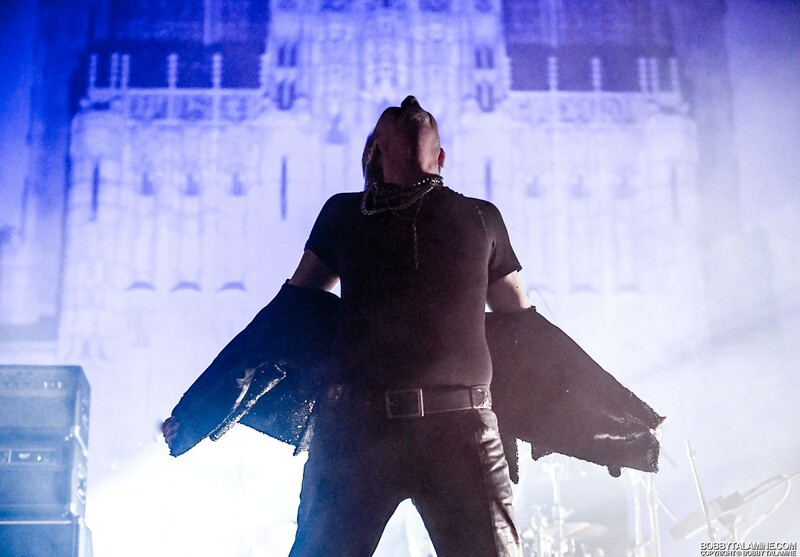 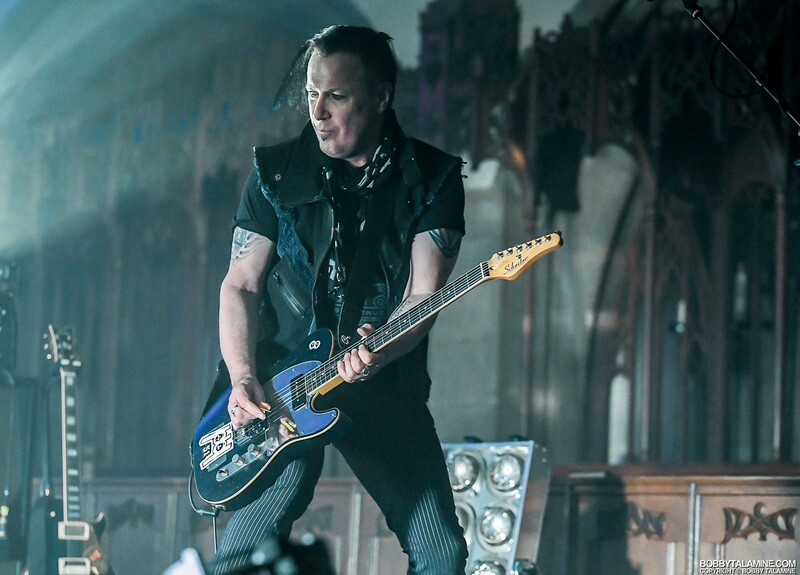 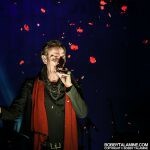 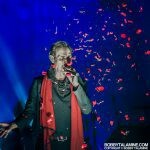 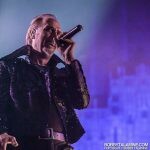 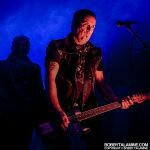 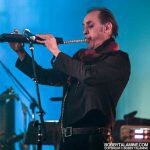 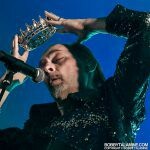 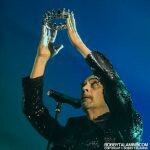 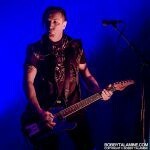 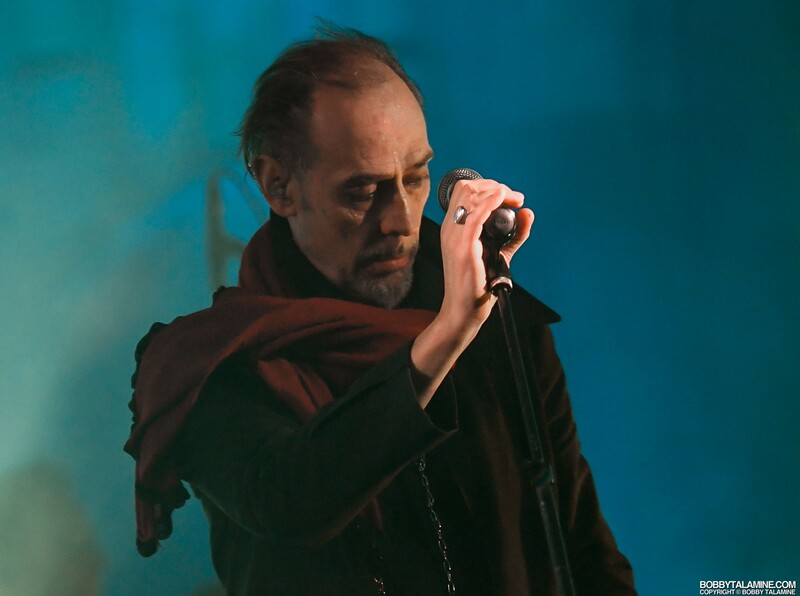 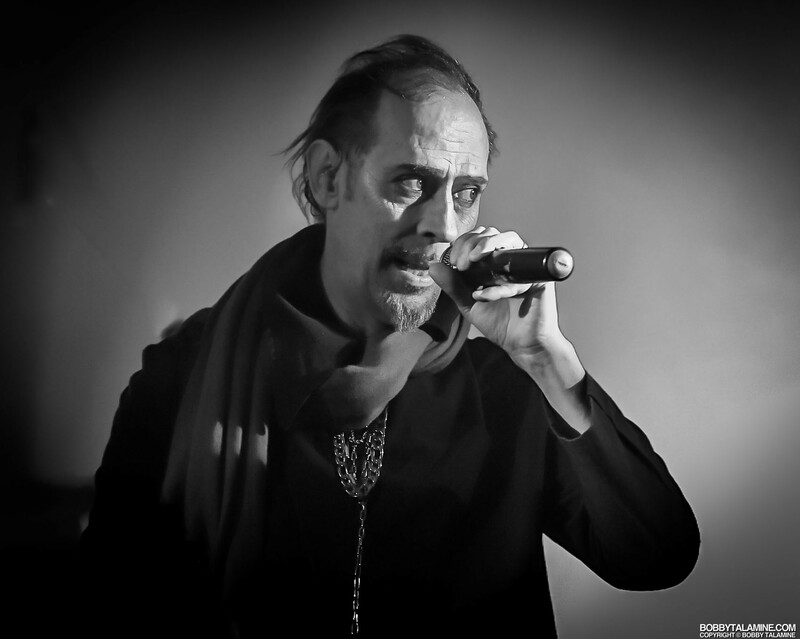 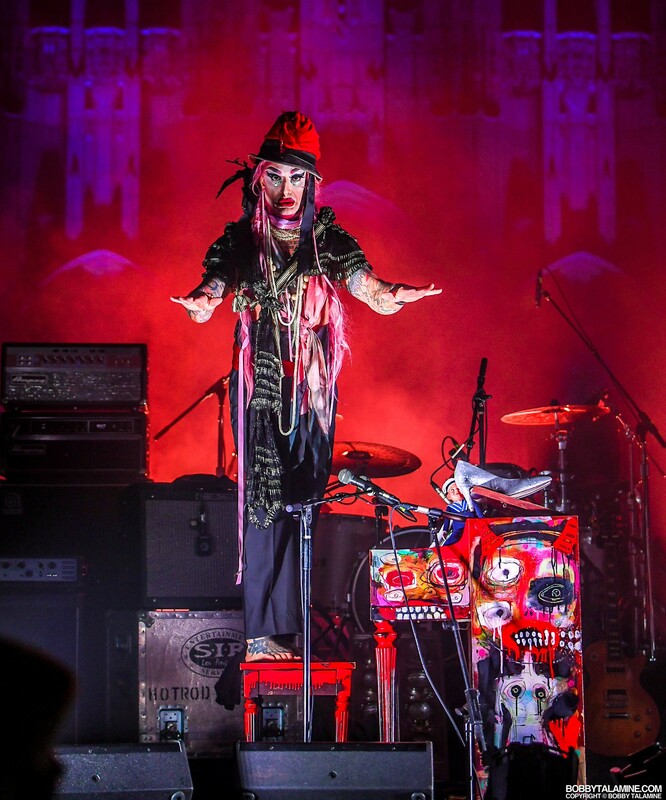 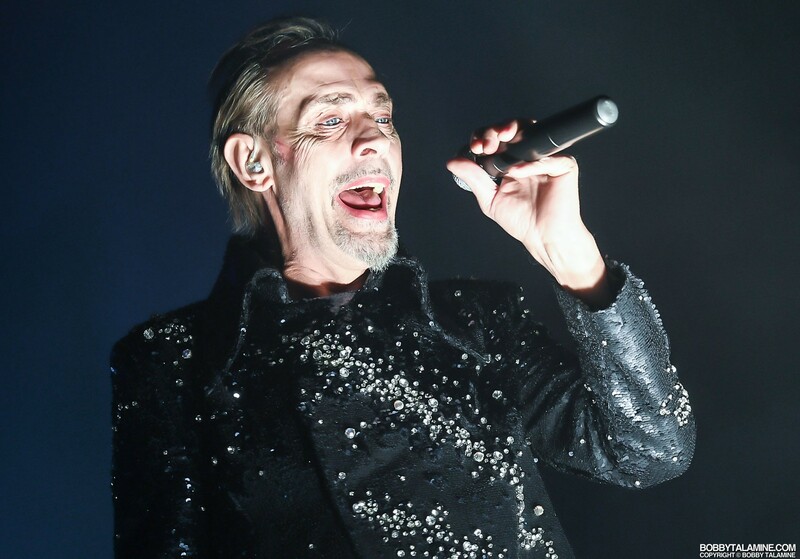 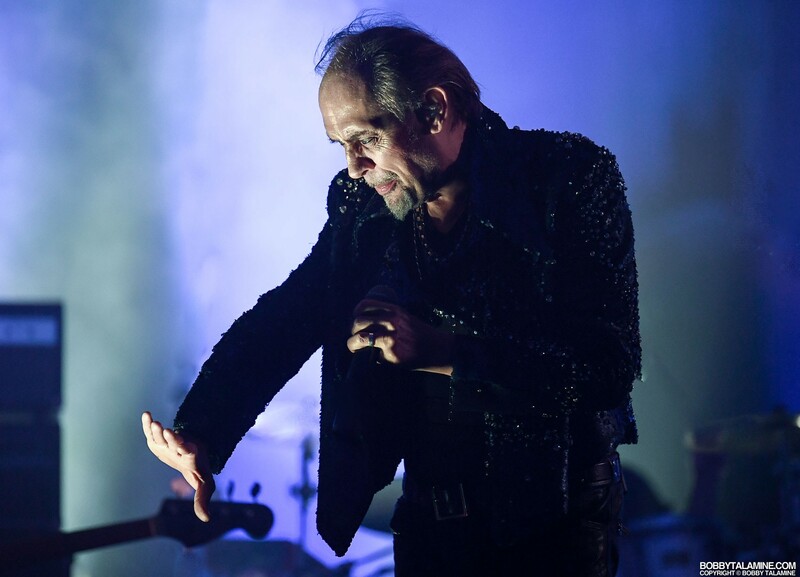 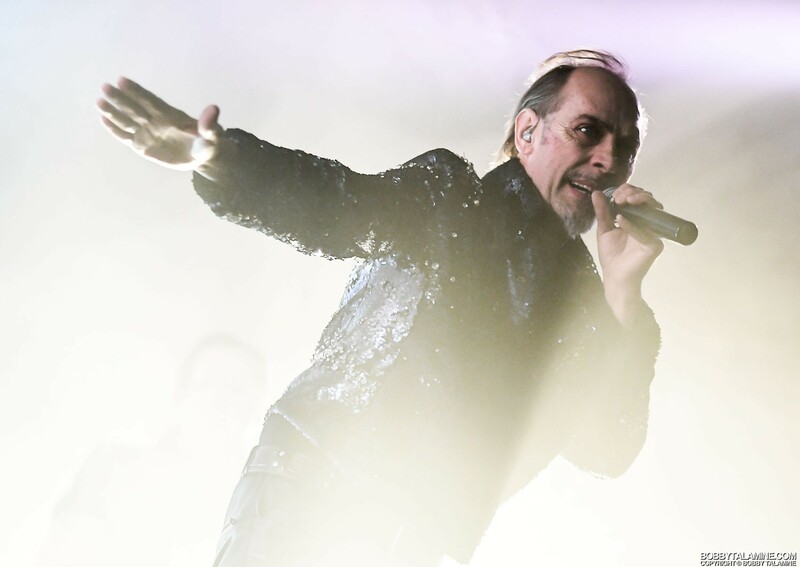 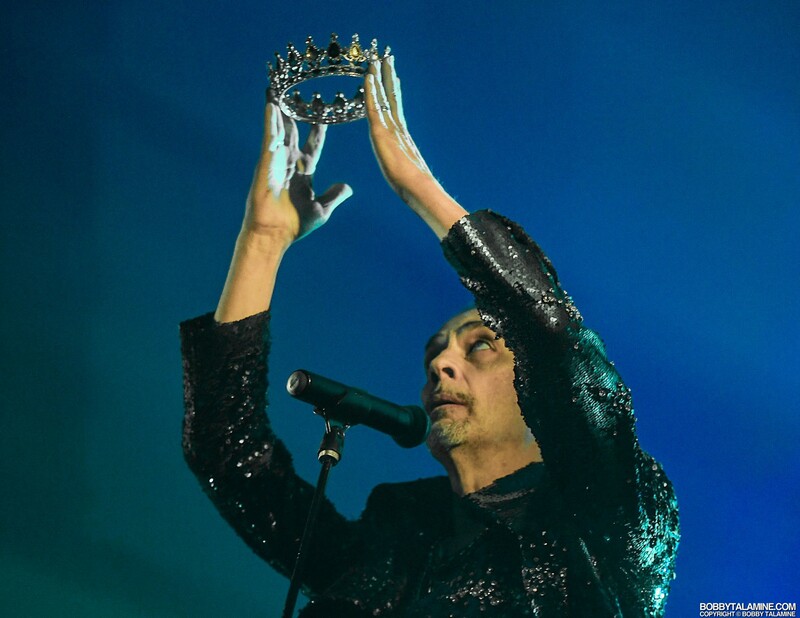 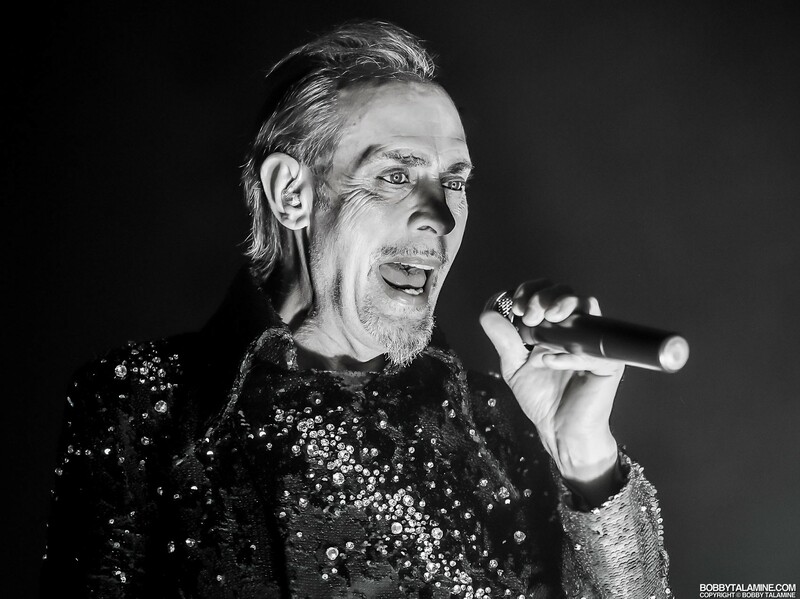 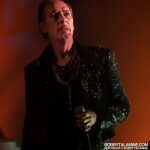 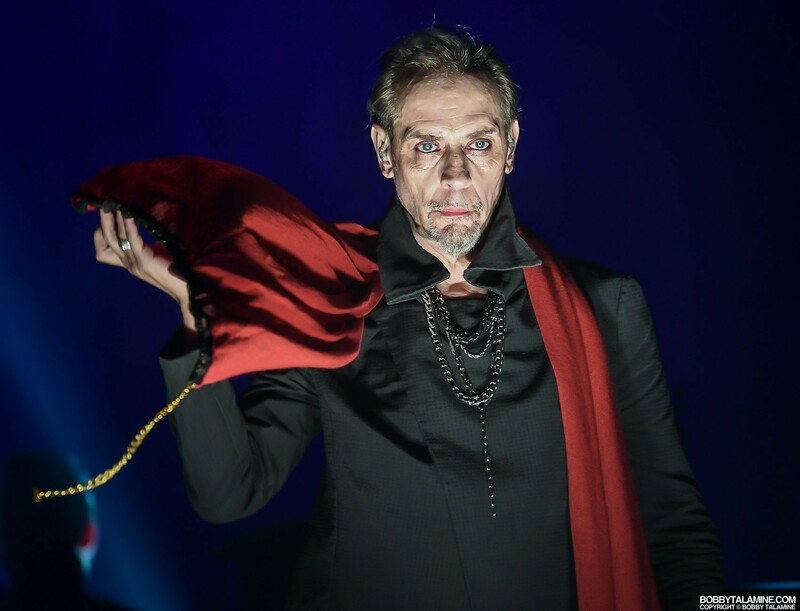 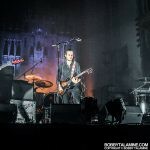 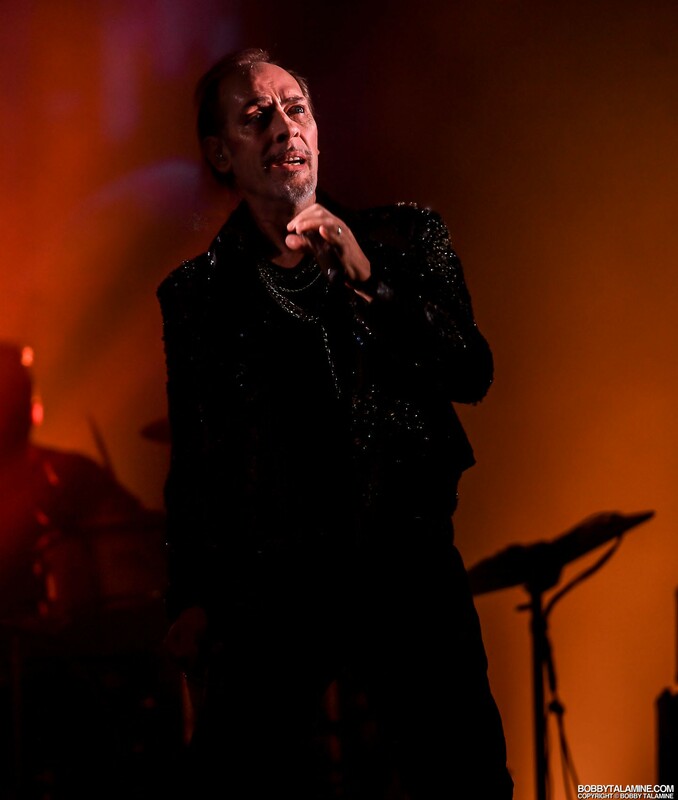 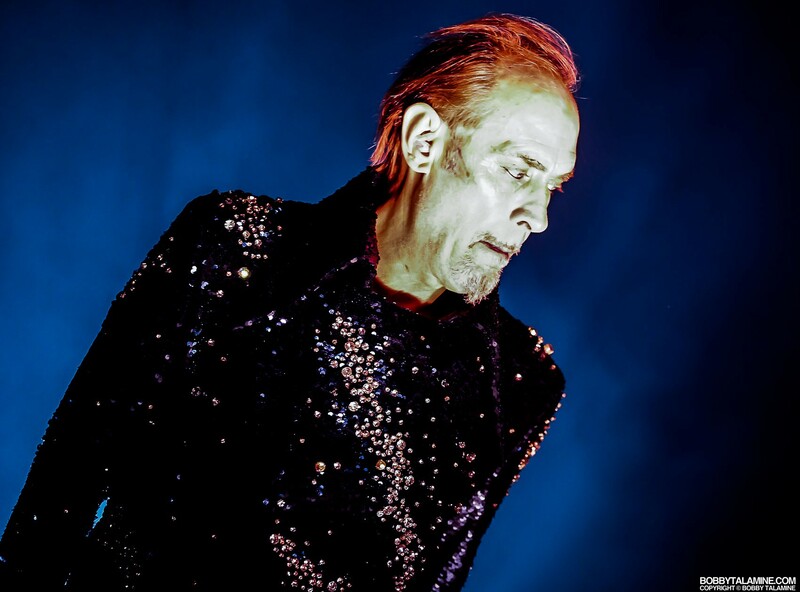 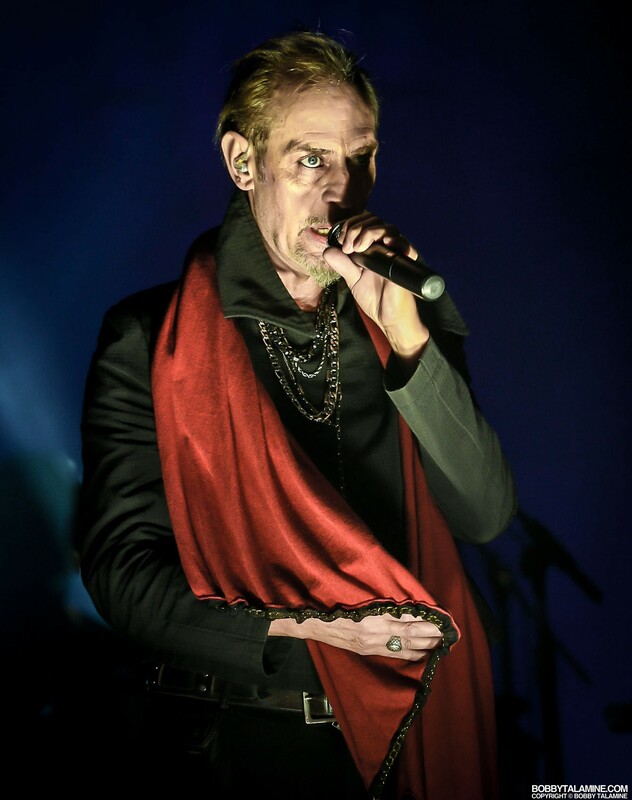 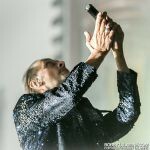 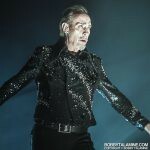 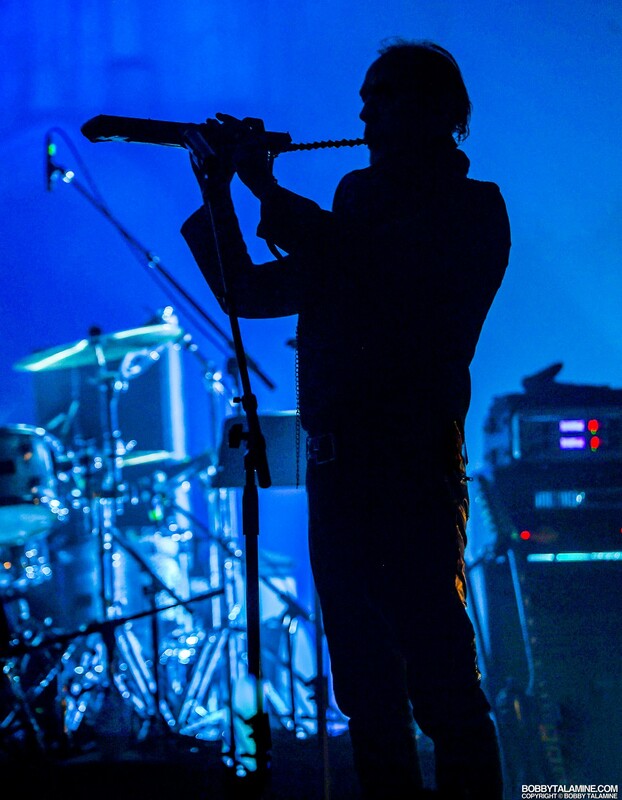 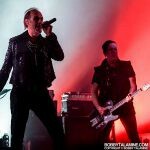 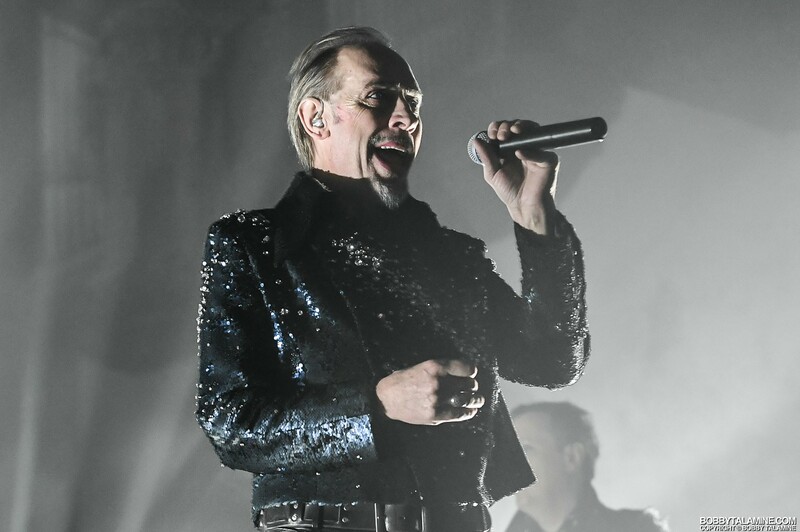 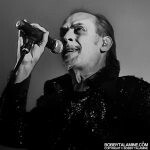 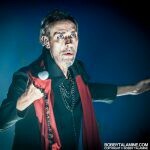 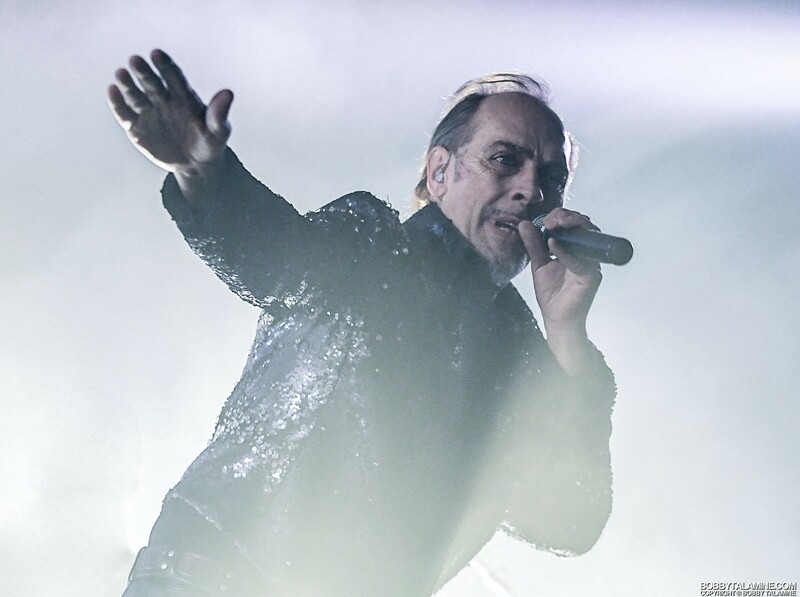 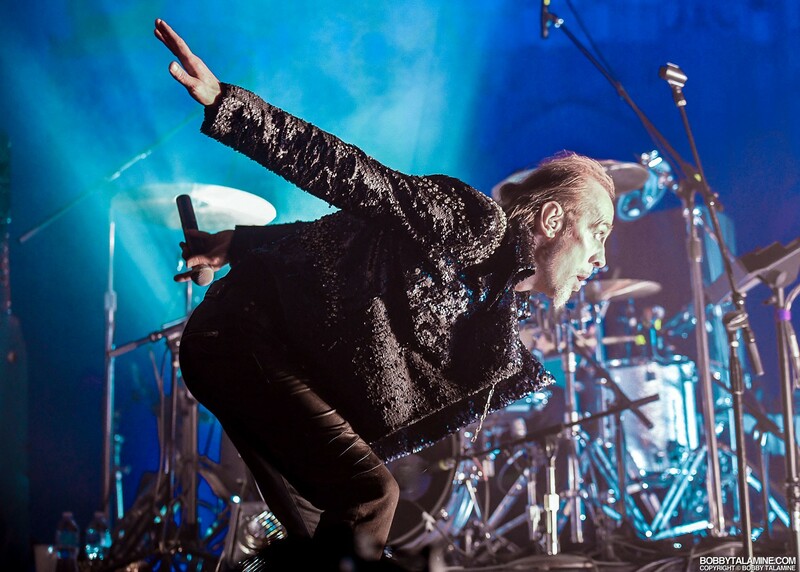 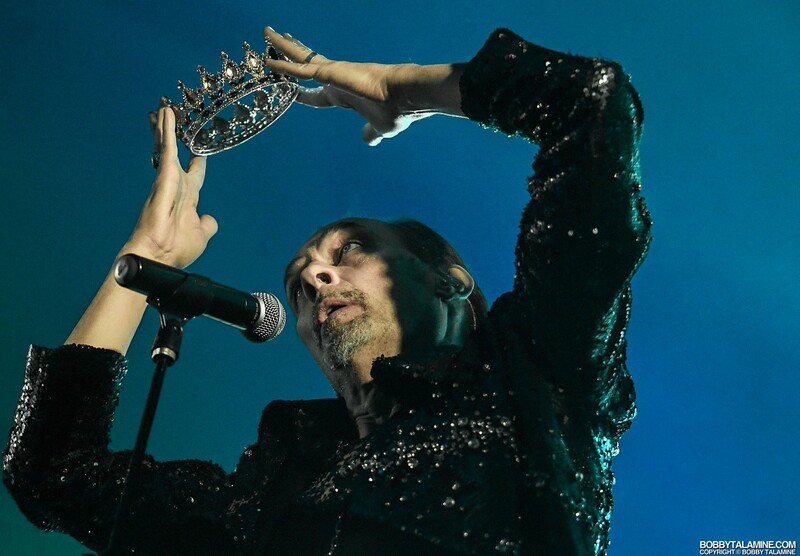 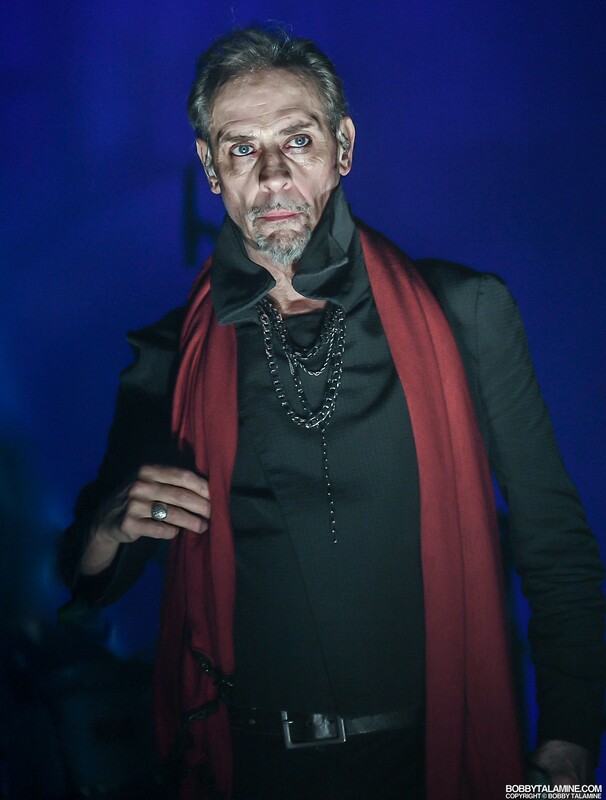 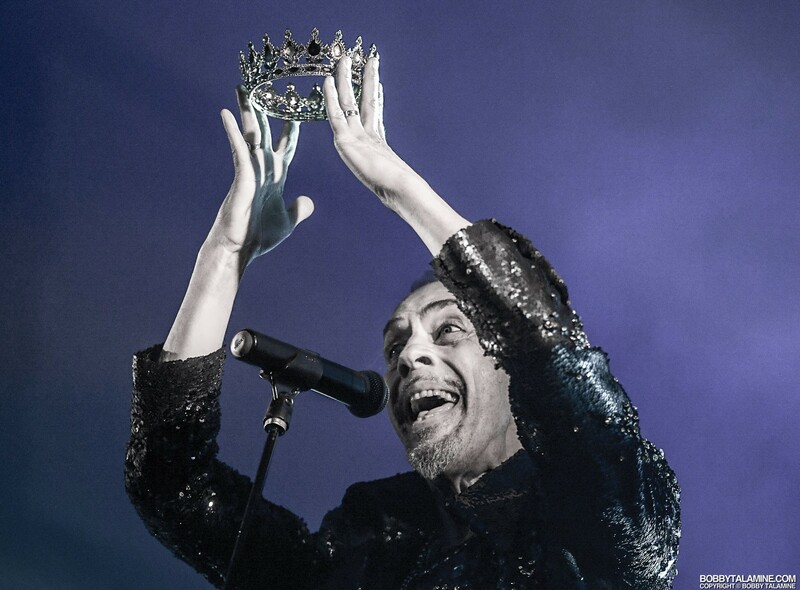 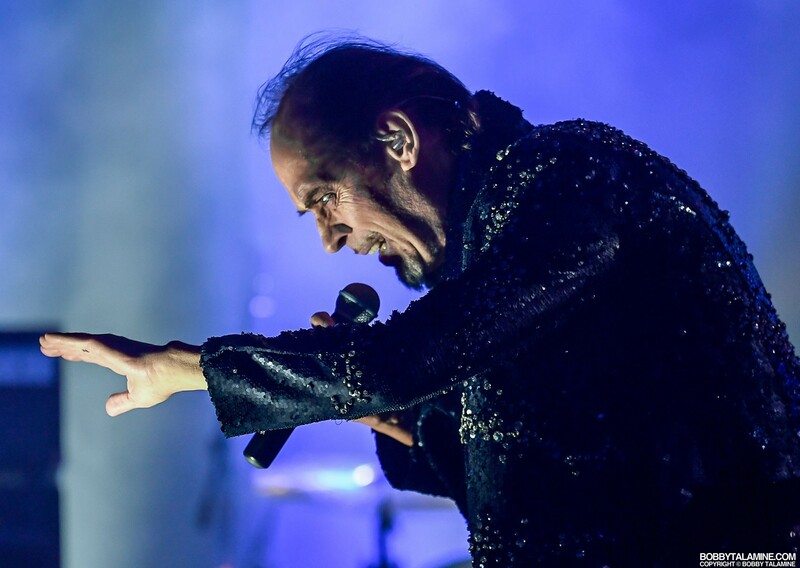 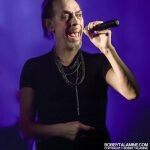 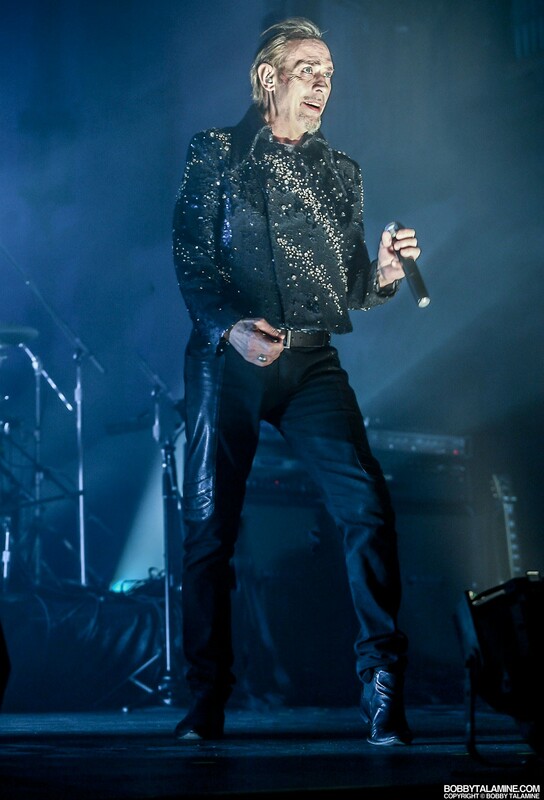 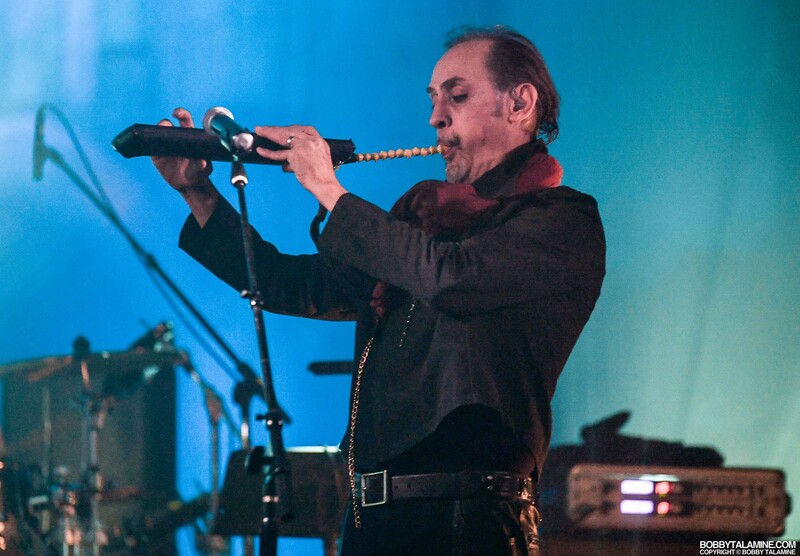 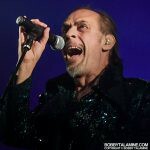 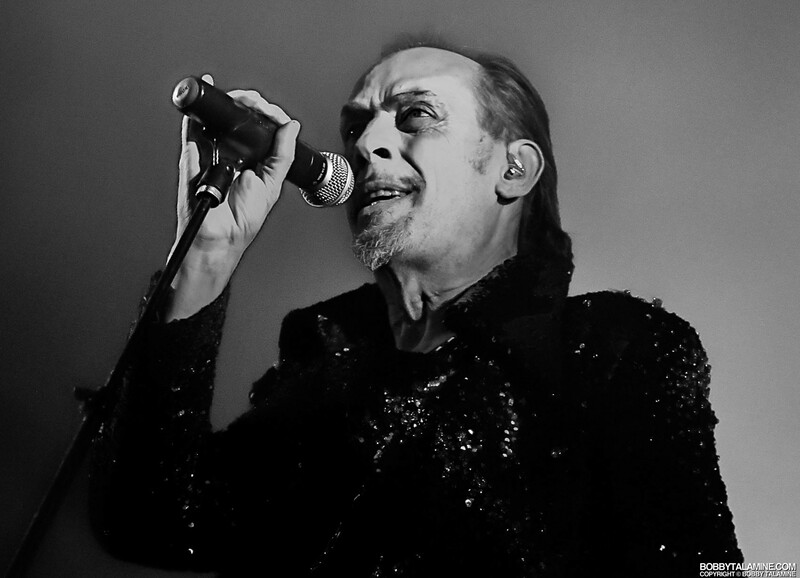 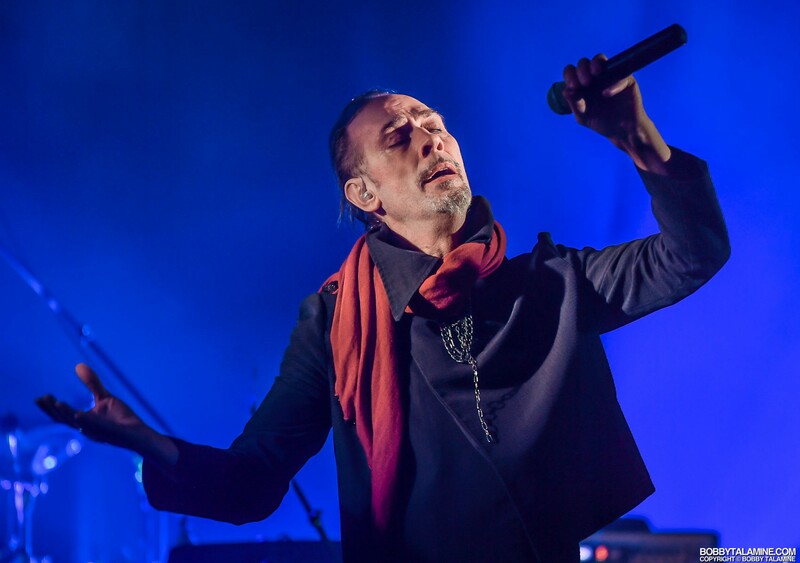 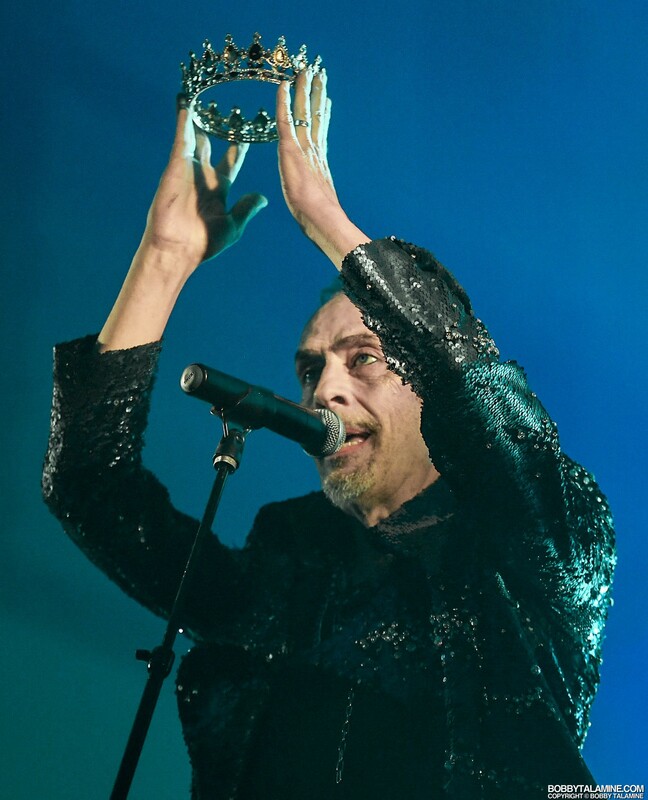 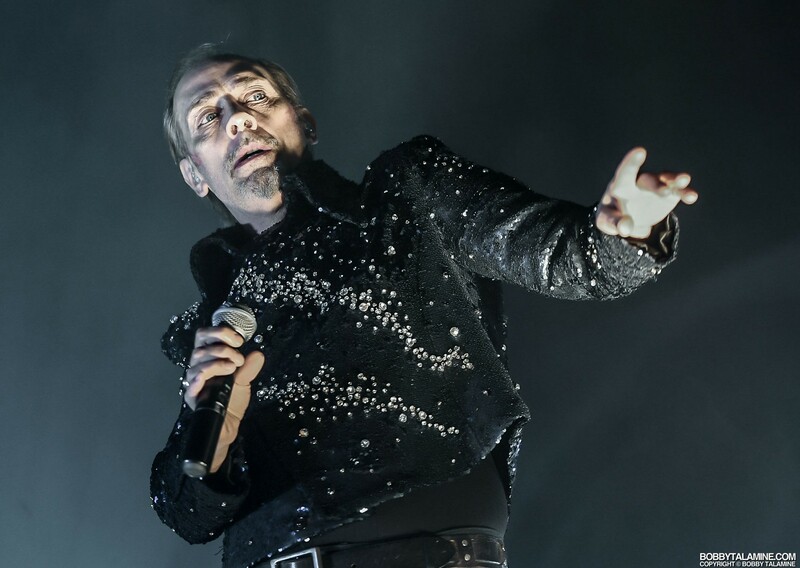 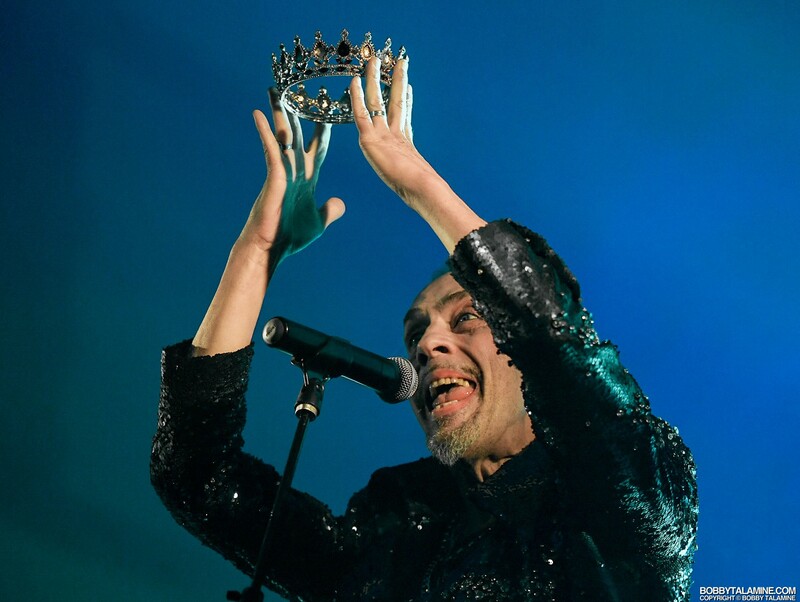 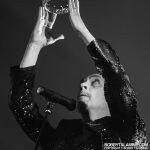 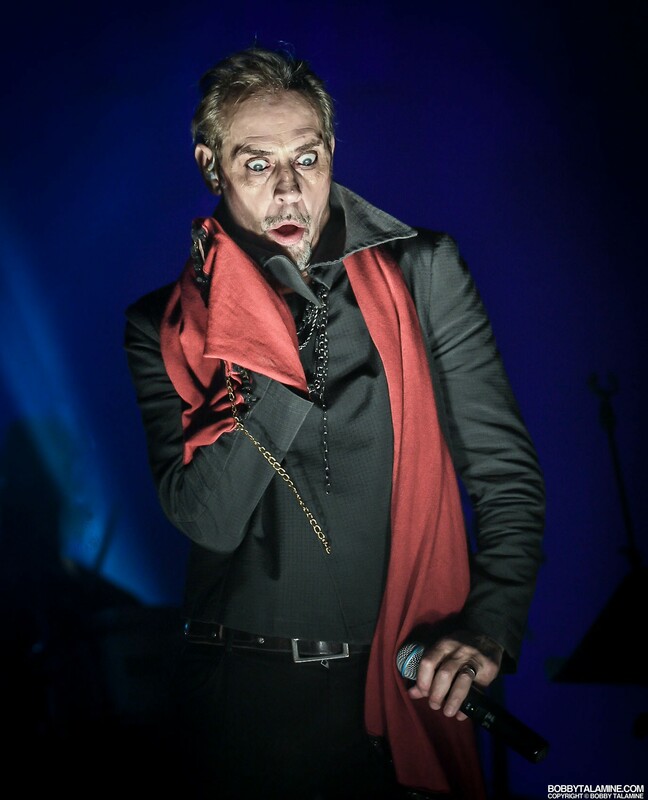 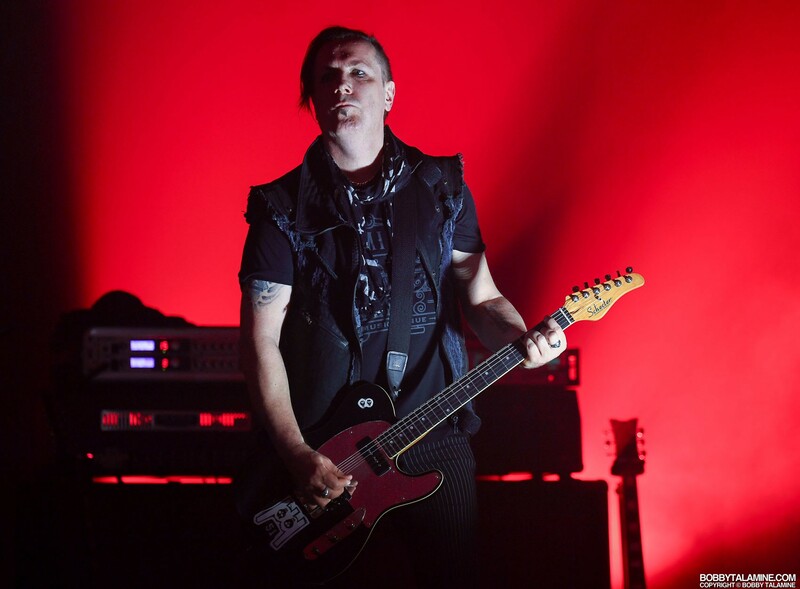 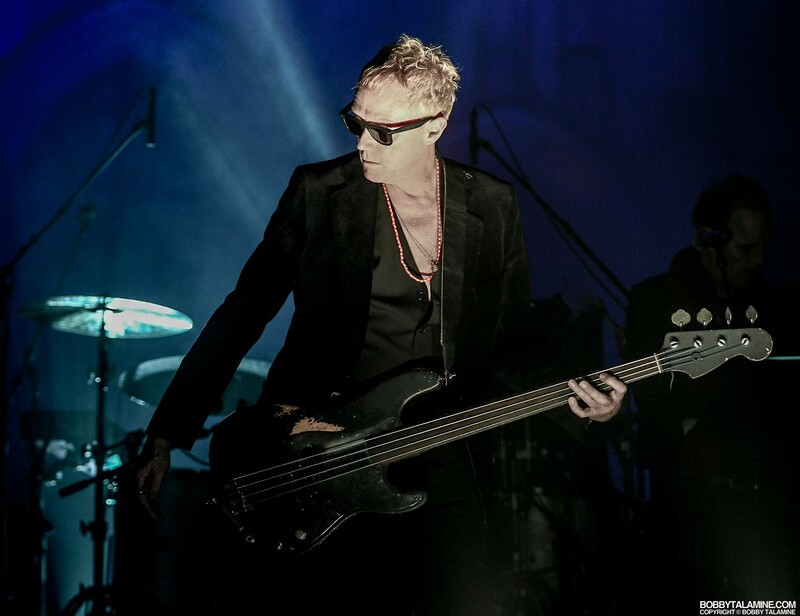 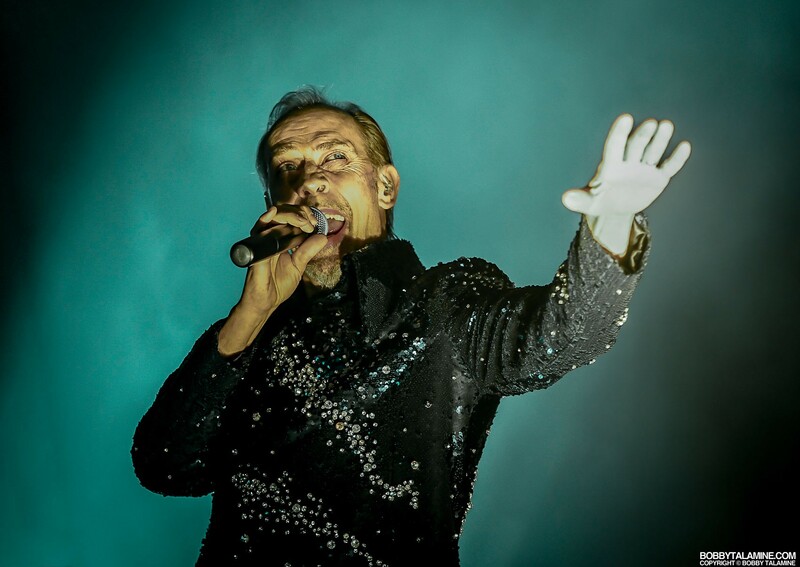 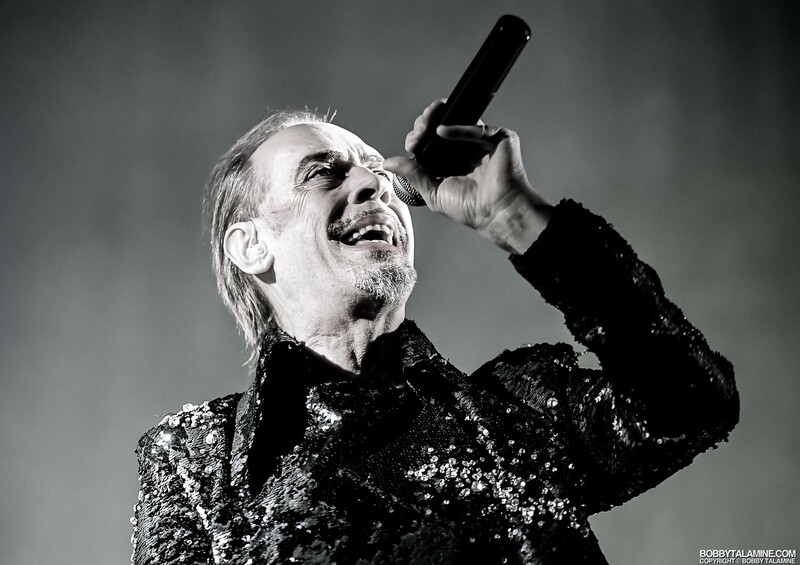 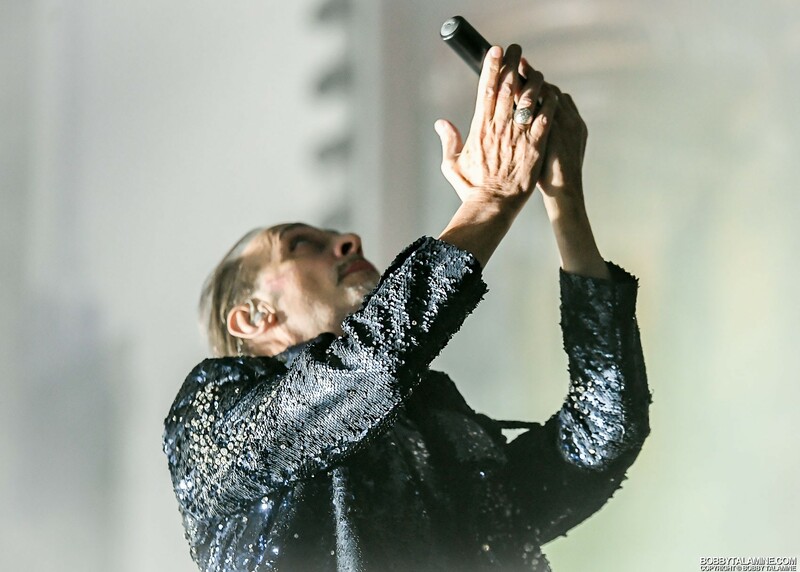 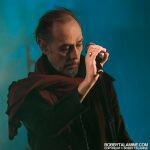 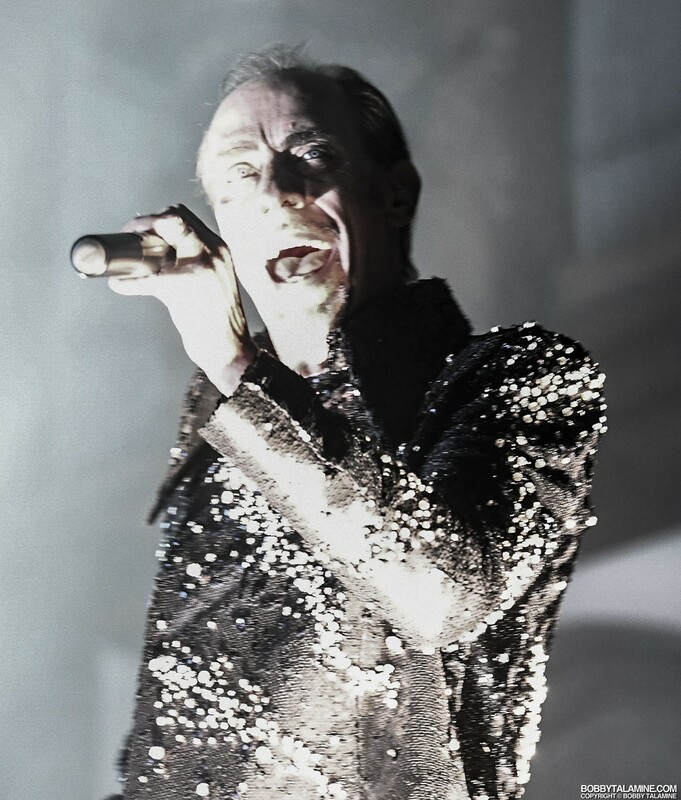 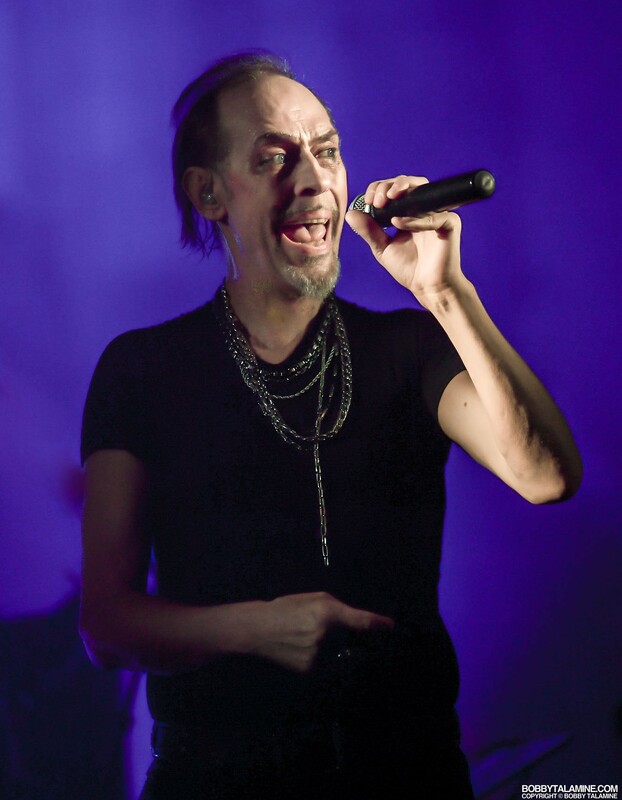 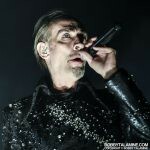 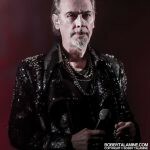 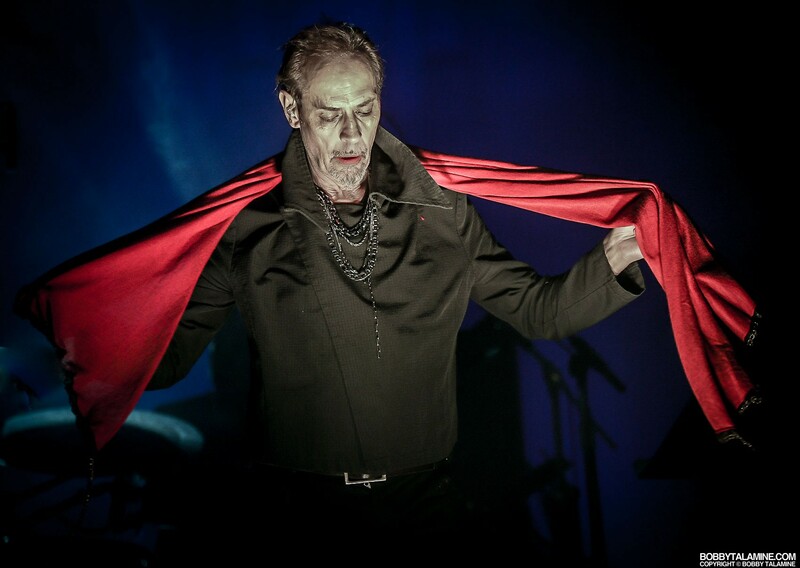 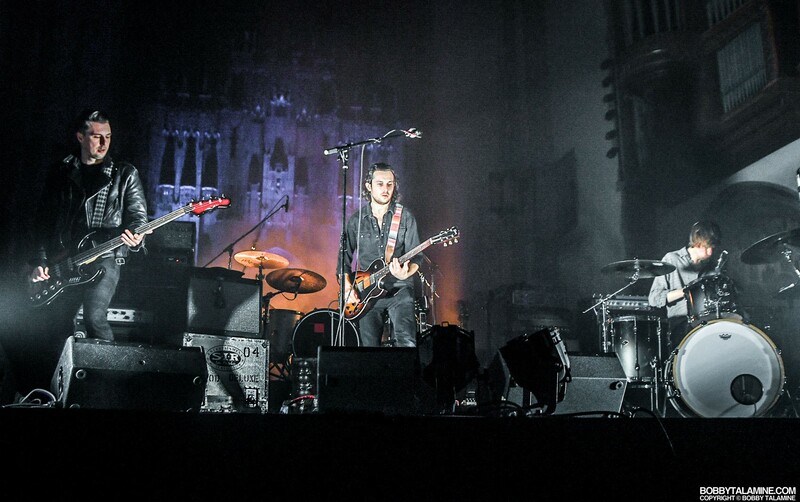 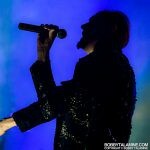 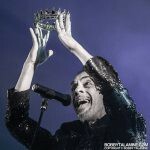 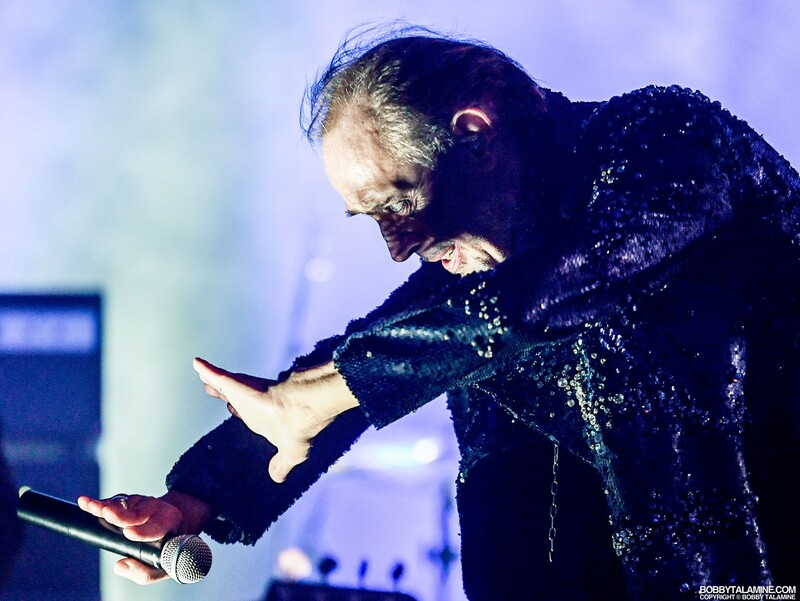 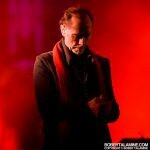 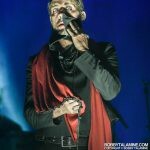 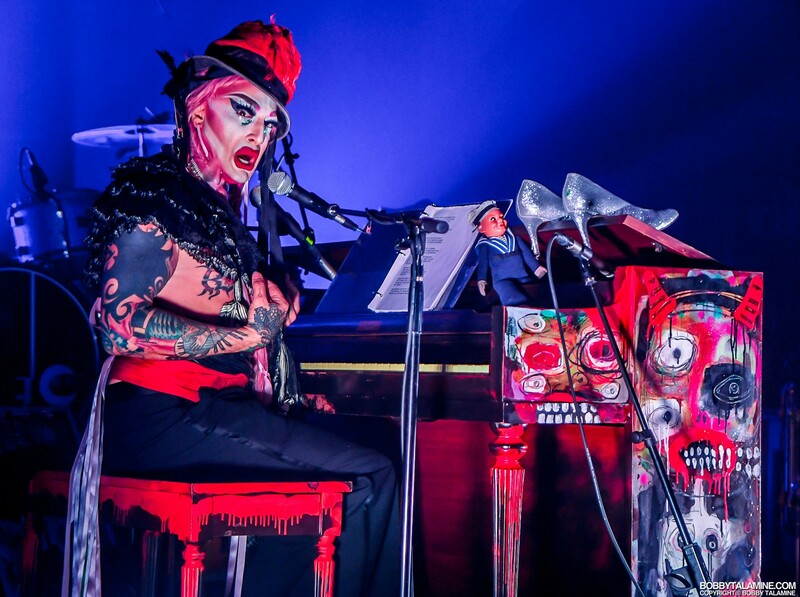 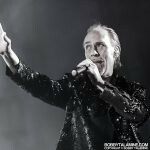 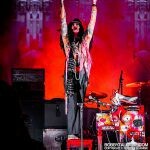 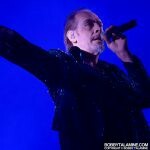 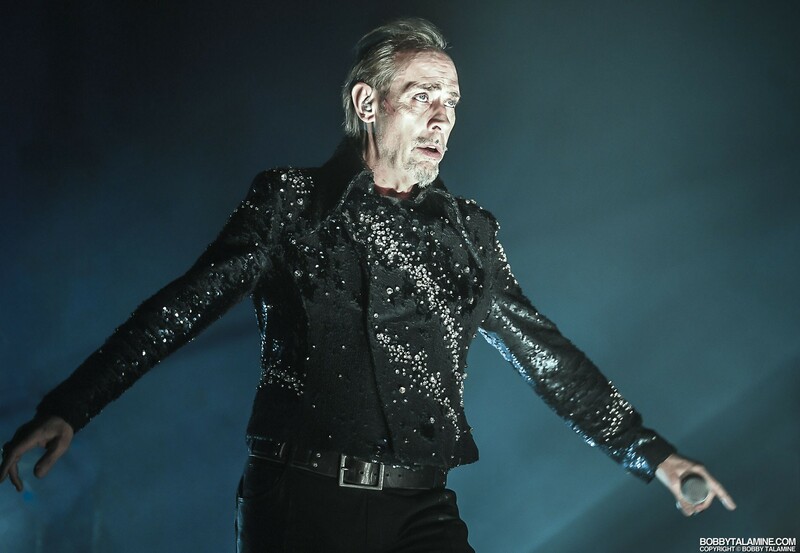 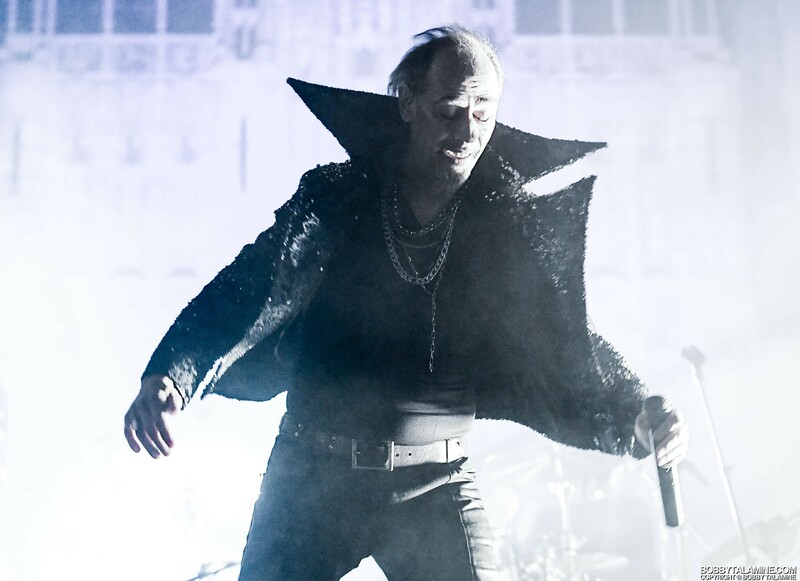 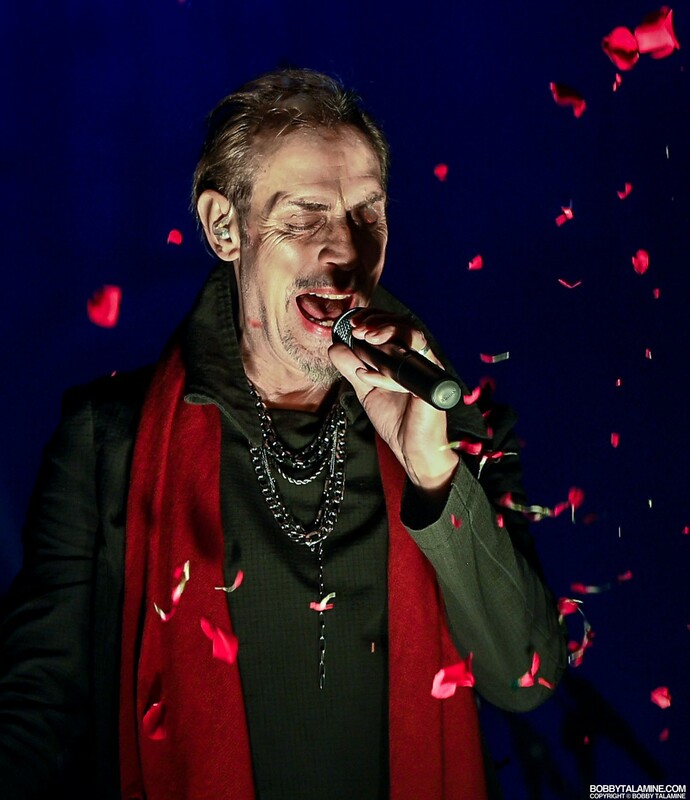 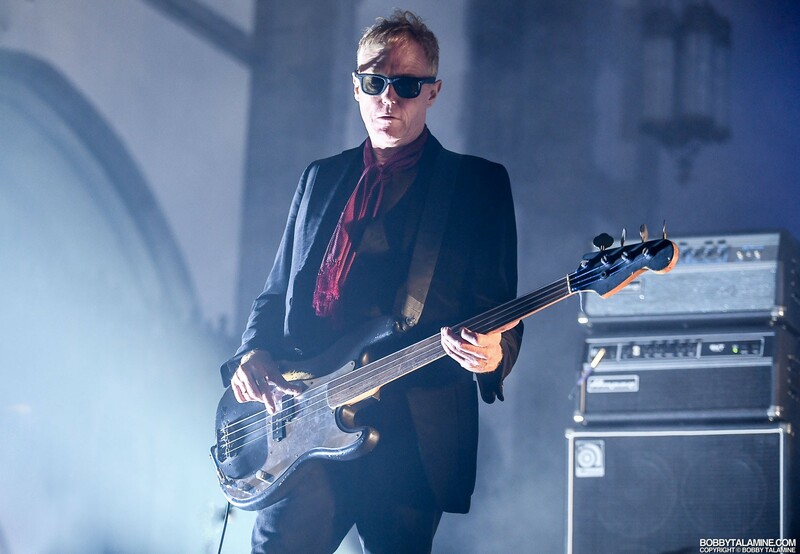 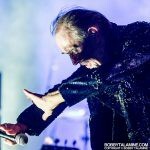 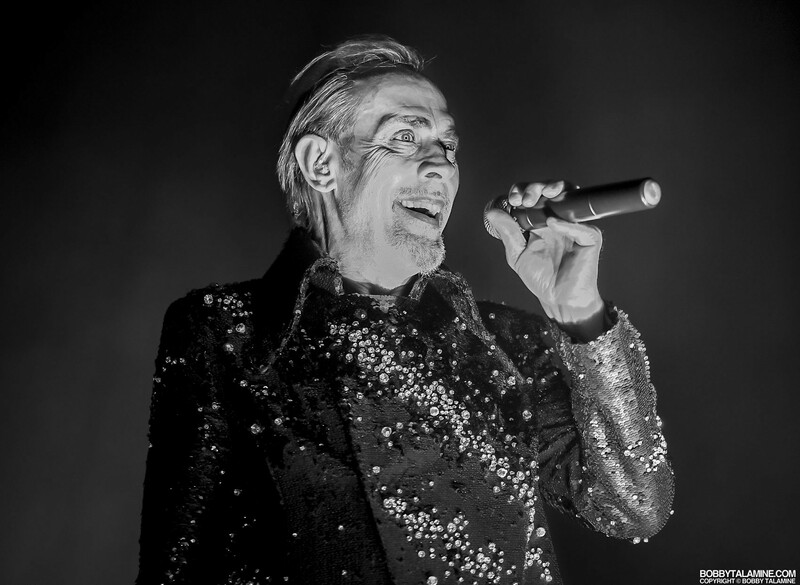 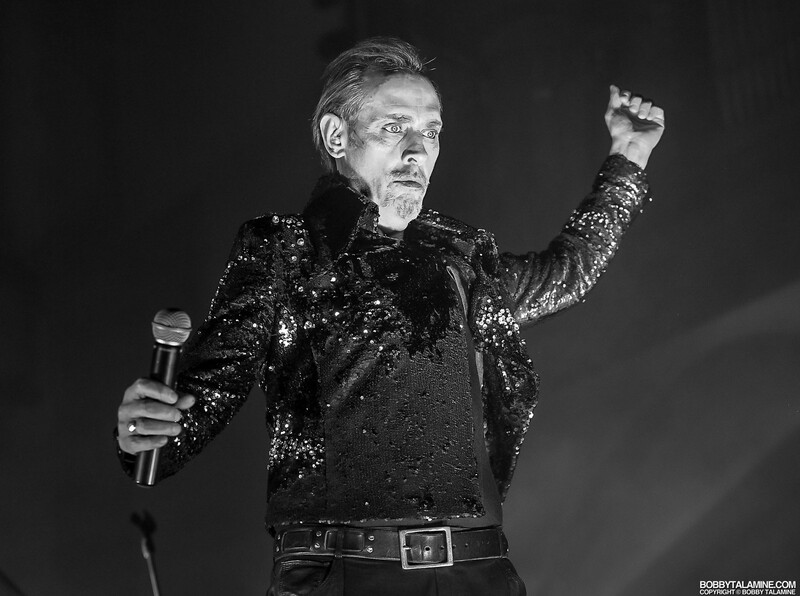 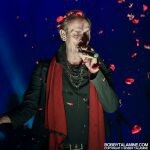 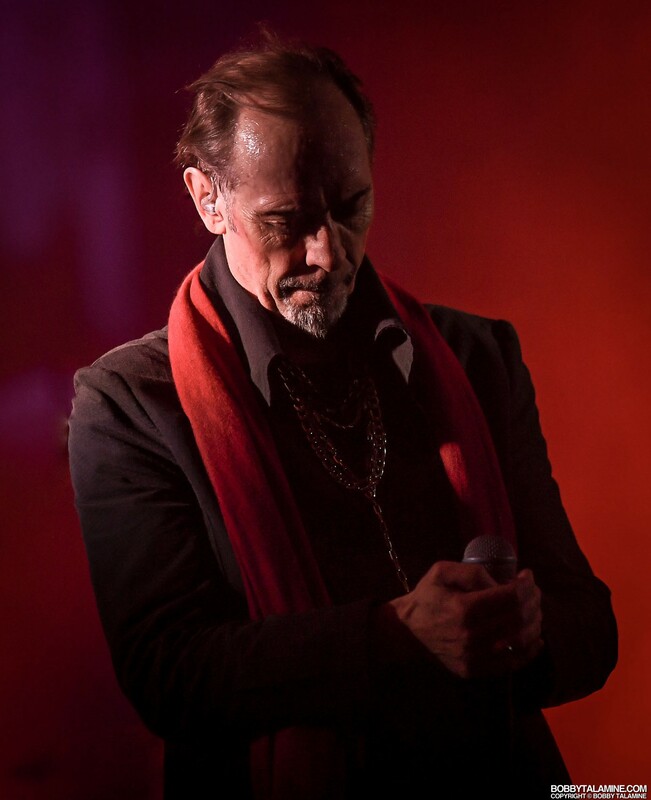 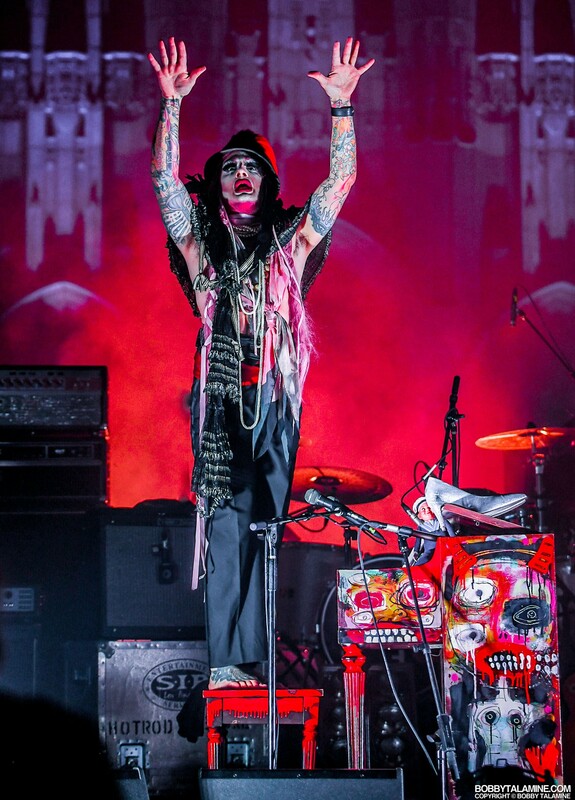 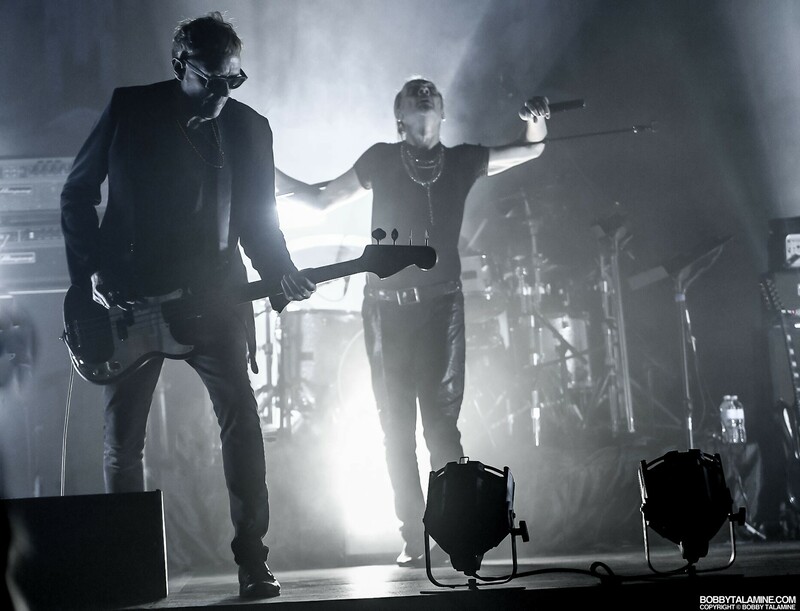 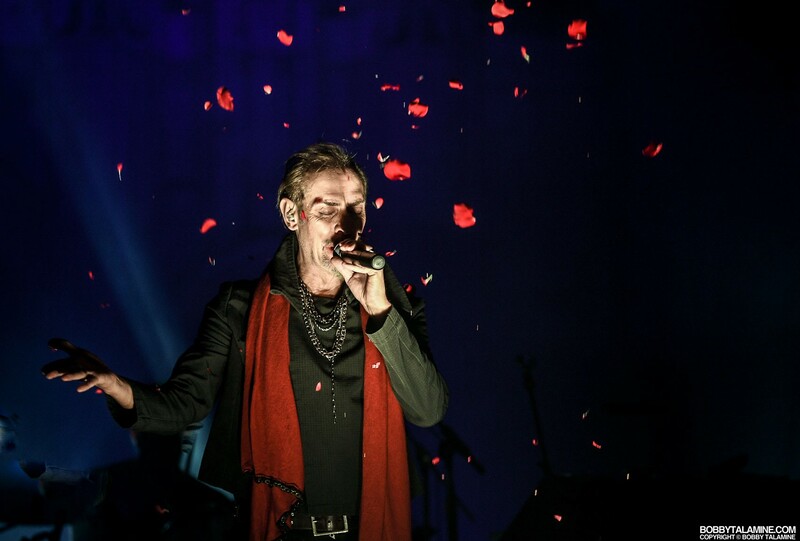 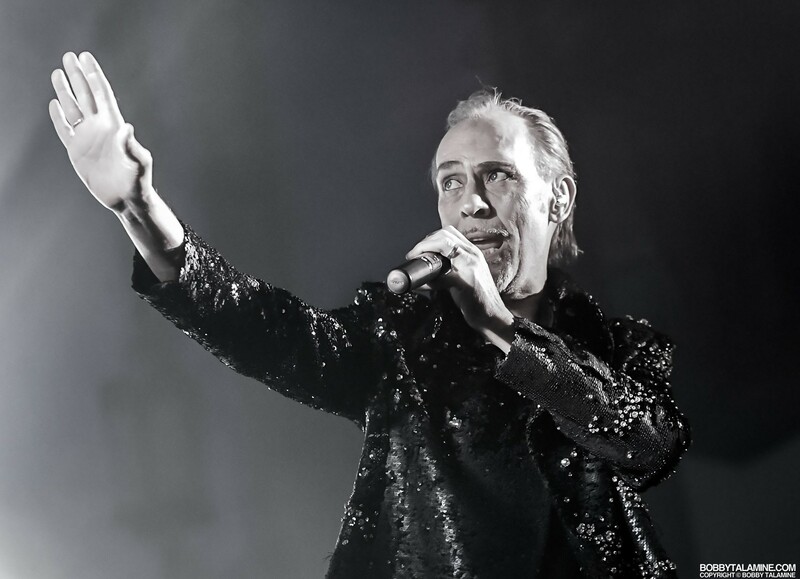 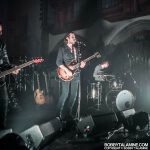 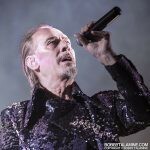 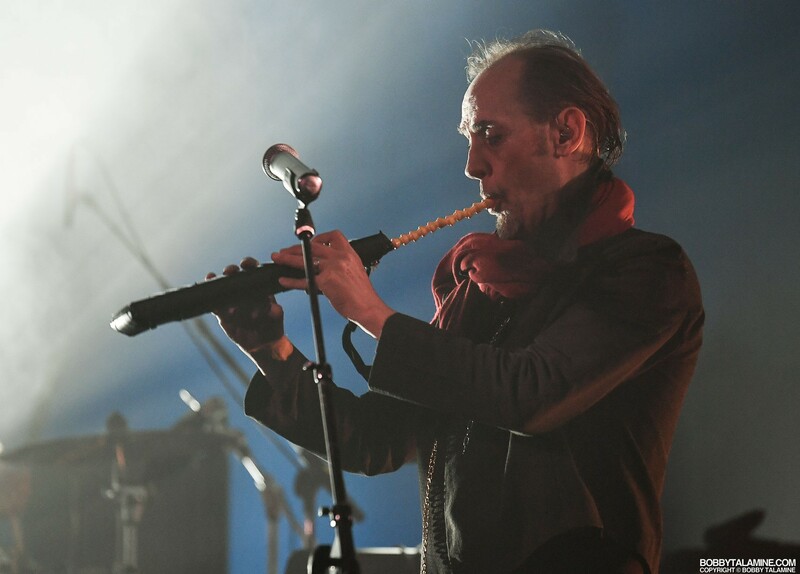 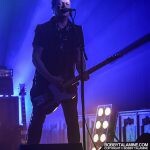 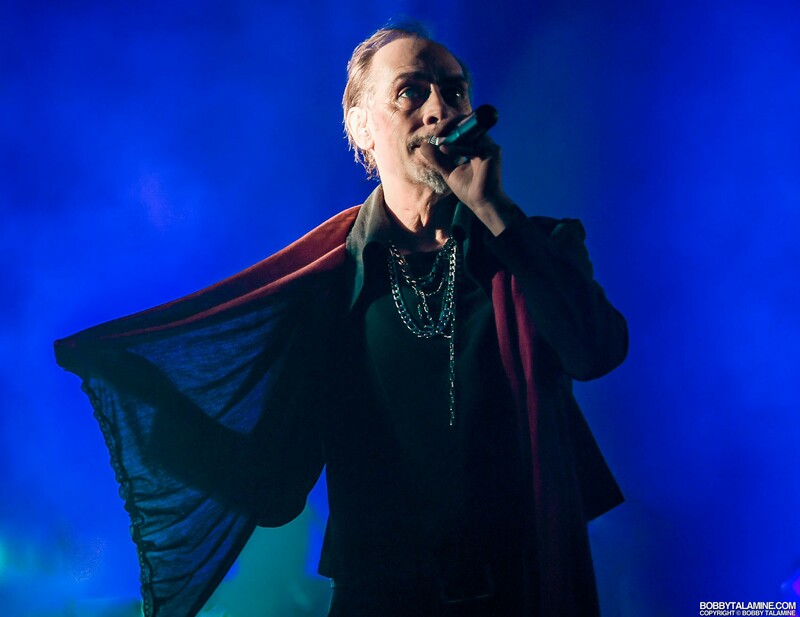 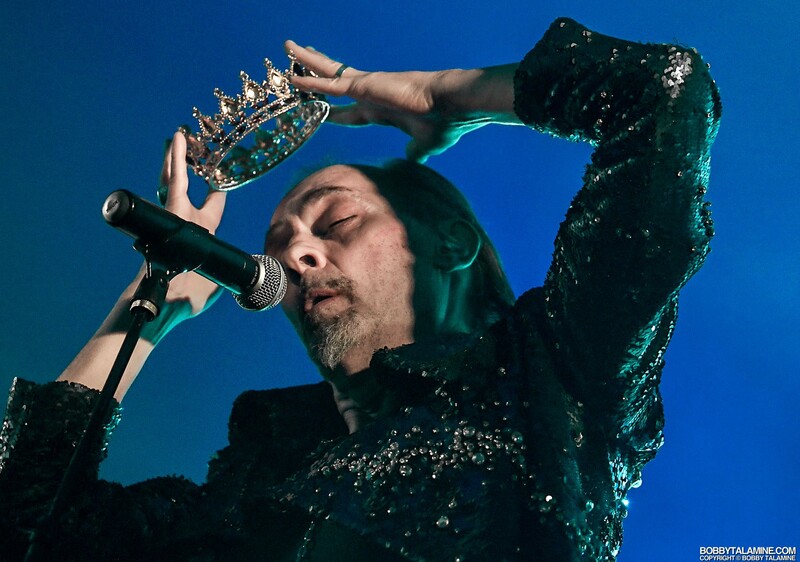 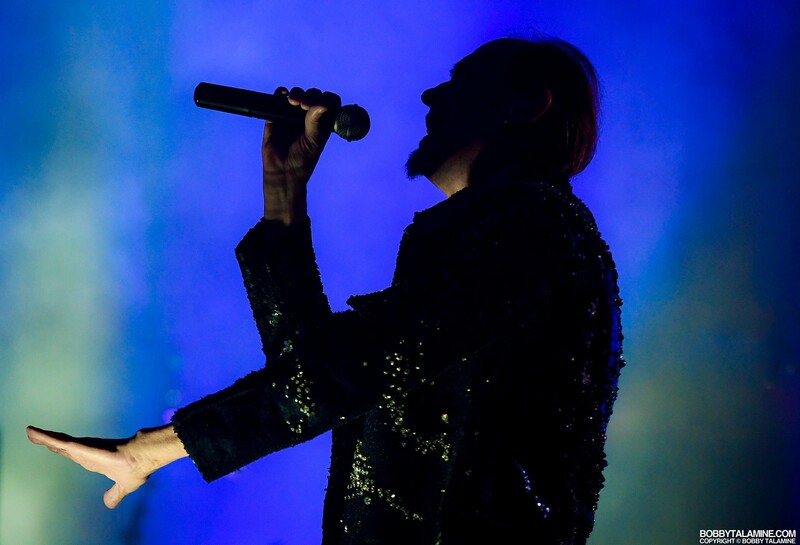 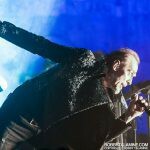 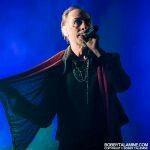 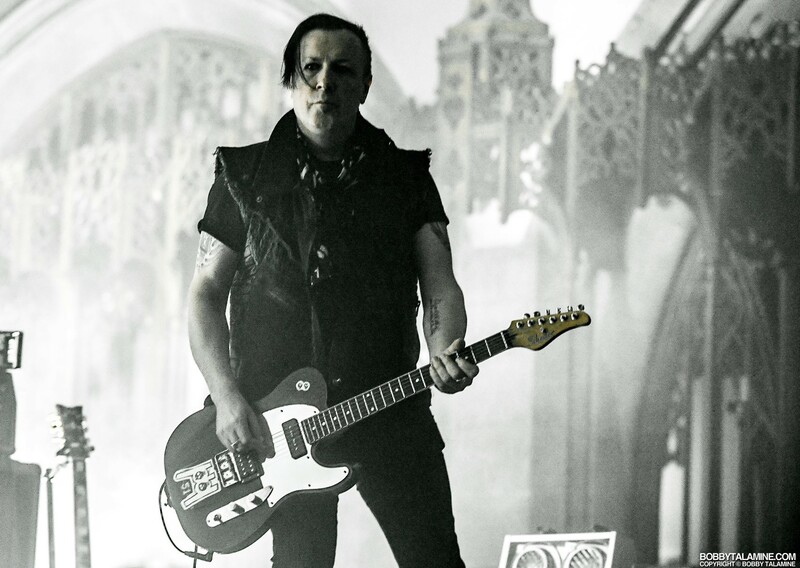 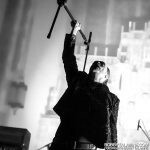 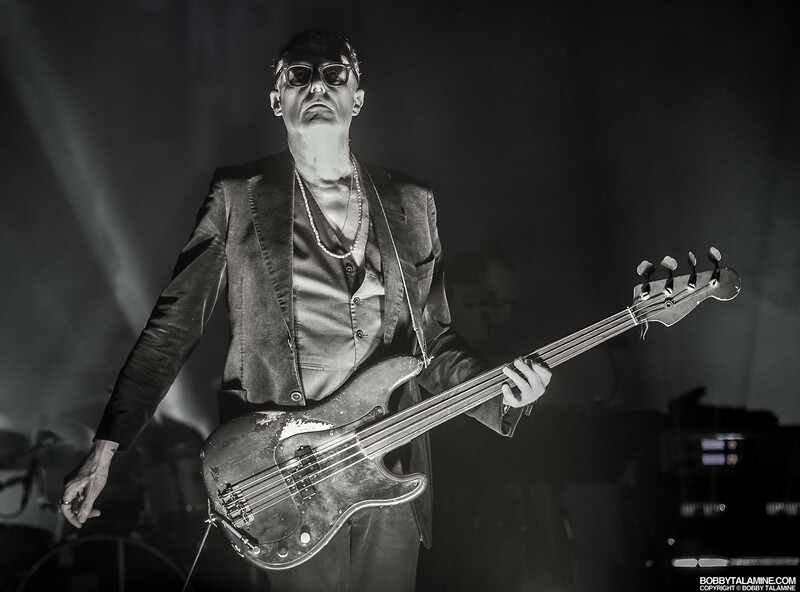 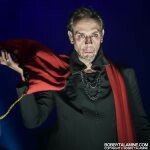 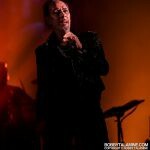 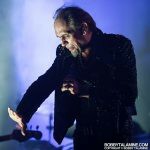 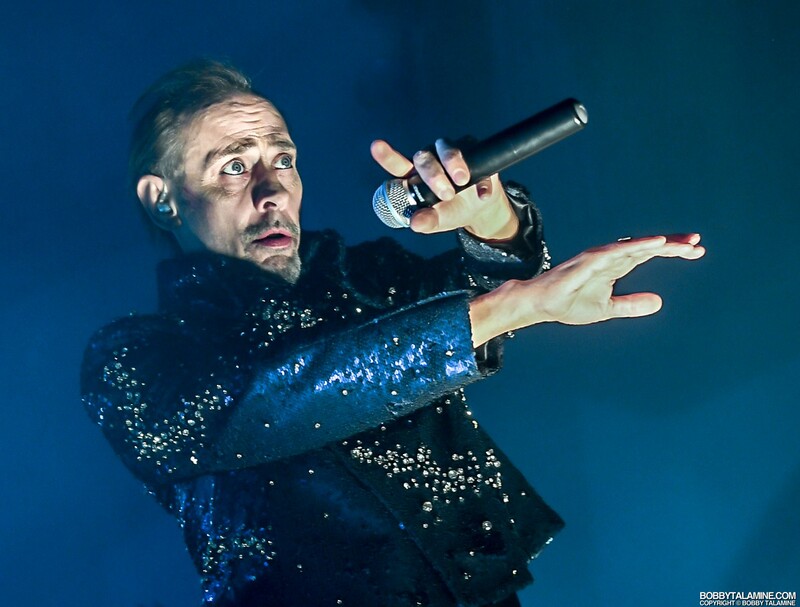 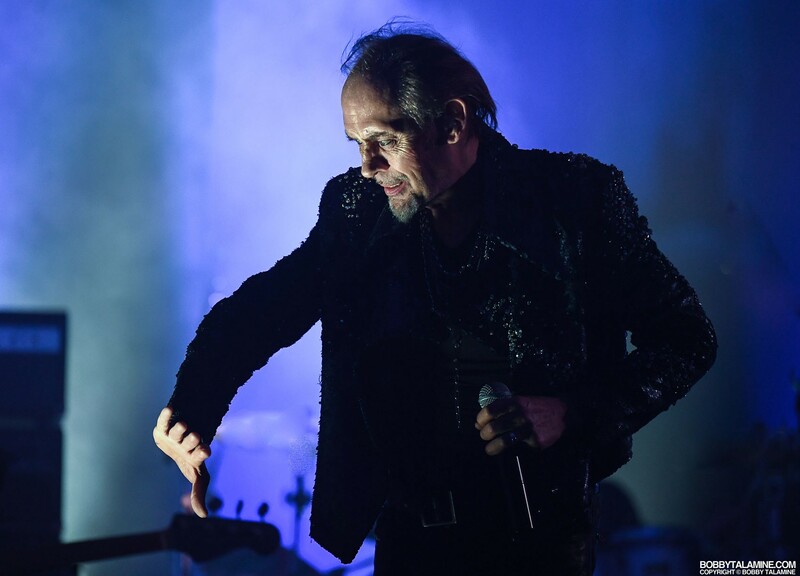 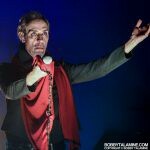 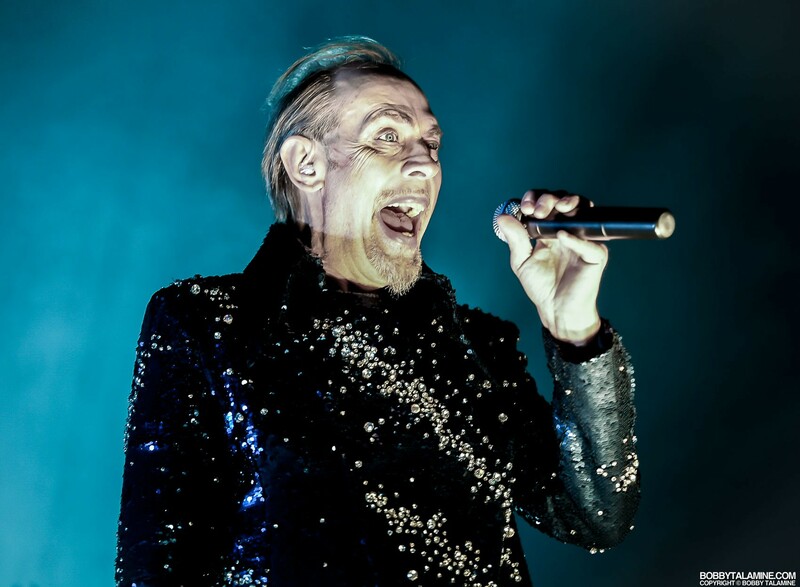 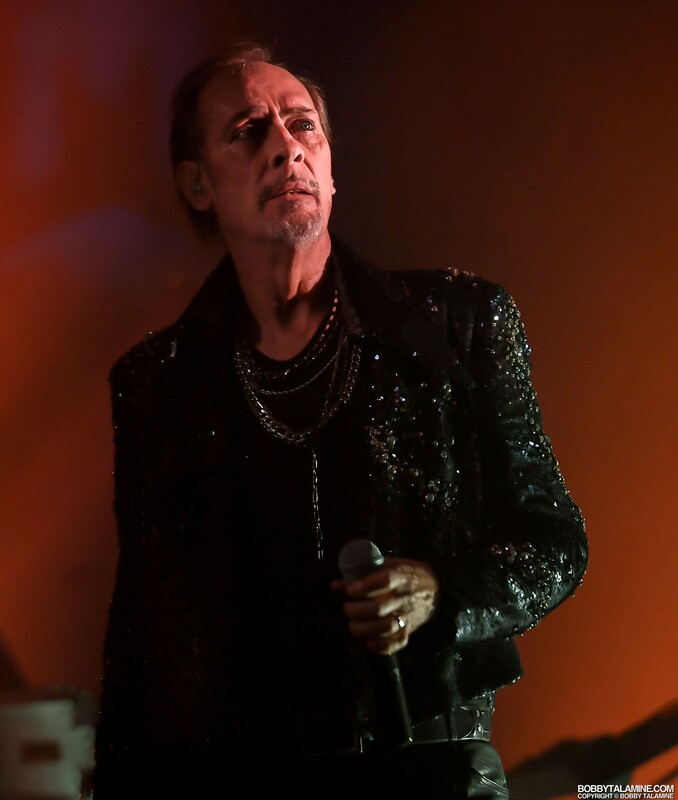 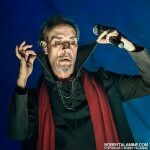 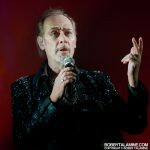 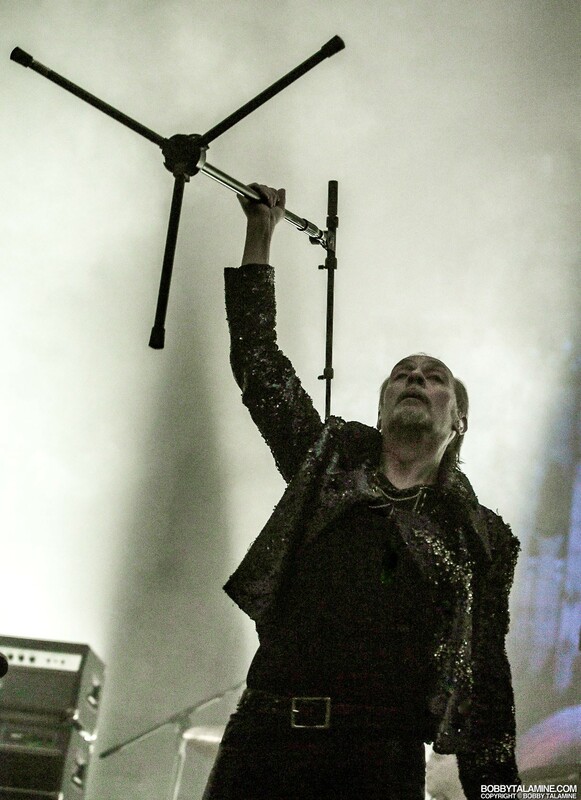 Keep in mind, Peter Murphy and David J are performing in the true definition of a “gothic cathedral”, at the Rockefeller Memorial Chapel, which is the spiritual and ceremonial center of the University of Chicago, nestled in the center of Hyde Park. 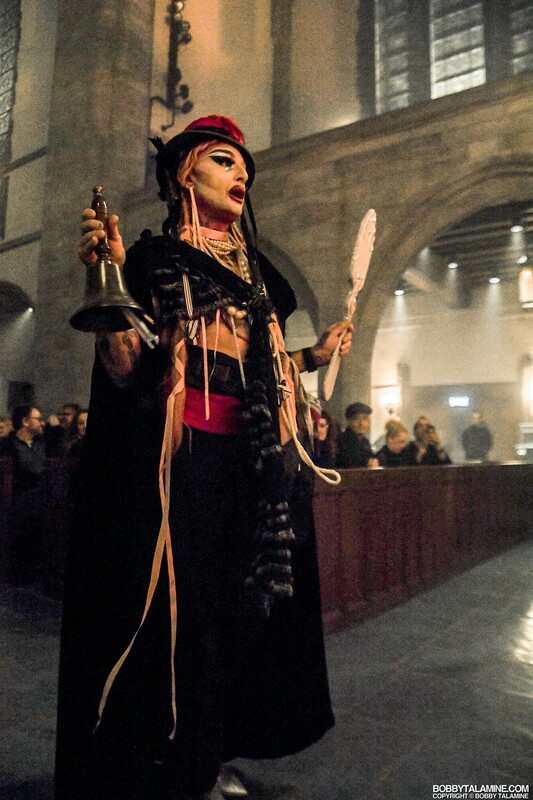 Resembling a medieval cathedral in appearance and size, it hosts festivals and ceremonies of many world religious traditions, as well as Sunday services. 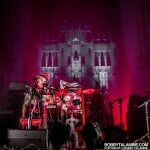 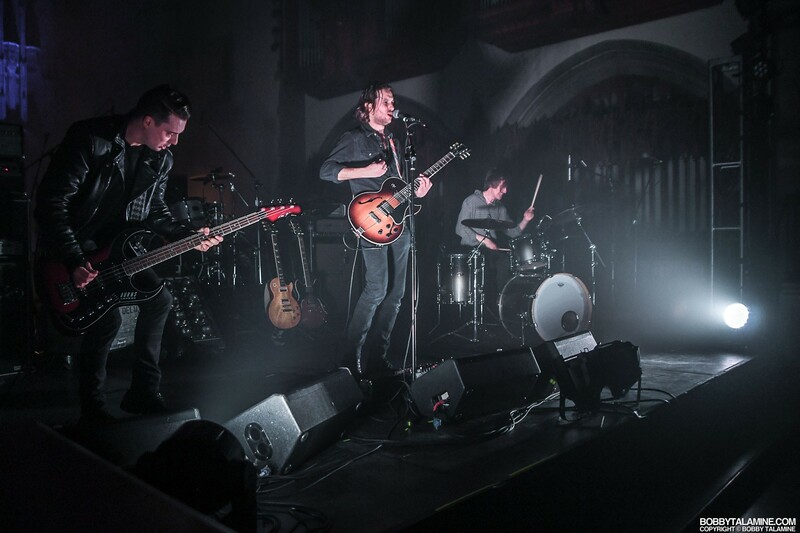 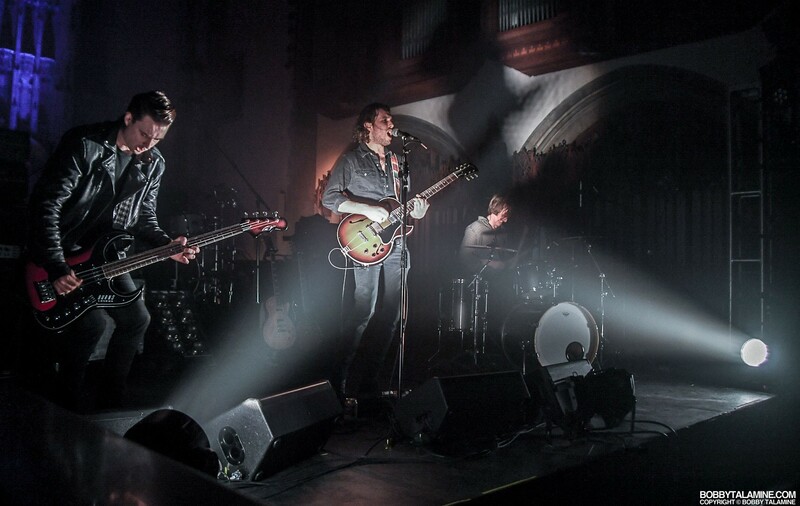 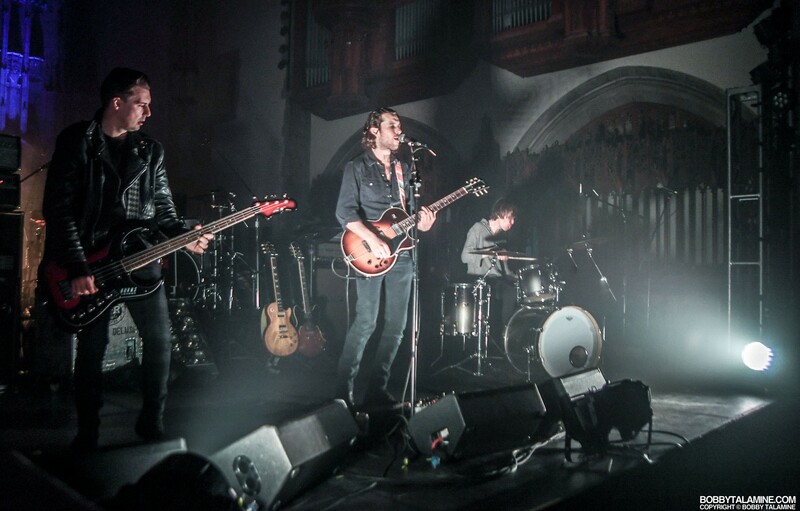 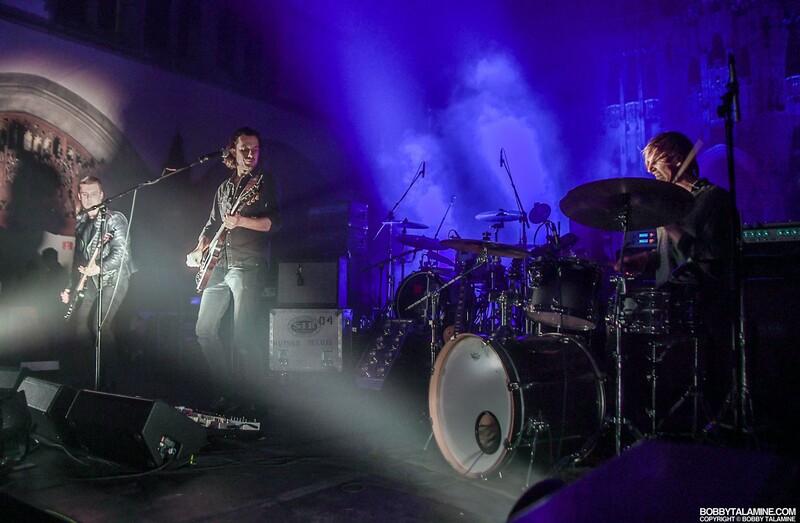 Comprised of intimidating and soaring architecture, along with wood plank floors and pews, and two massive stained glass windows embracing the north and south faces of the cathedral, you’re left to look around in amazed wonderment in what to expect even before Peter and David play their first note. 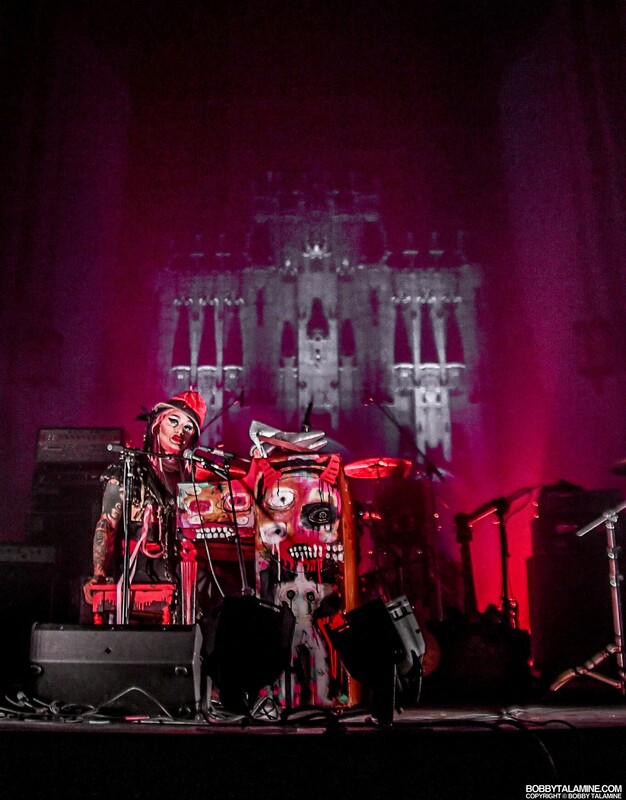 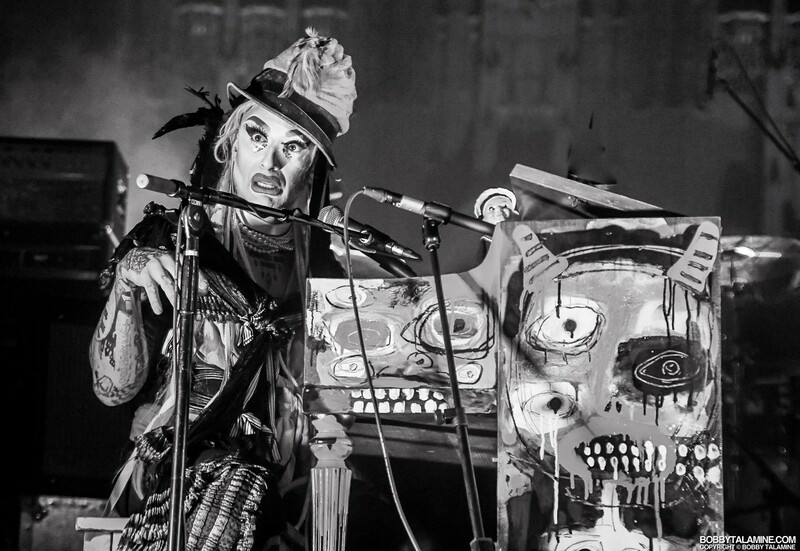 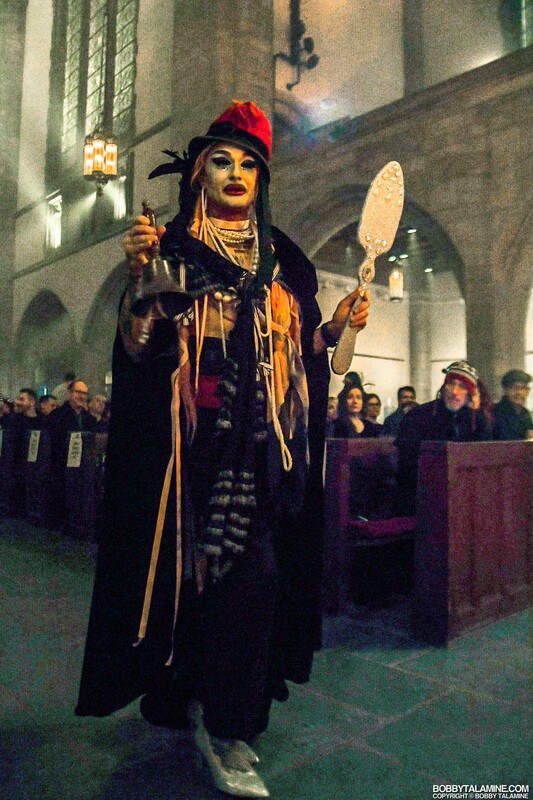 Intimidating and foreboding in every way, speaking of both the cathedral and the performers equal to the match. 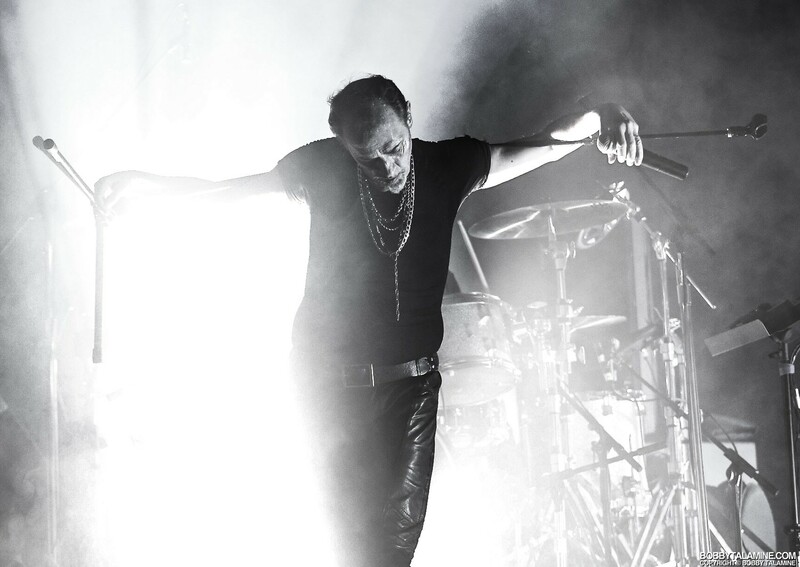 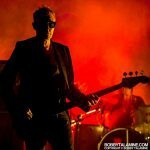 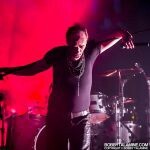 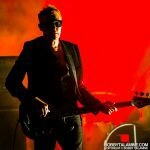 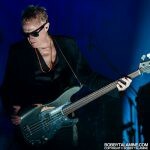 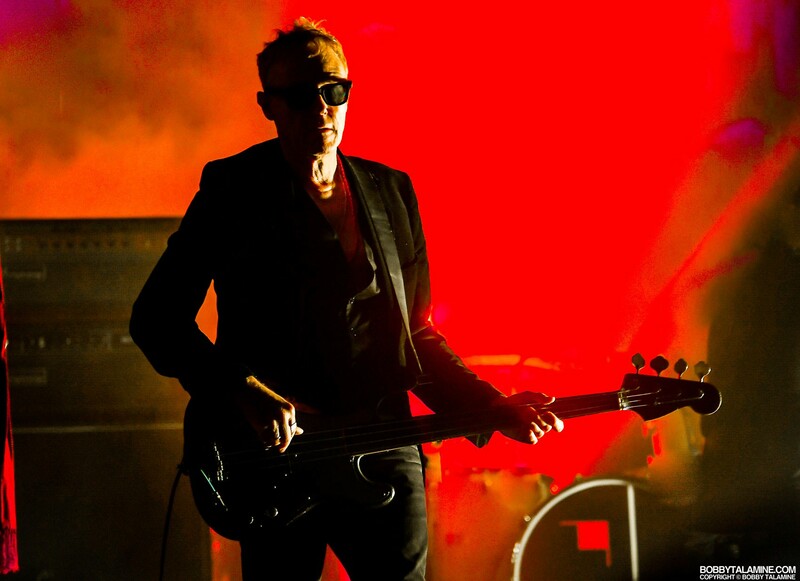 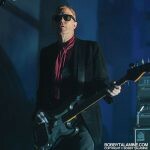 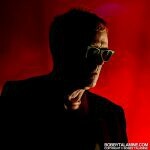 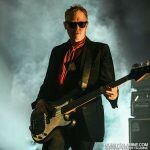 On this current tour celebrating the debut of Bauhaus, Peter Murphy is joined by bassist extraordinaire David J, a remarkable songwriter in his own right, along with the brilliant and amazingly talented guitarist Mark Gemini Thwaite, a musician’s musician who has a long and varied history of playing with some heavy hitters such as The Mission, Tricky, and Spear of Destiny to name a few. 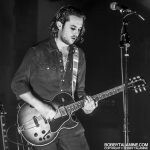 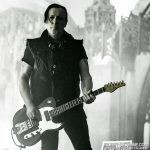 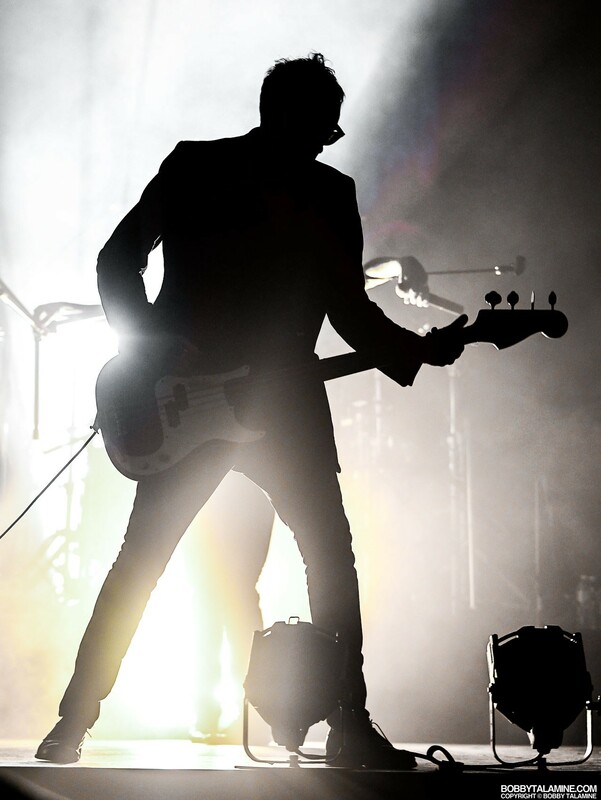 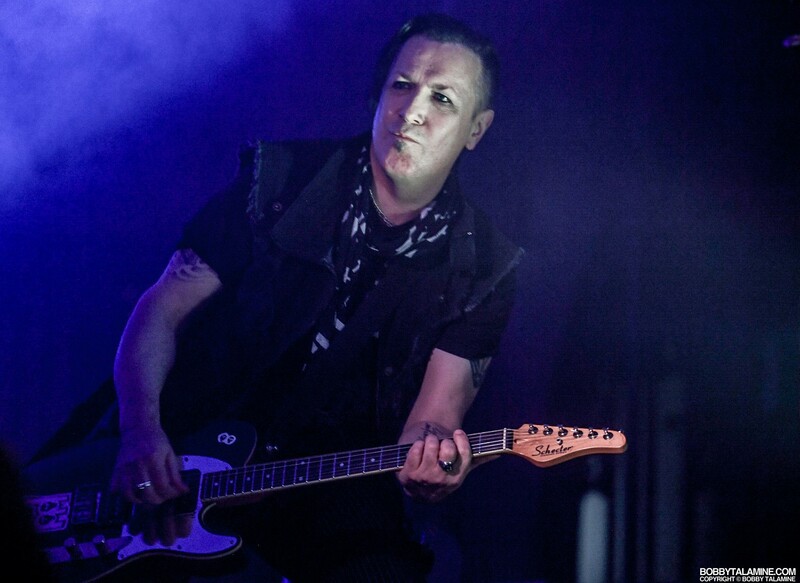 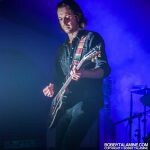 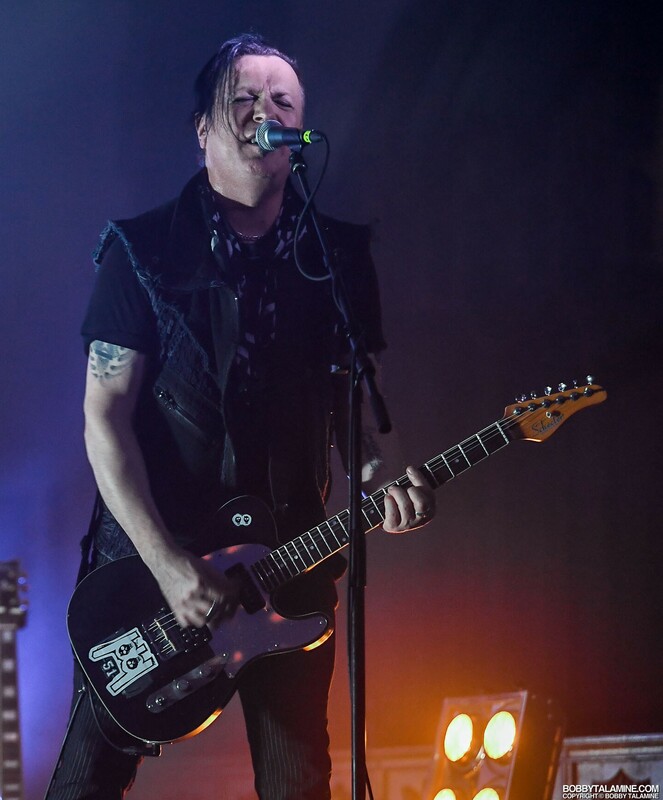 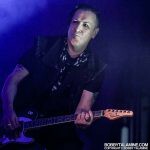 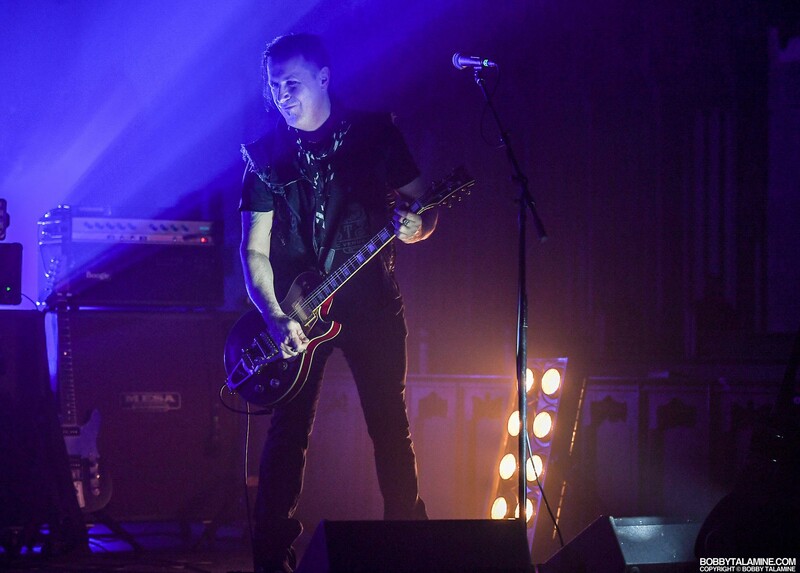 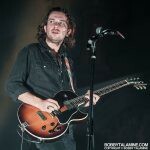 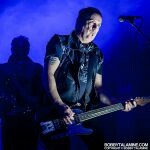 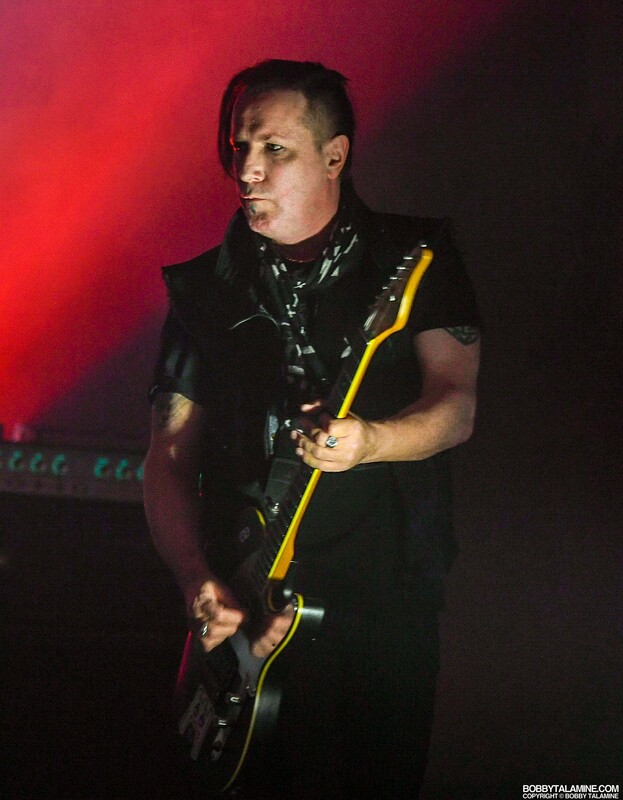 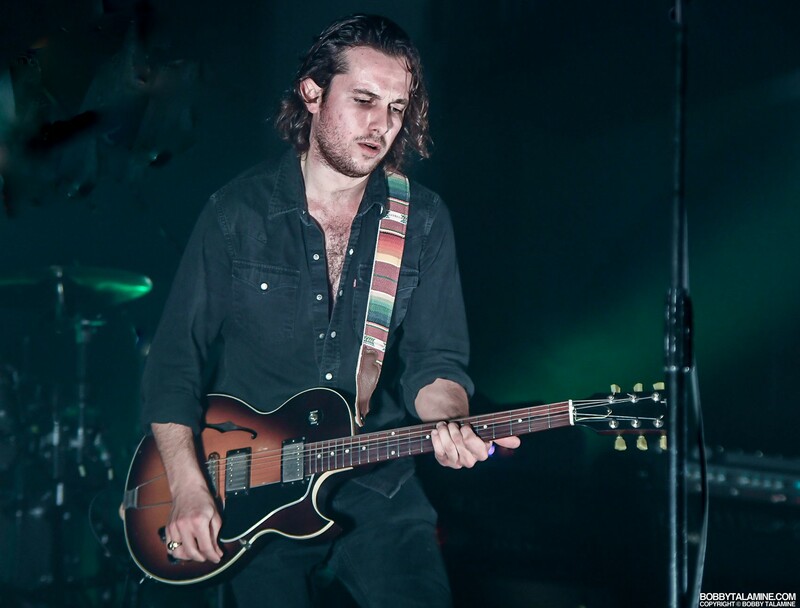 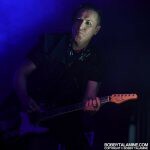 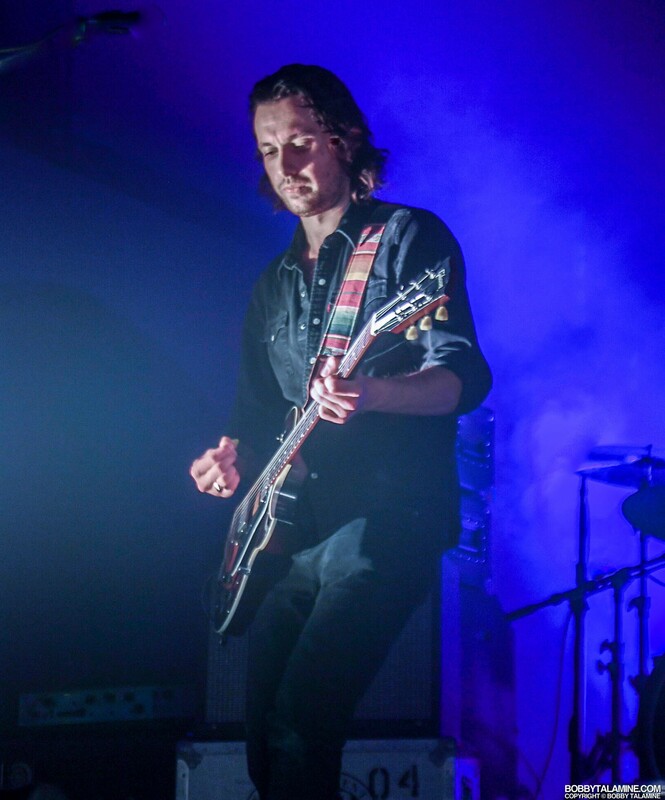 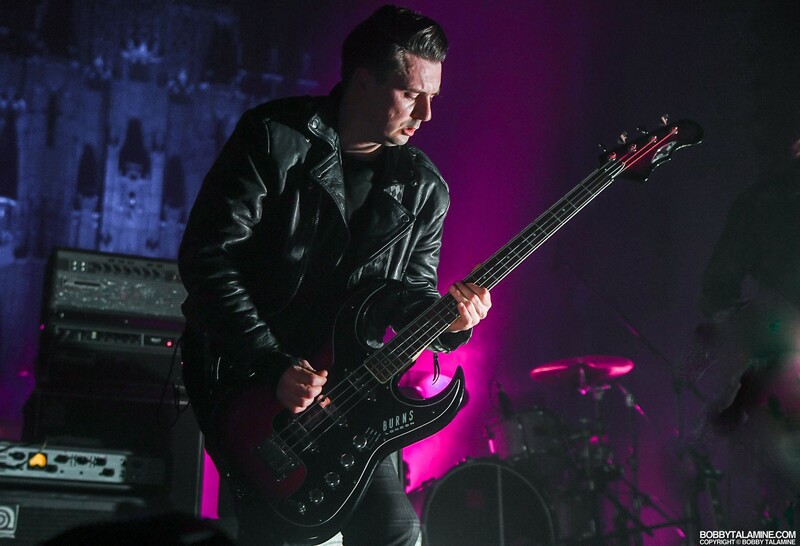 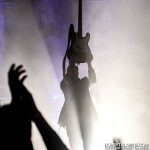 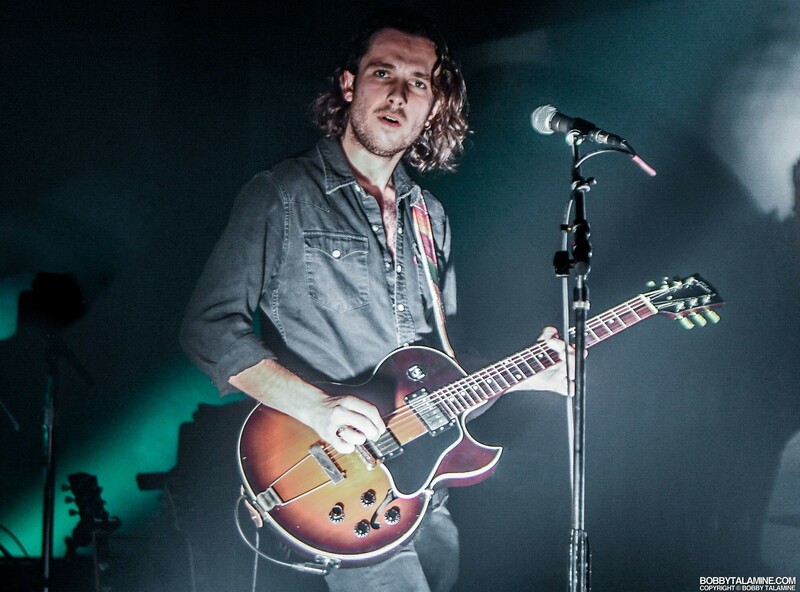 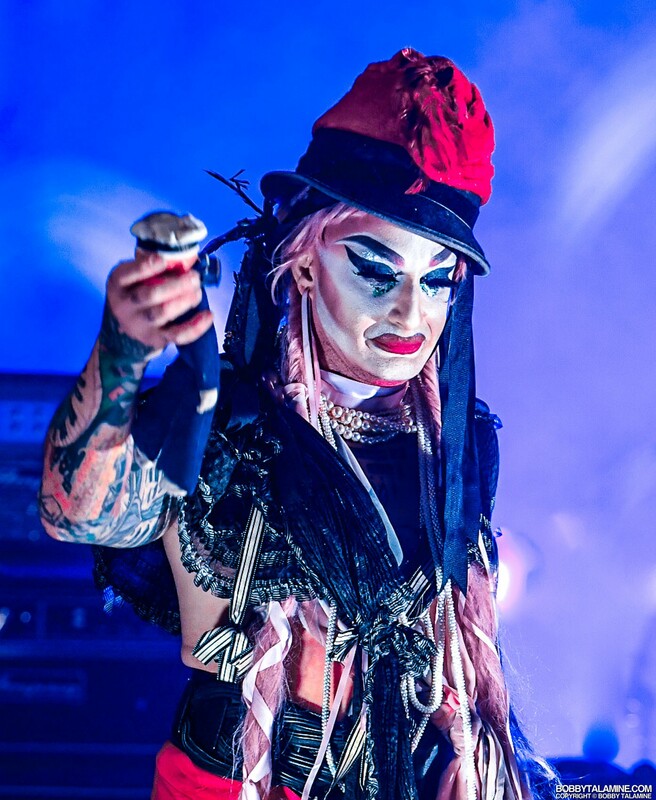 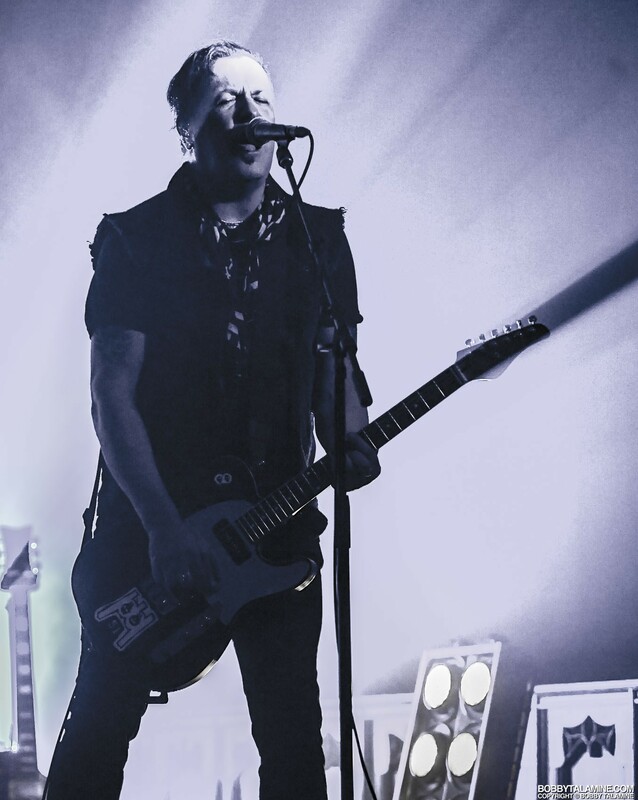 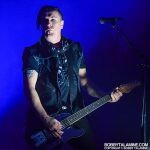 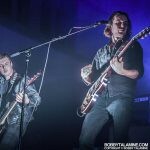 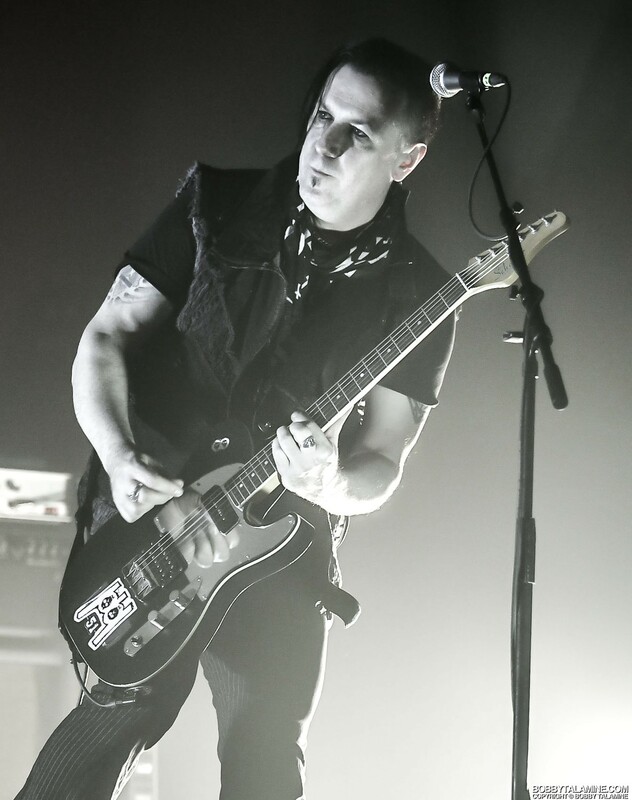 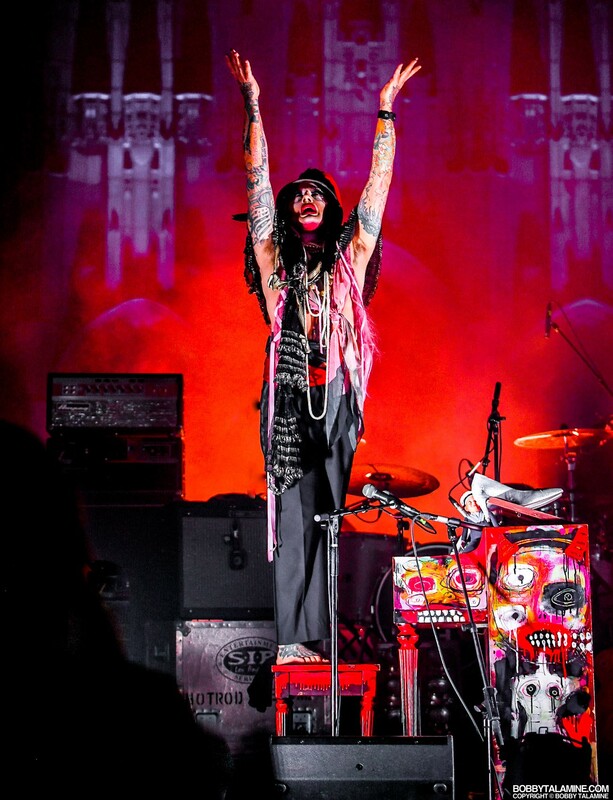 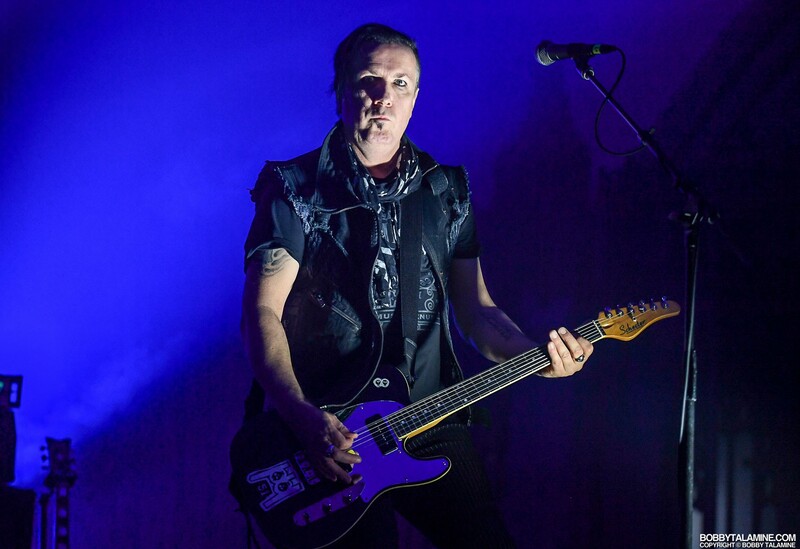 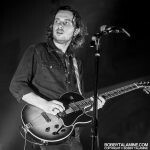 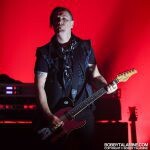 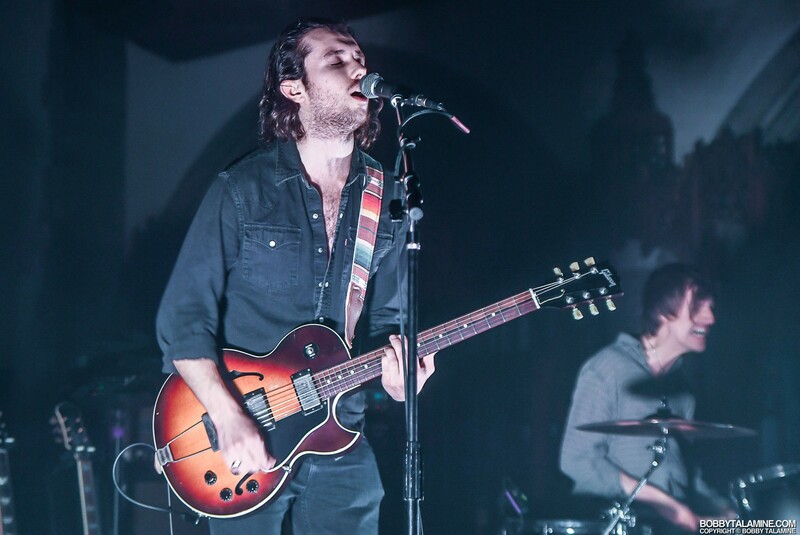 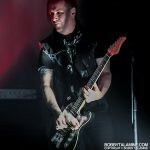 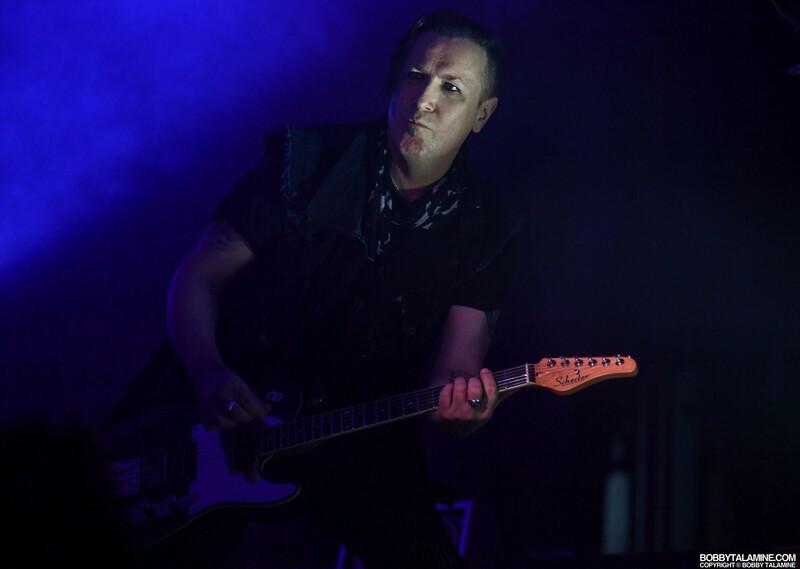 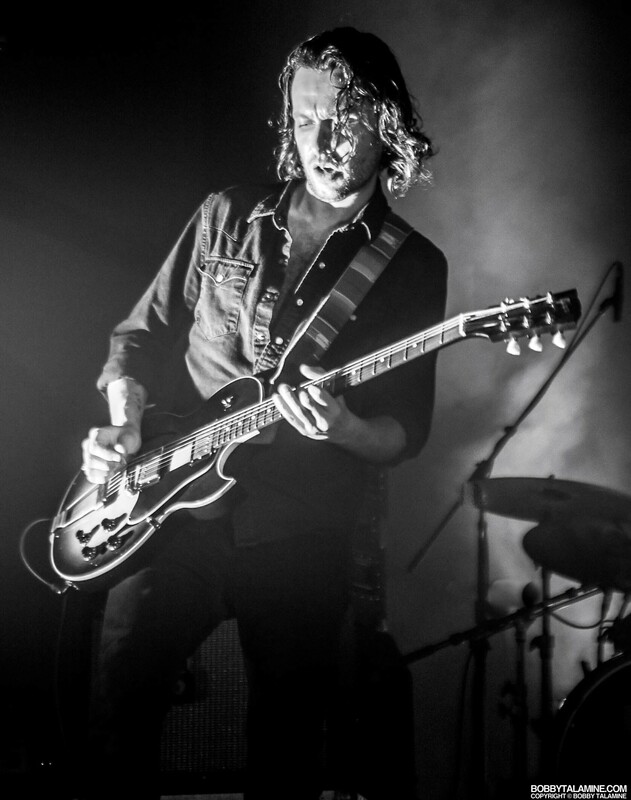 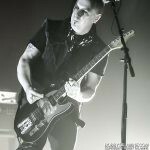 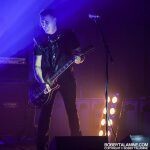 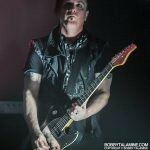 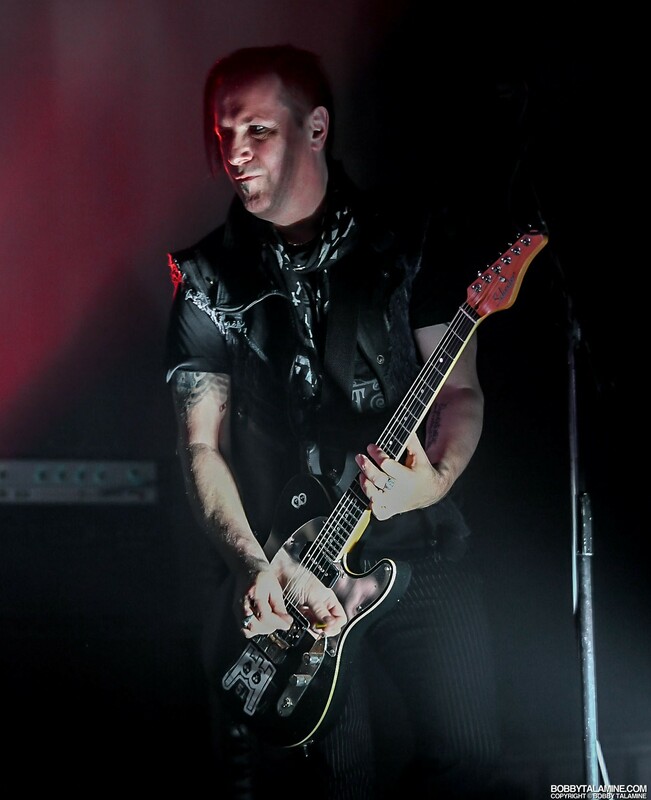 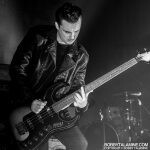 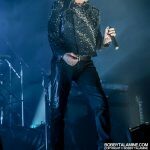 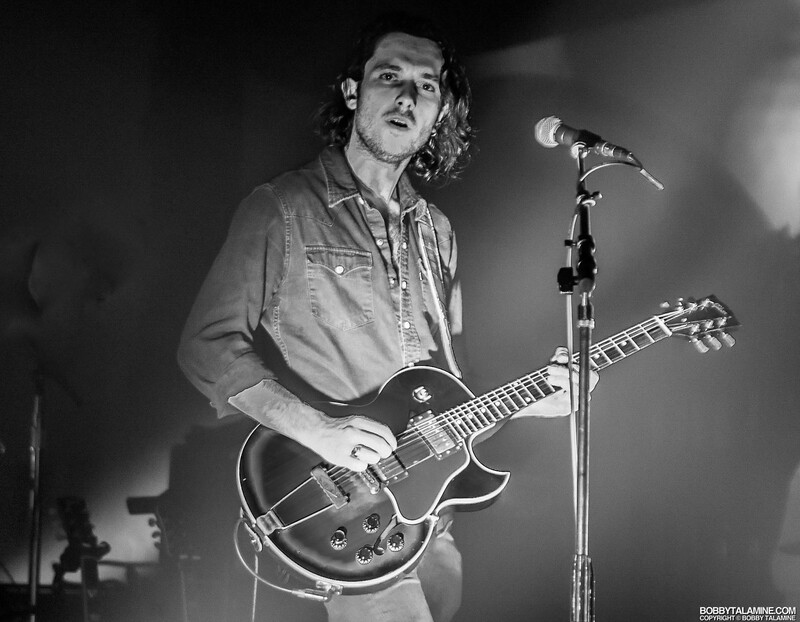 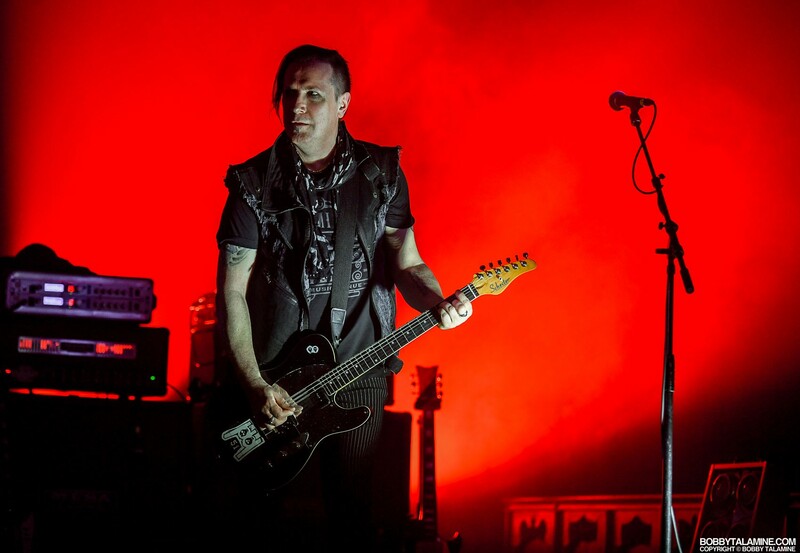 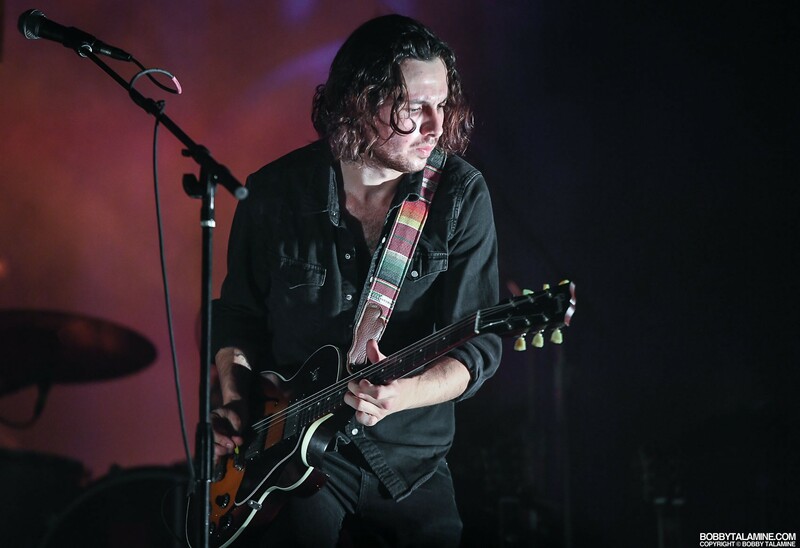 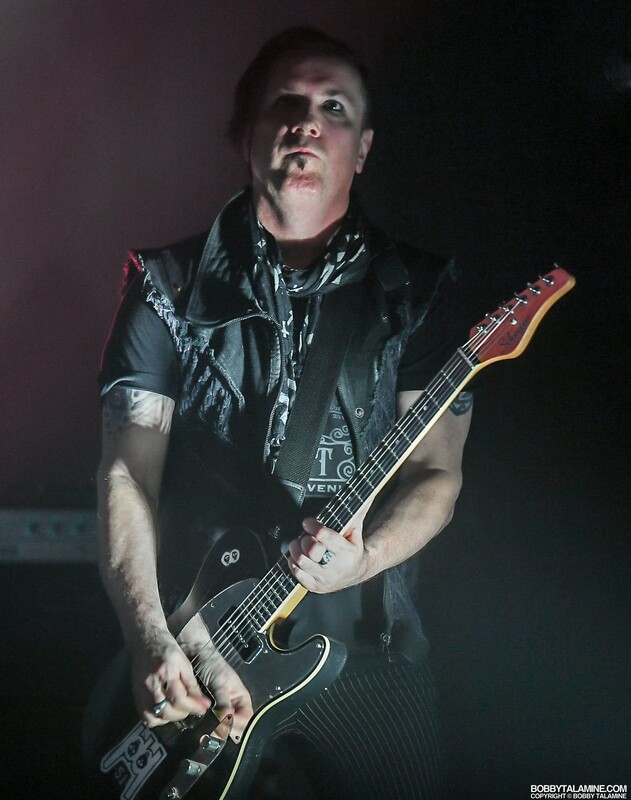 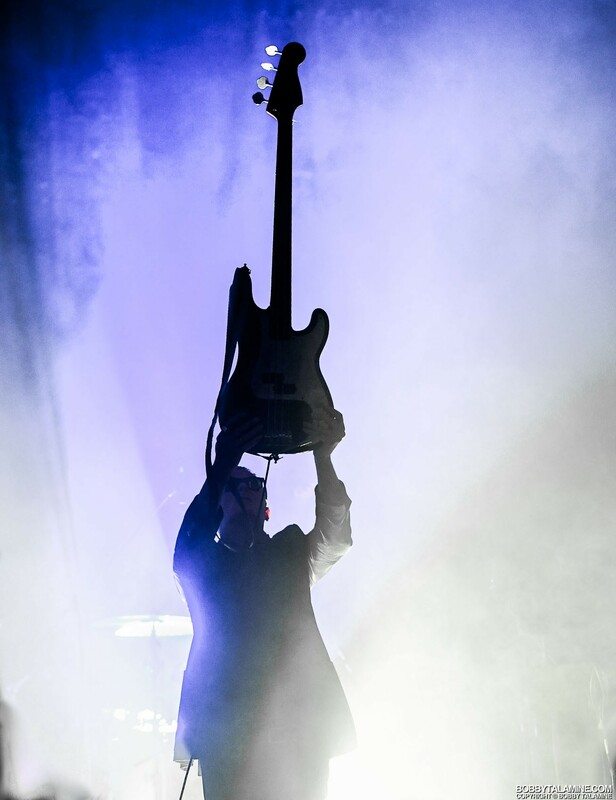 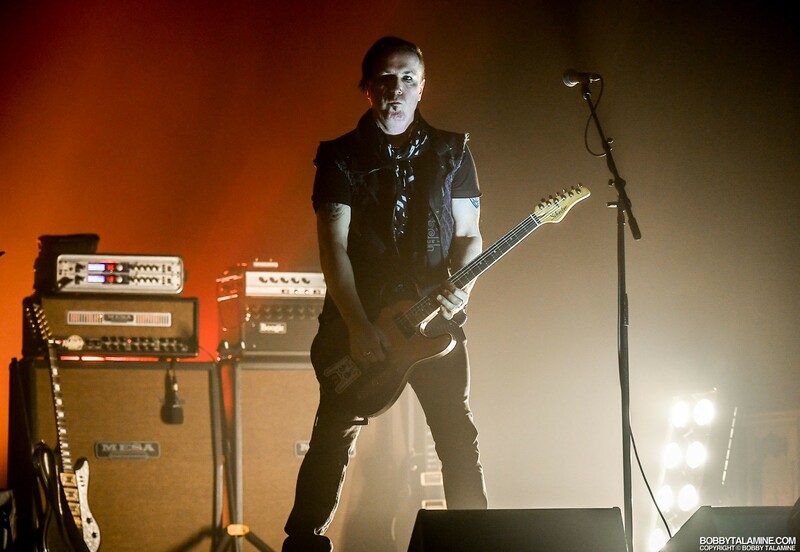 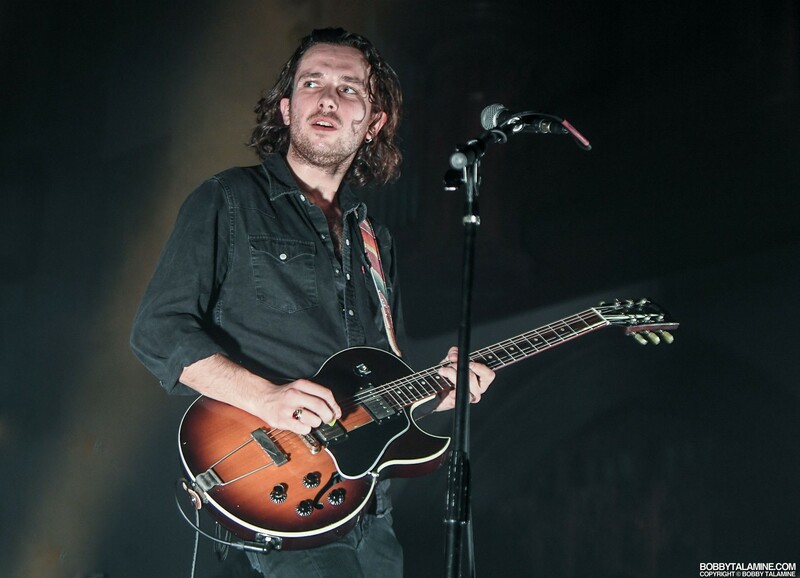 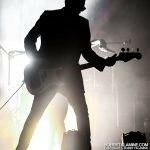 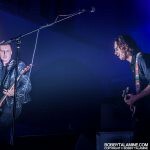 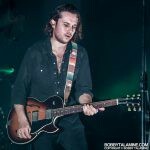 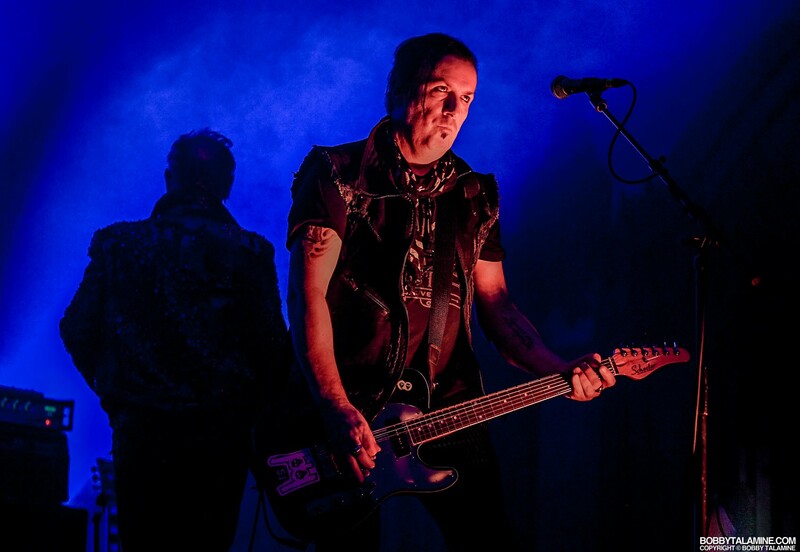 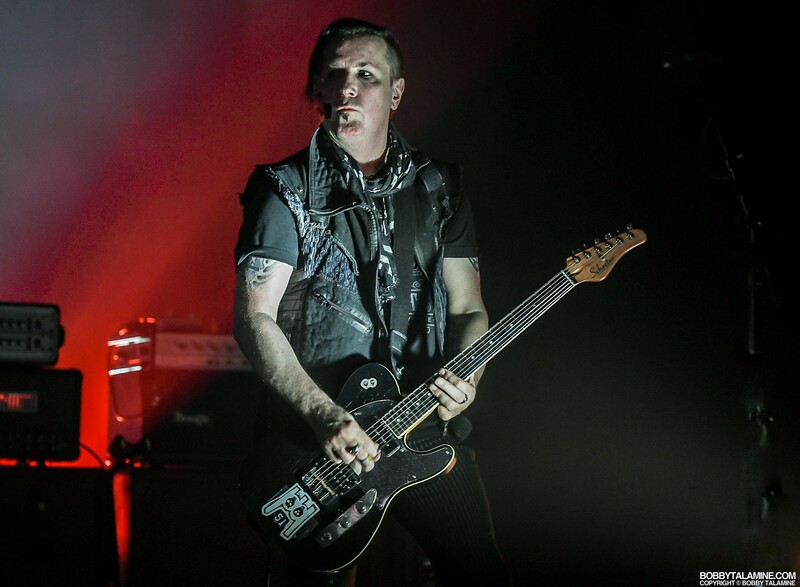 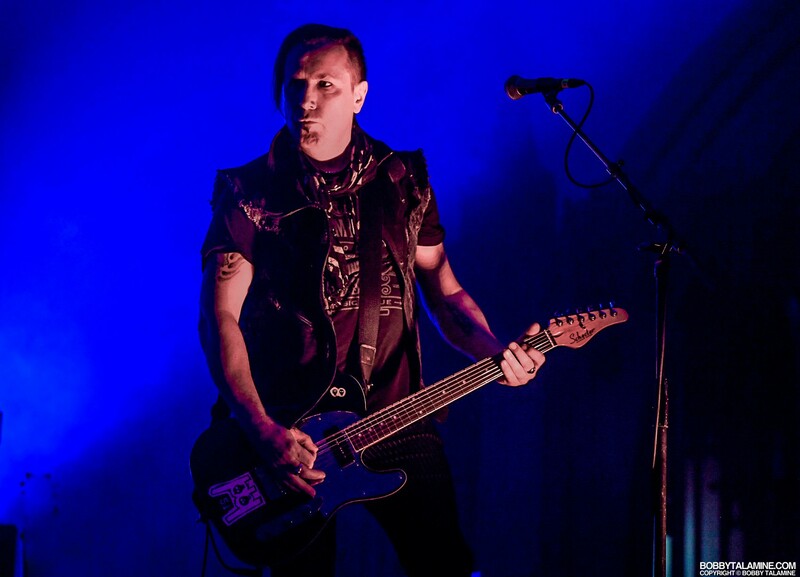 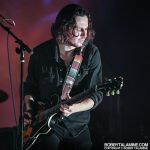 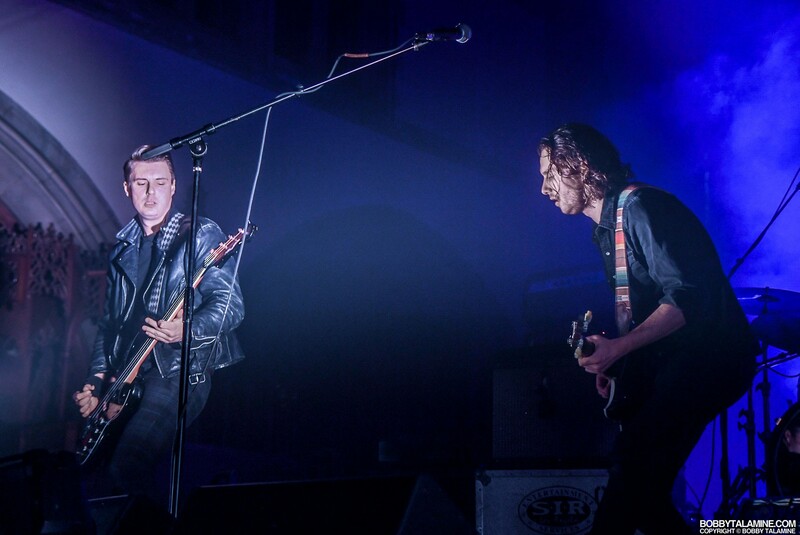 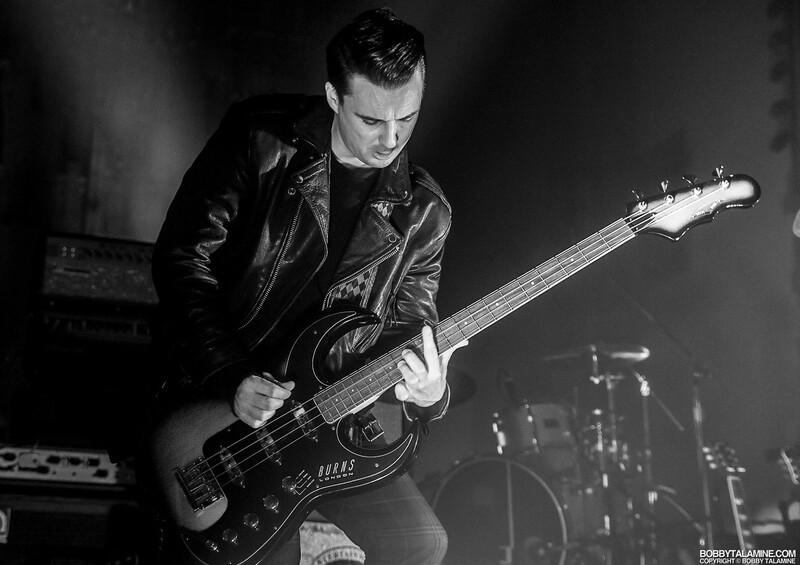 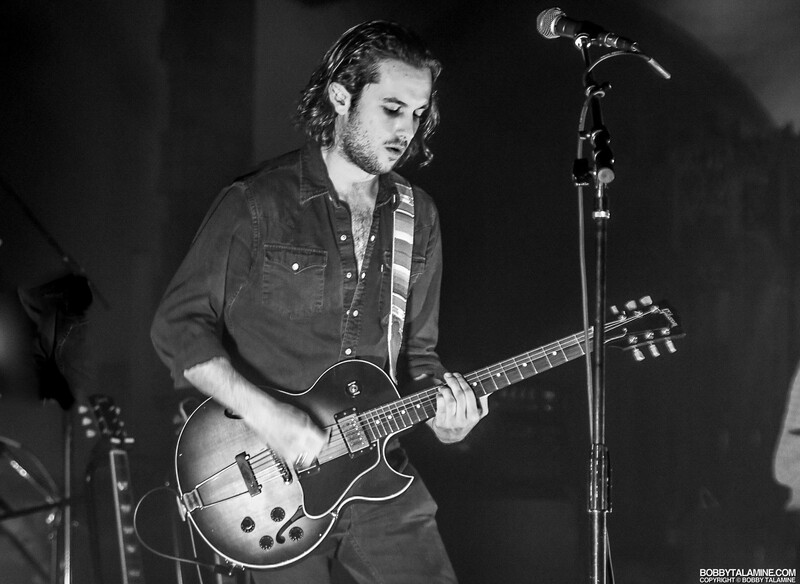 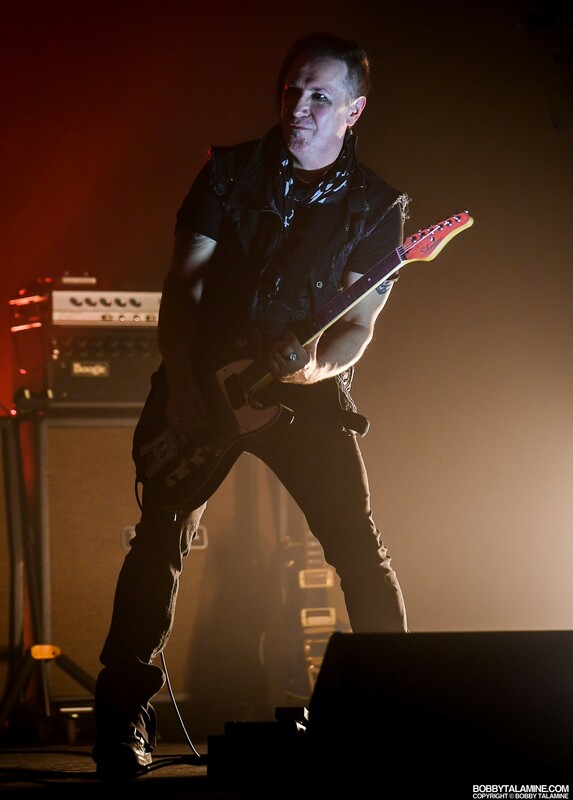 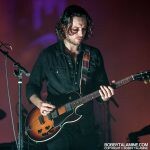 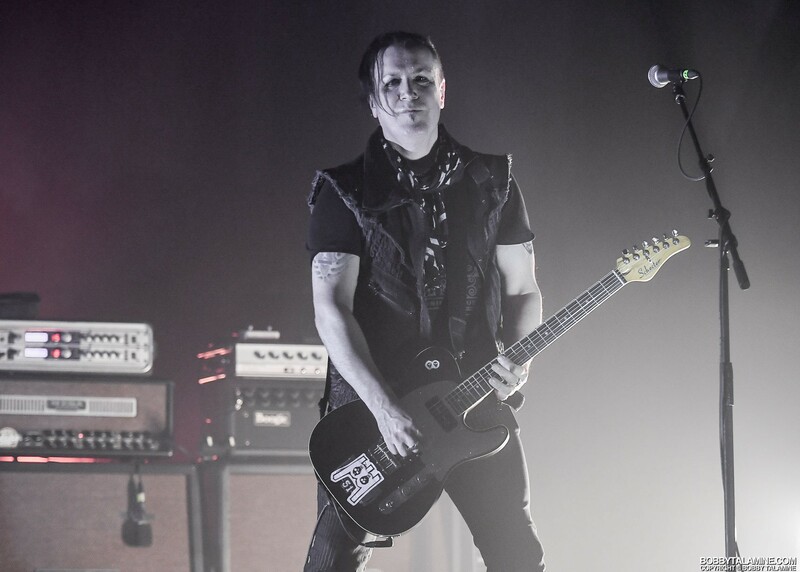 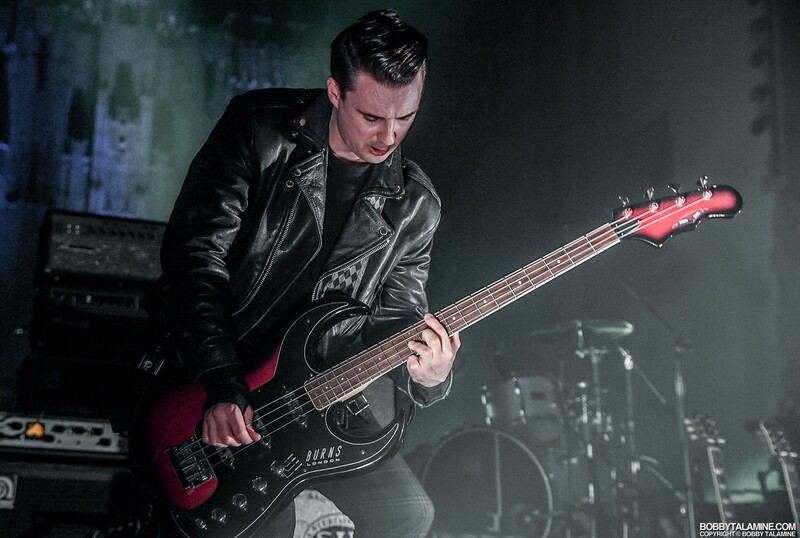 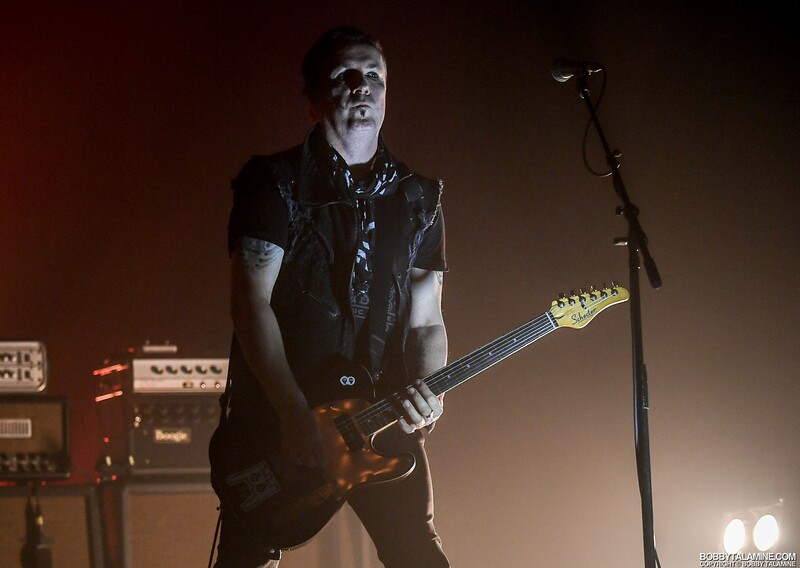 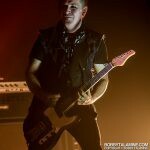 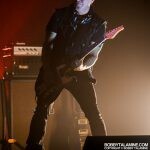 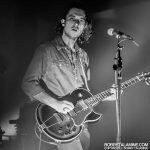 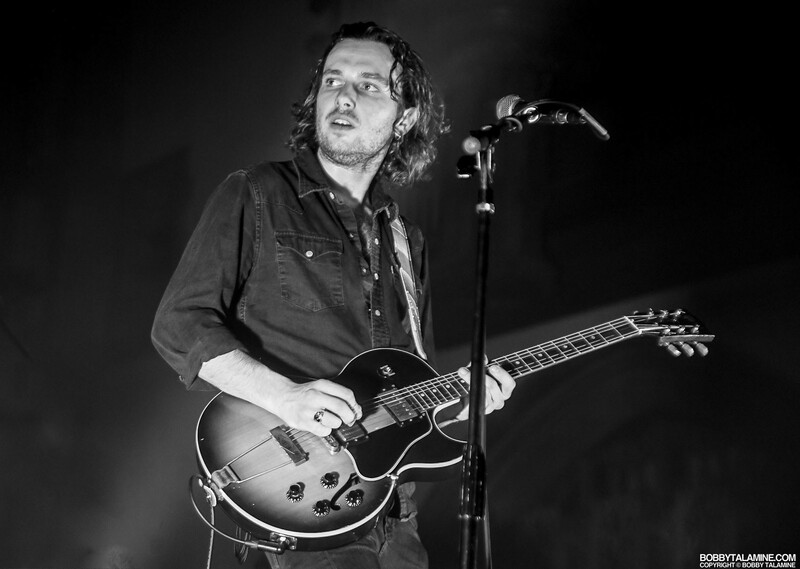 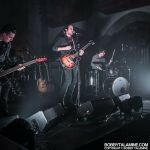 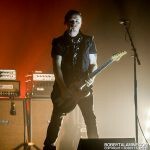 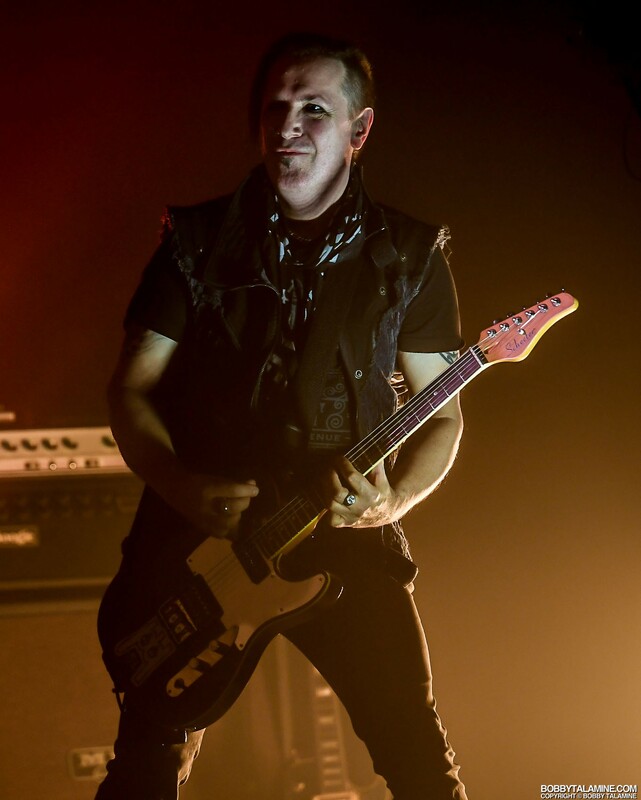 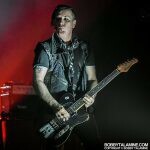 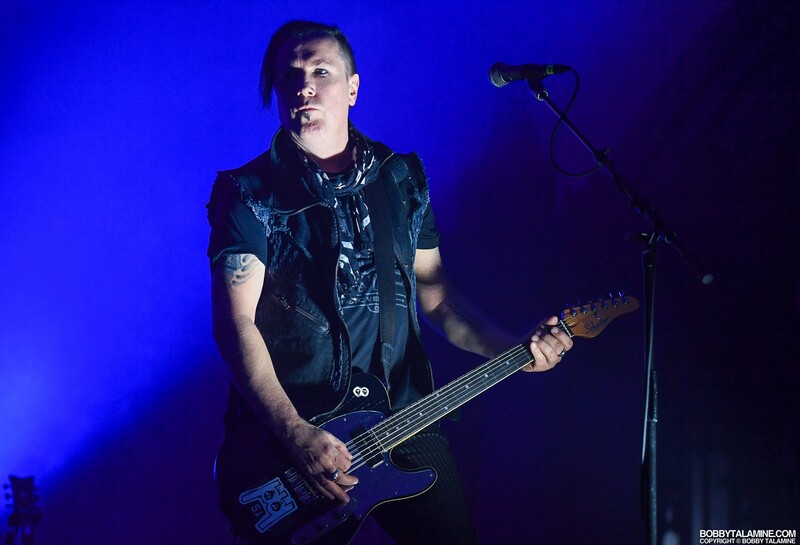 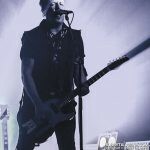 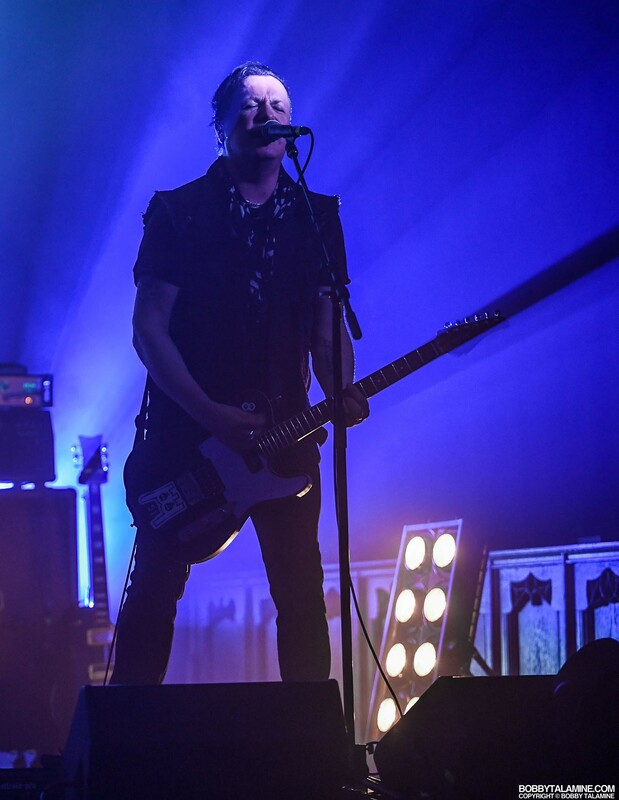 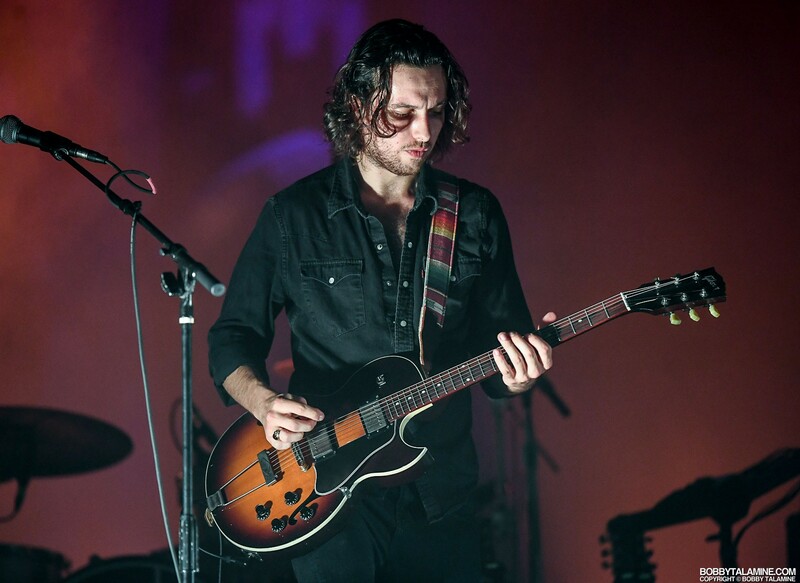 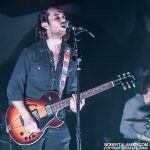 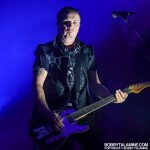 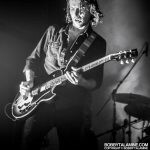 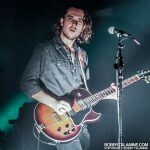 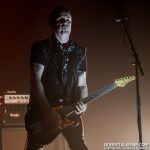 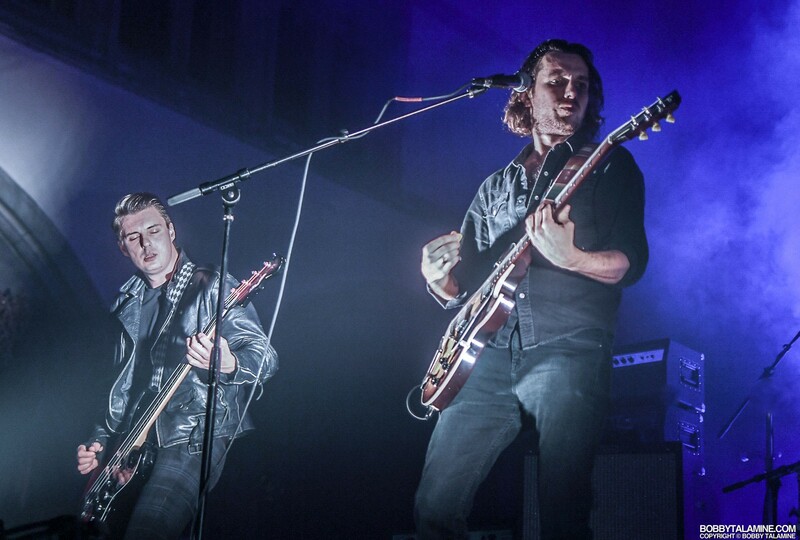 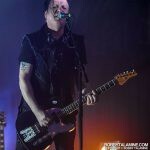 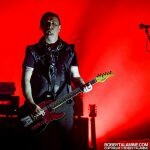 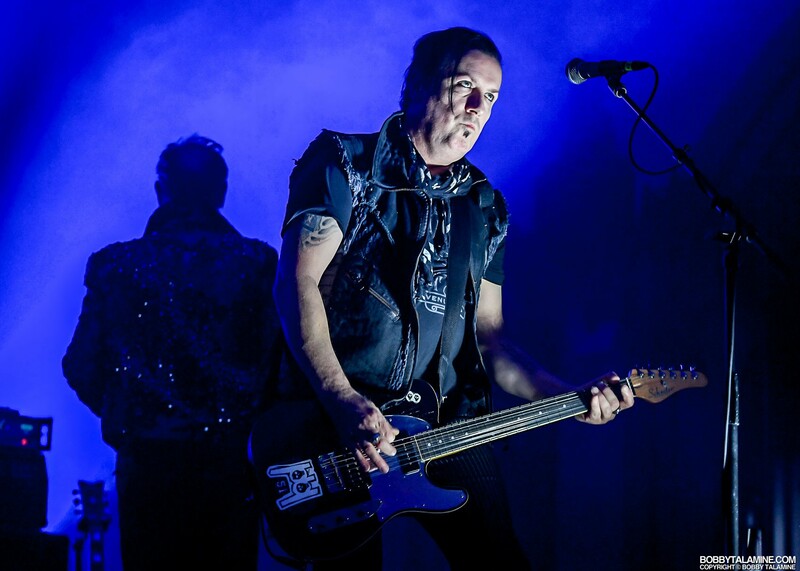 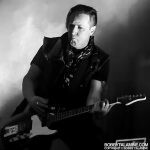 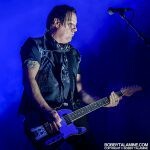 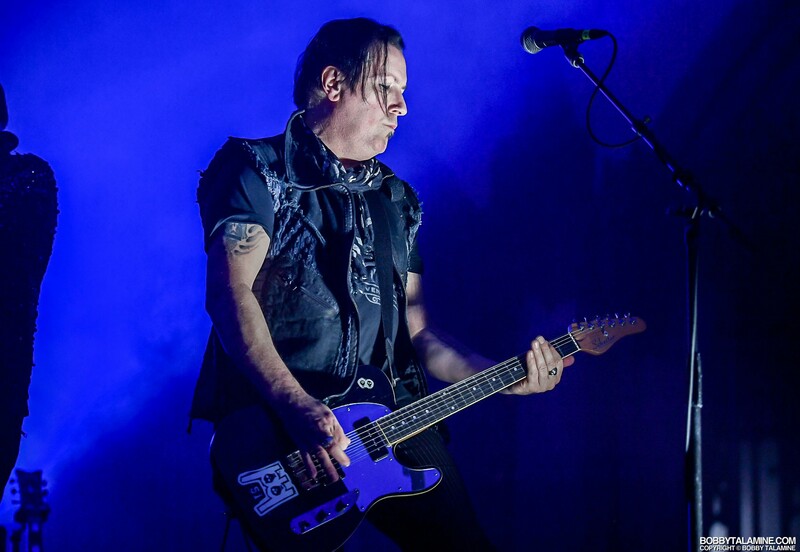 It should be known that when Peter was introducing the band midway through the show, he stated “And on guitar, one of the best guitarists in the world- Mark Gemini Thwaite”, and well let’s just say that he is absolutely correct in that judgement. 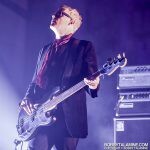 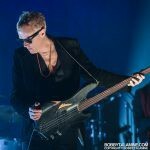 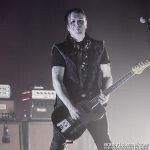 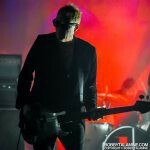 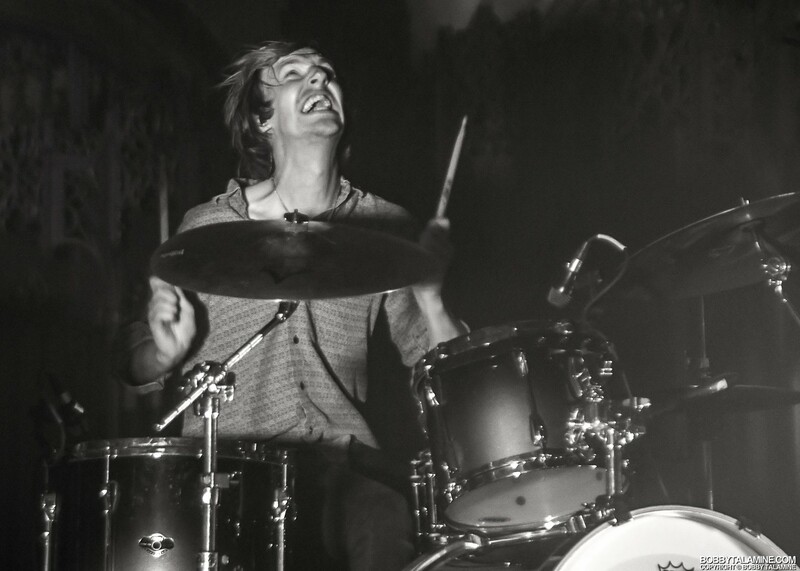 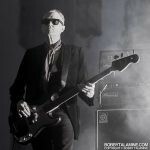 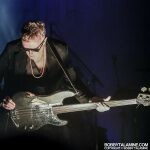 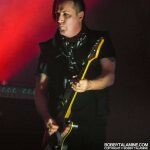 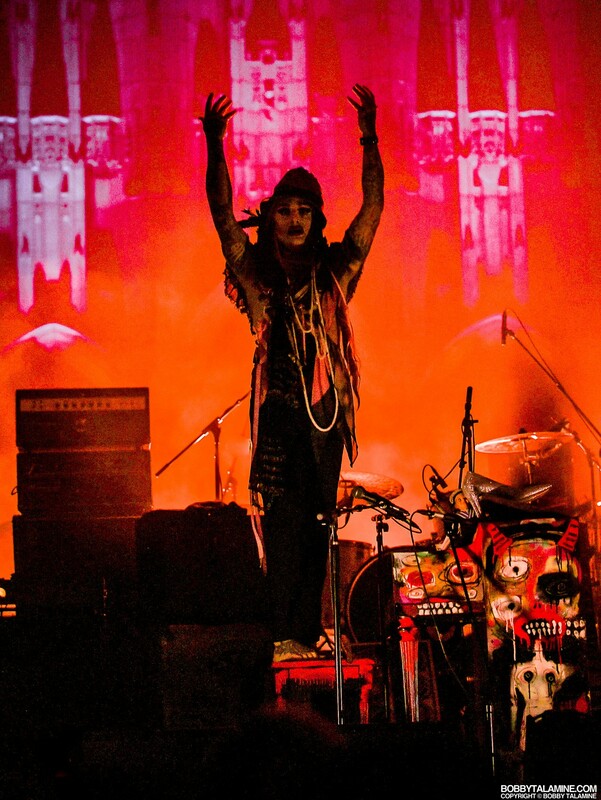 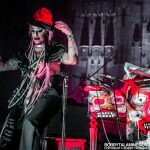 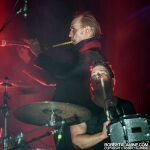 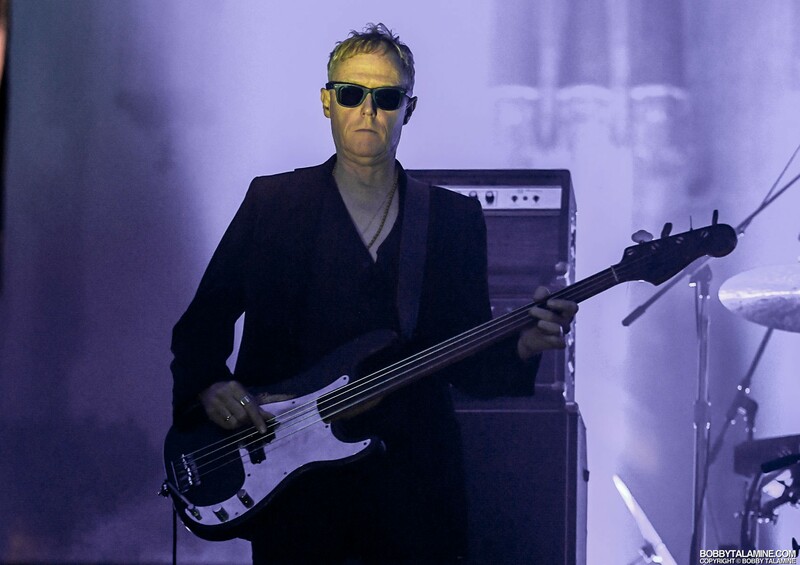 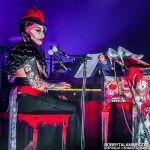 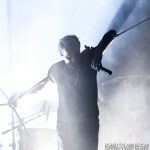 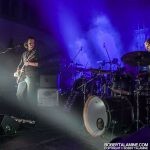 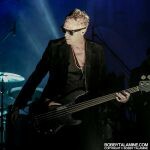 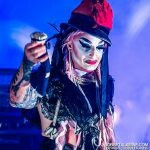 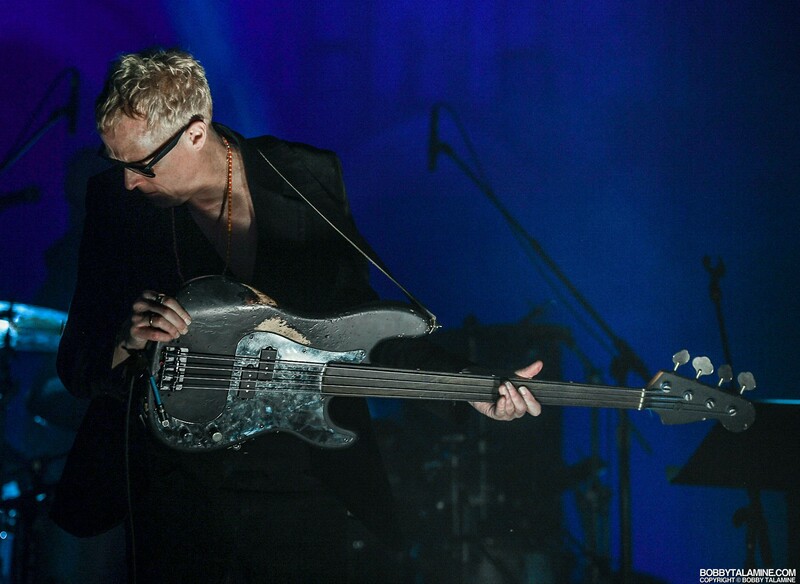 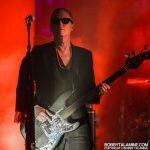 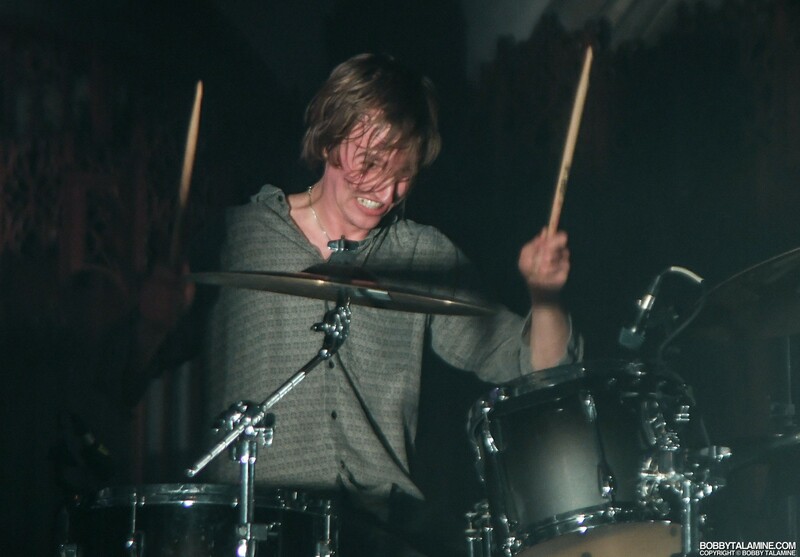 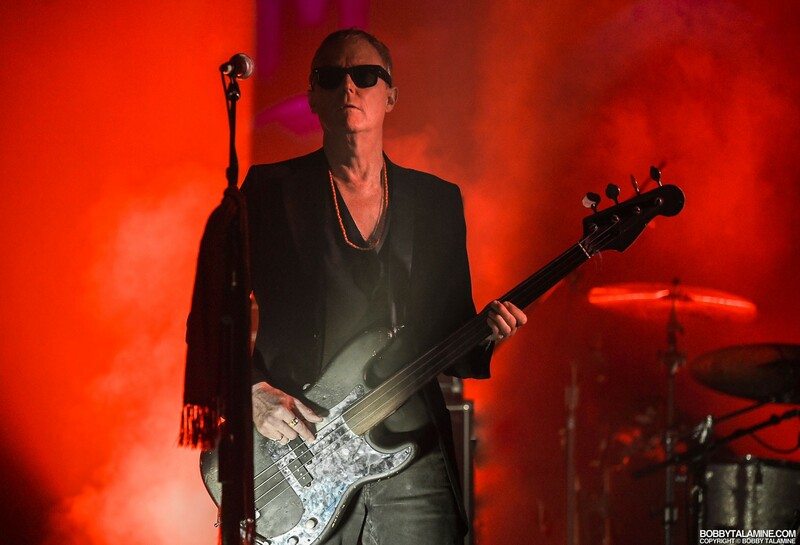 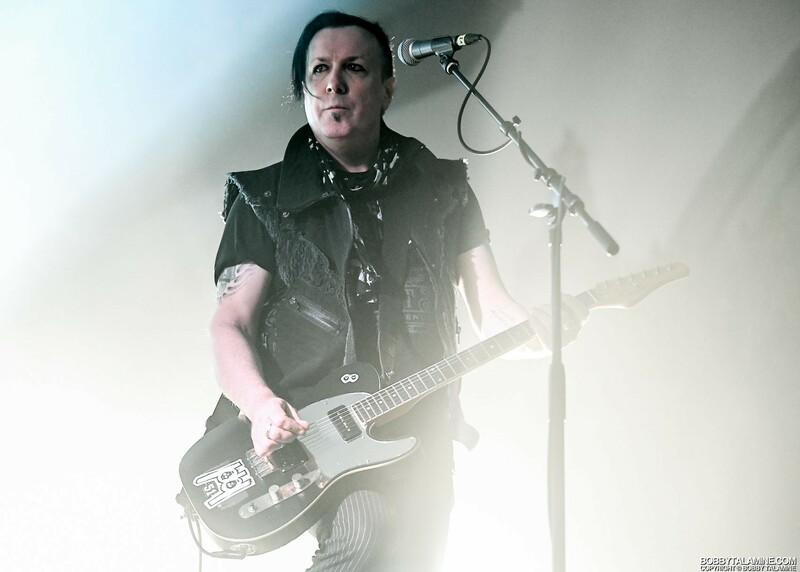 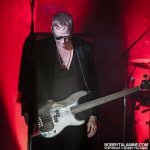 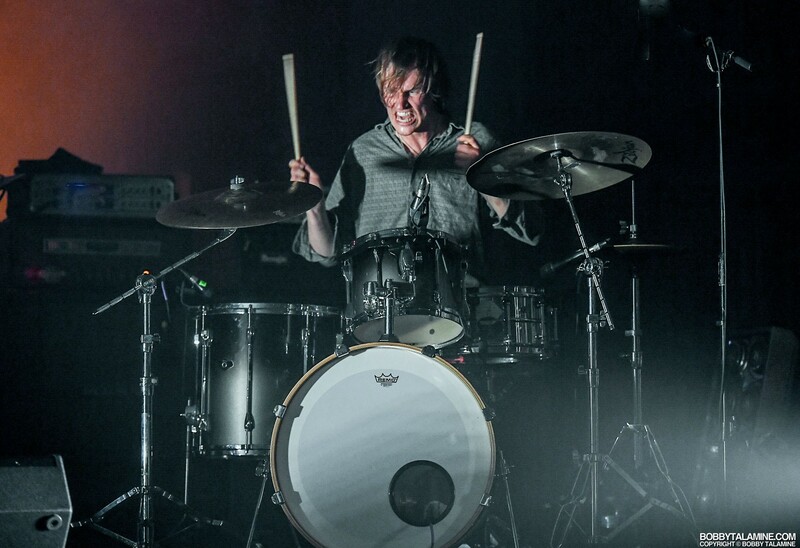 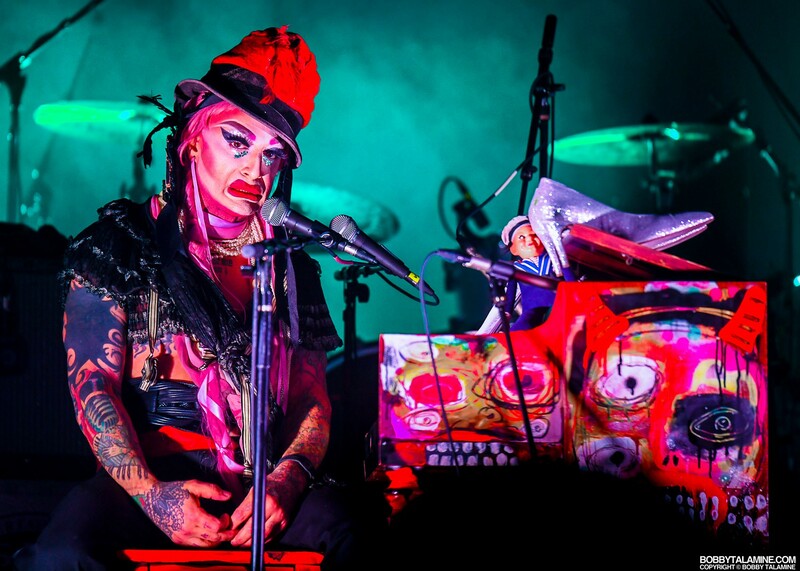 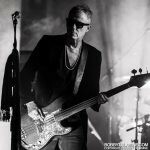 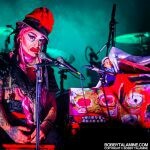 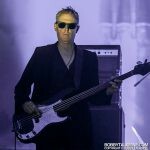 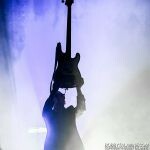 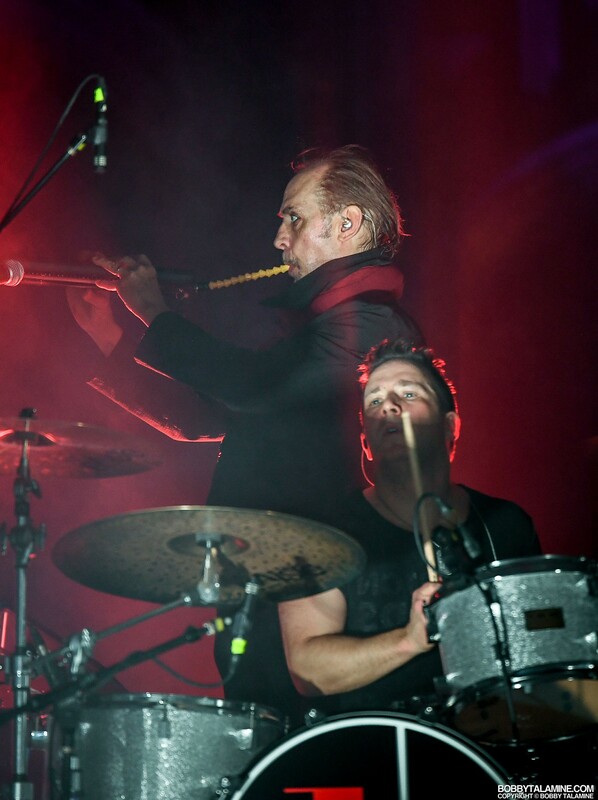 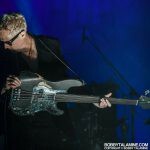 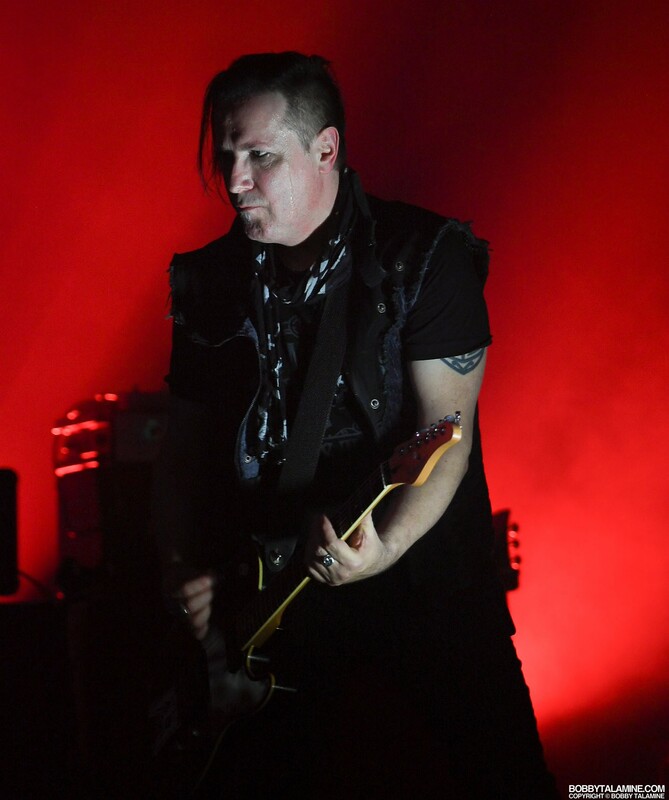 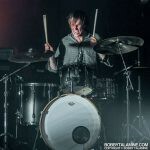 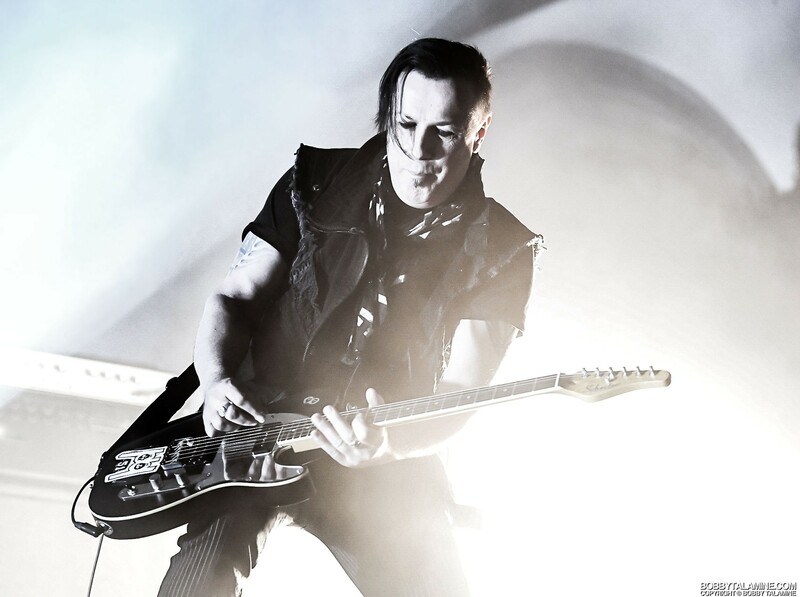 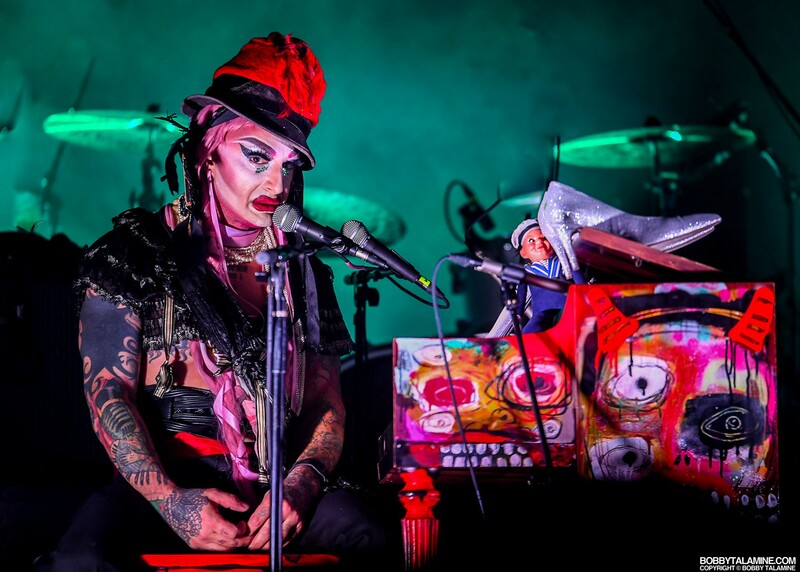 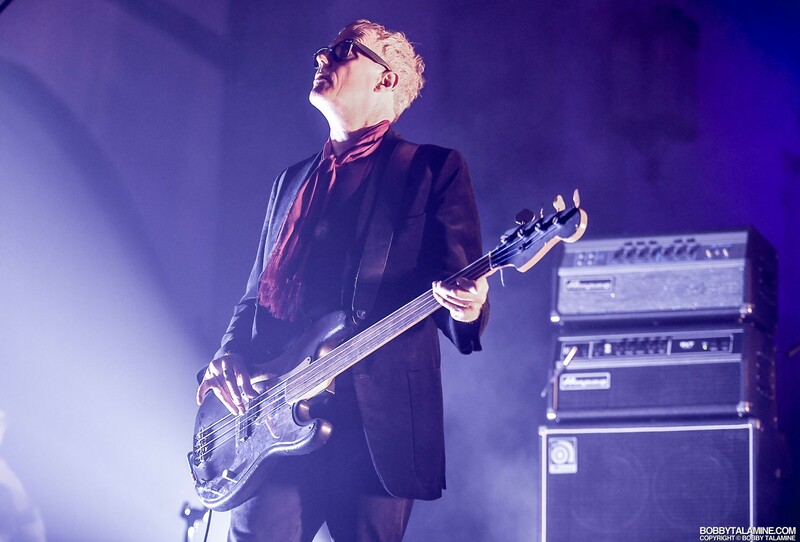 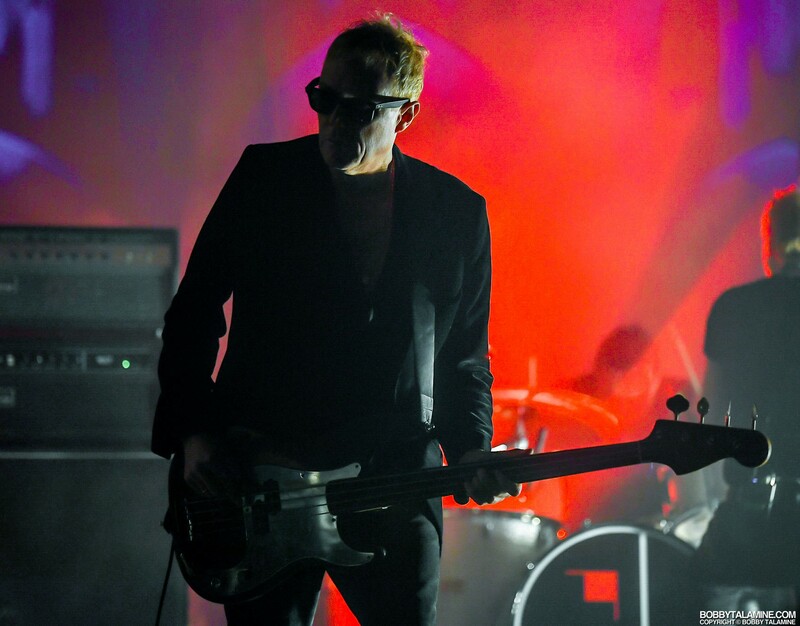 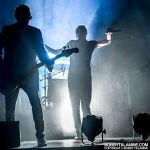 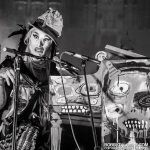 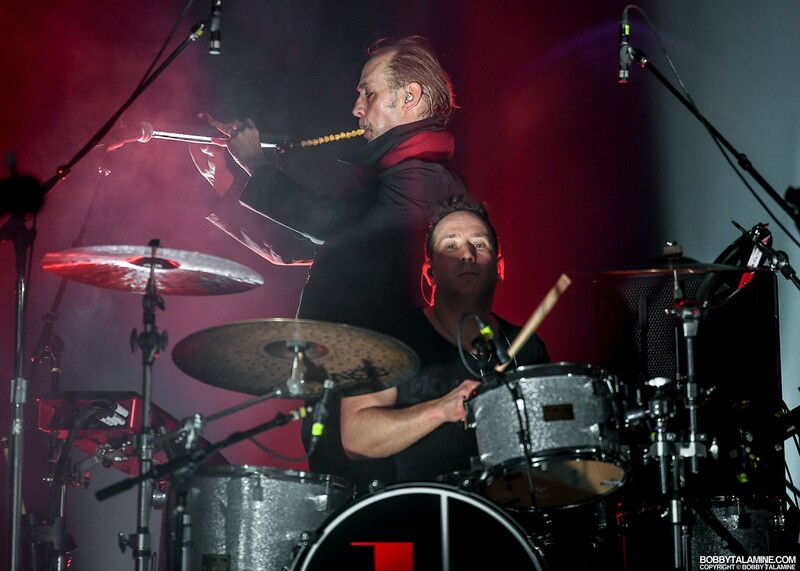 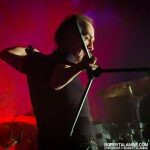 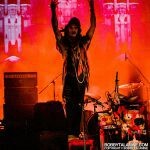 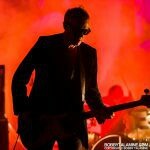 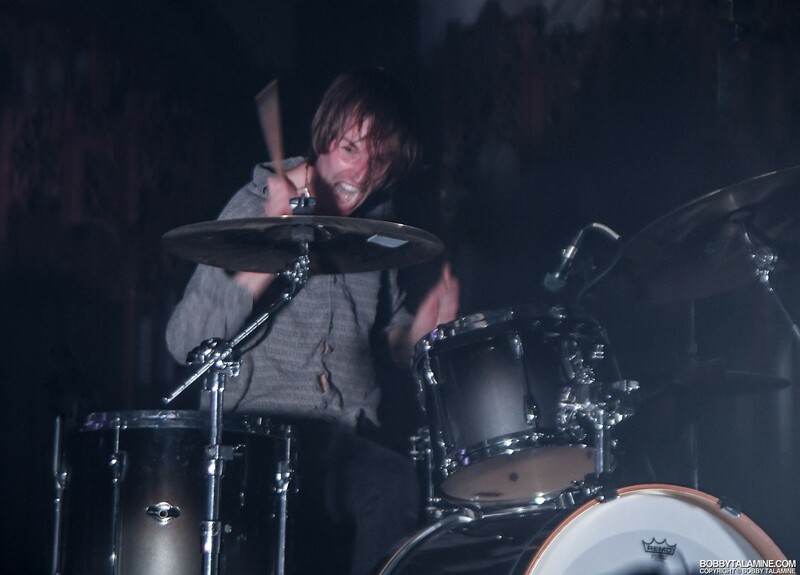 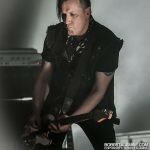 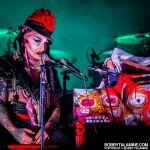 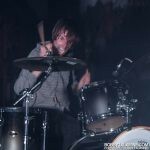 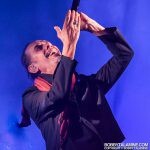 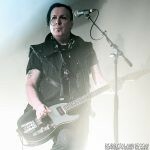 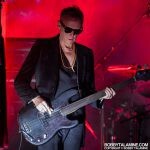 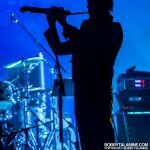 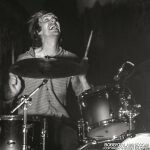 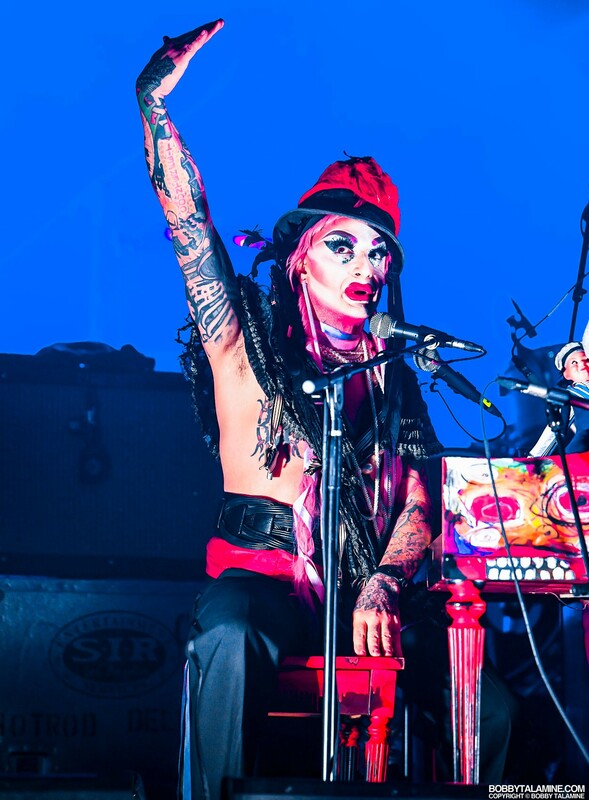 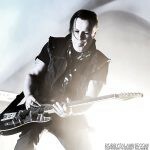 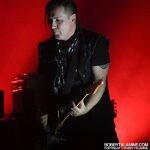 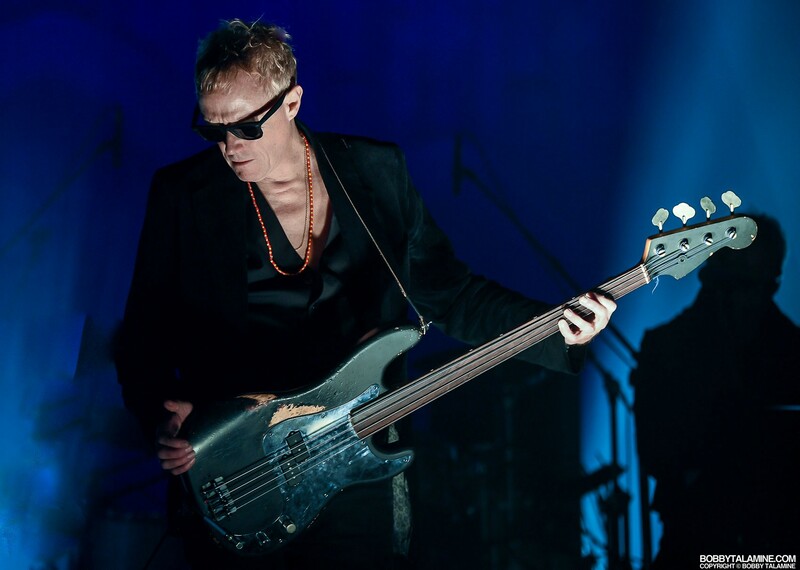 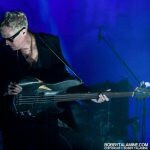 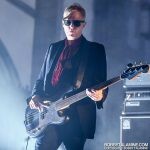 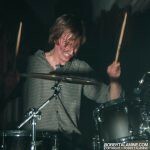 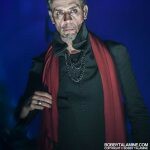 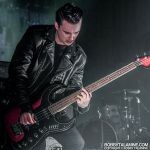 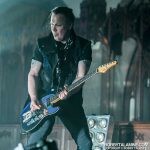 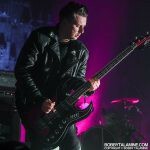 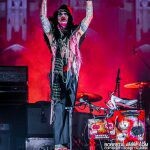 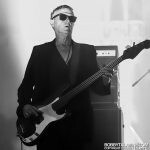 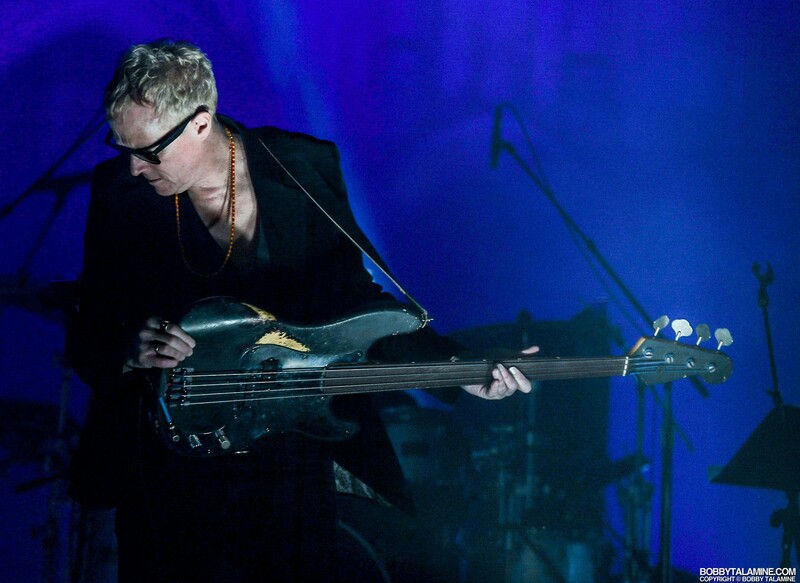 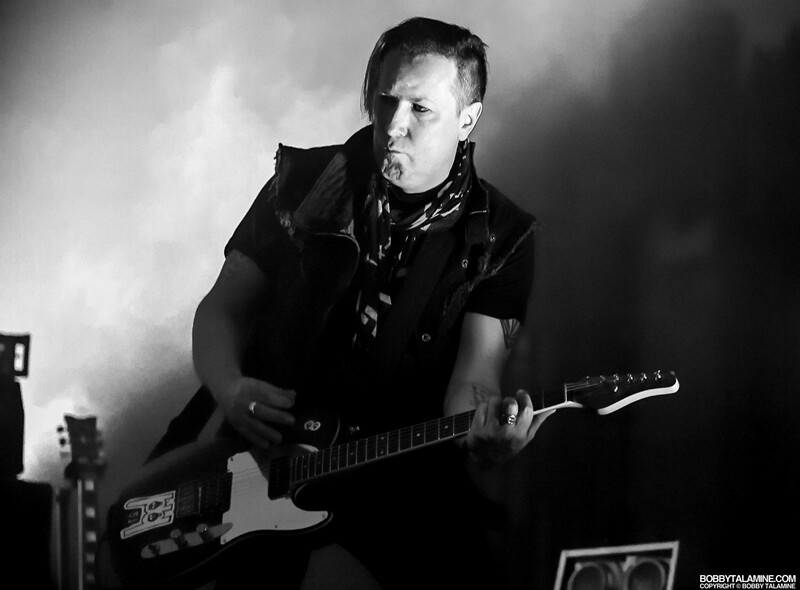 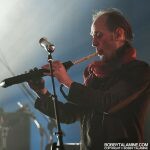 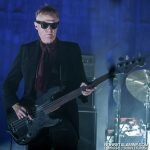 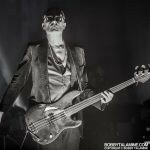 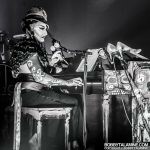 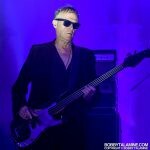 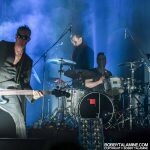 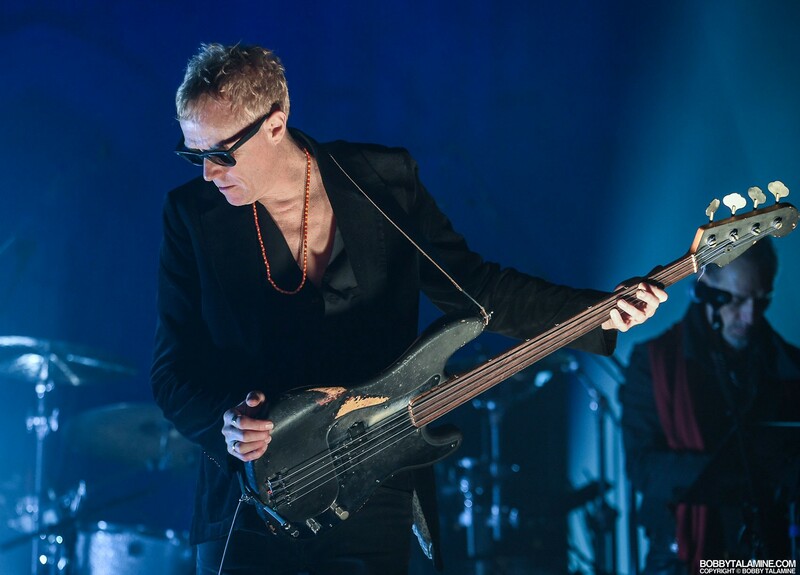 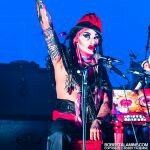 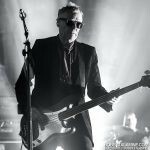 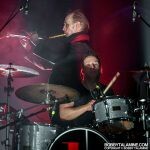 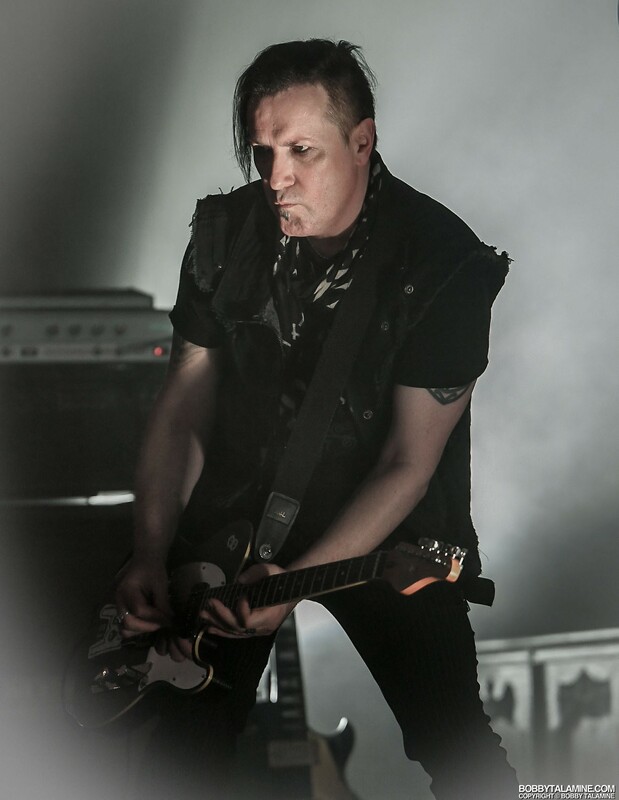 Peter surrounds himself with extraordinary musicians, which is also the case with Marc Slutsky on drums, who definitely provides the necessary backbeat which keeps all Bauhaus music up and running and undeniably intact and on point. 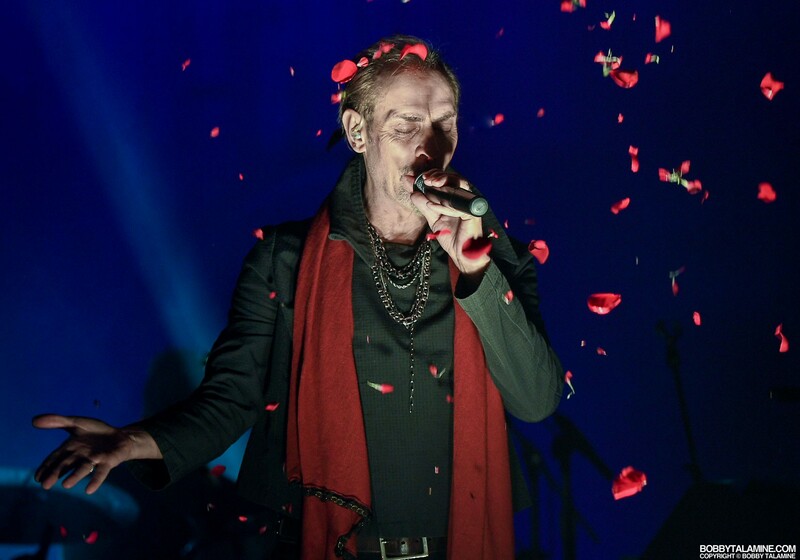 A performance from beginning to end magical in nature, with nothing left to chance both visually, and as well with the audio as well. 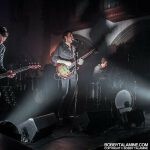 Sophisticated and vintage venue oozing with warmth and soul, equalled with a band that makes this evening most memorable and unforgettable. 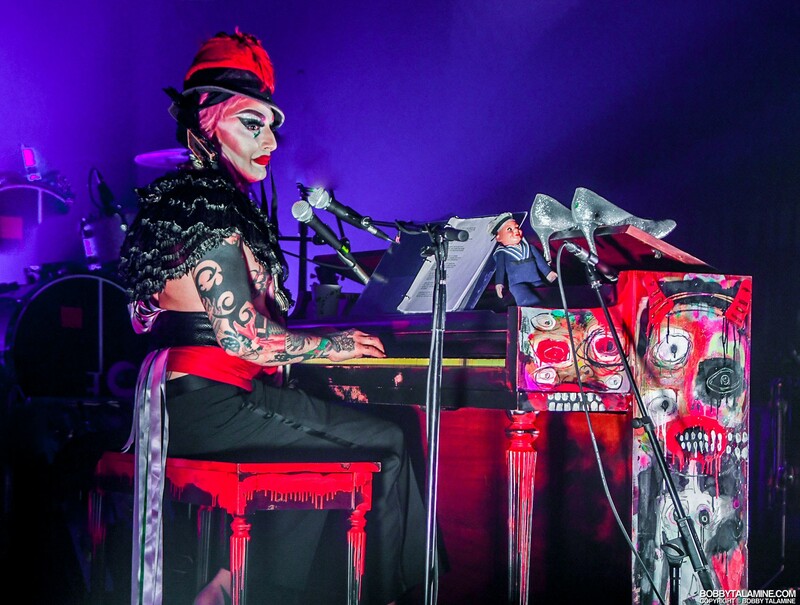 Words like sinister, suave, sophisticated, spellbound, are worthy for placement in this review. 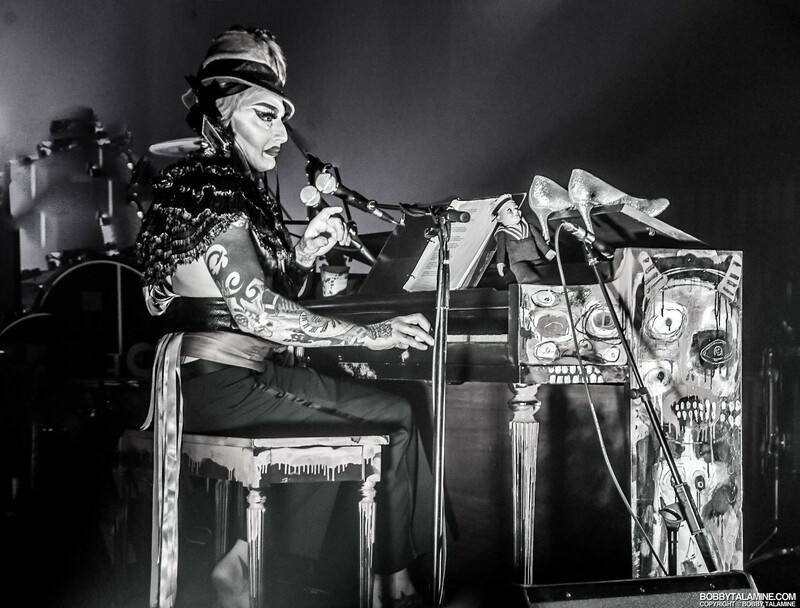 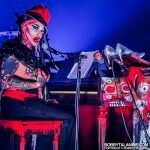 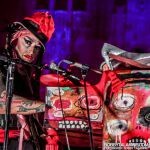 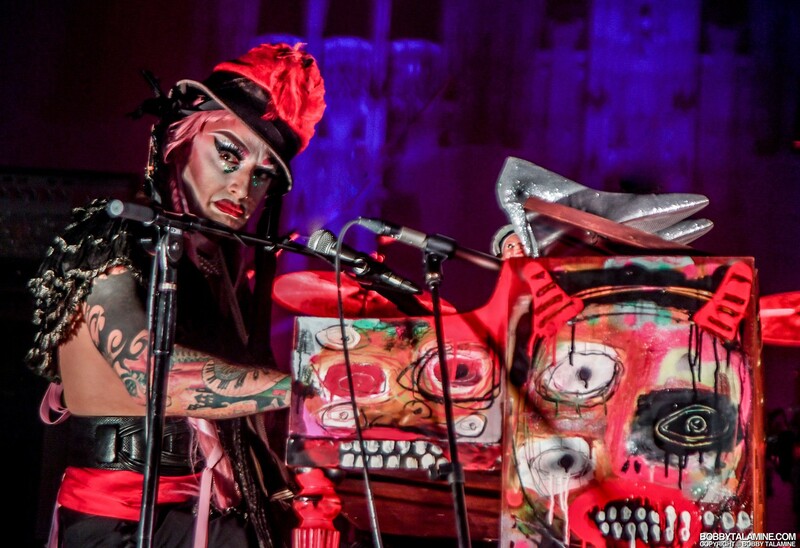 A special night throughout, with thoughtful and compelling music from openers Desert Mountiain Tribe, along with wicked cabaret from Vinsantos as well. 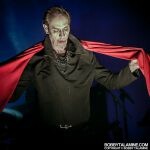 A badass evening with close friends in abundance, with music from Bauhaus featuring Peter Murphy and David J, in a magical gothic cathedral. 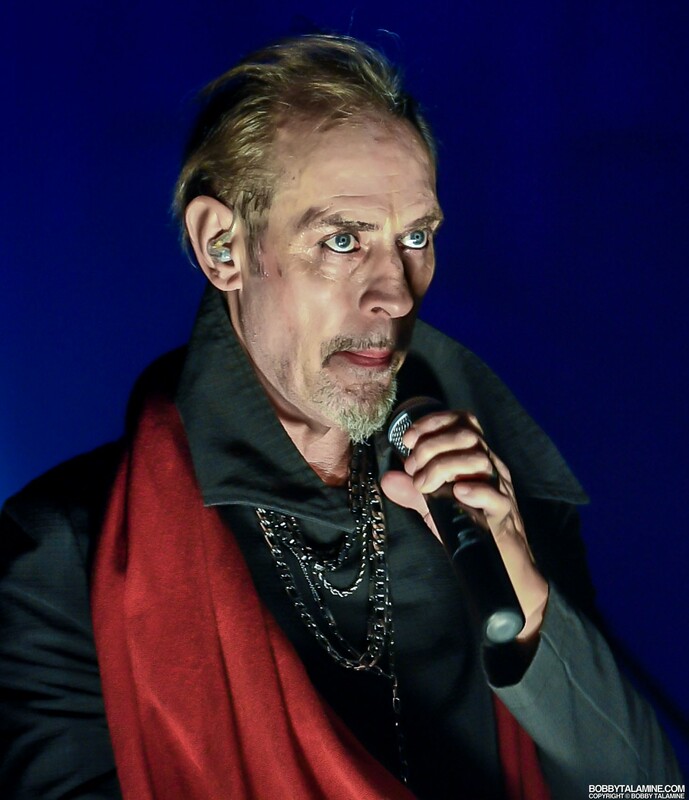 Have to repeat that last line a couple times to let it sink in.